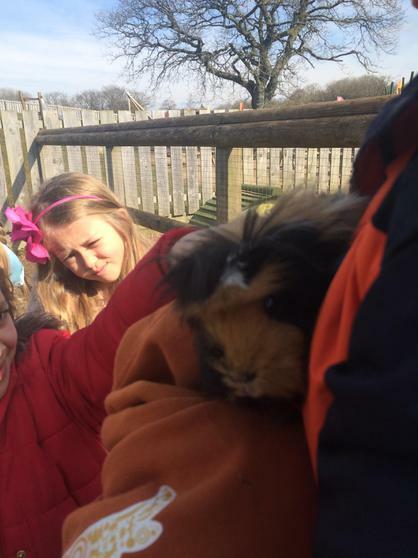 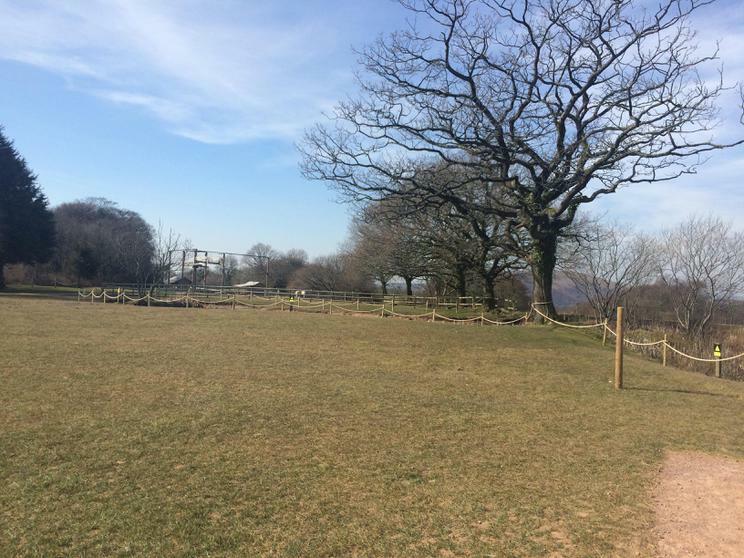 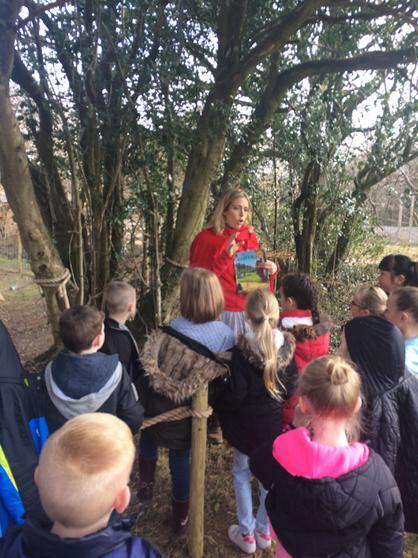 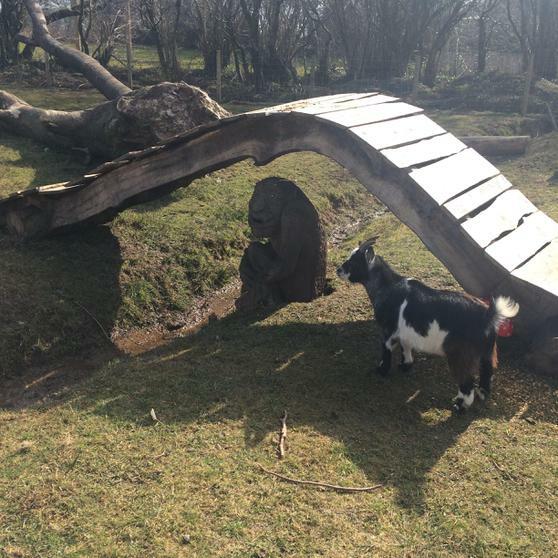 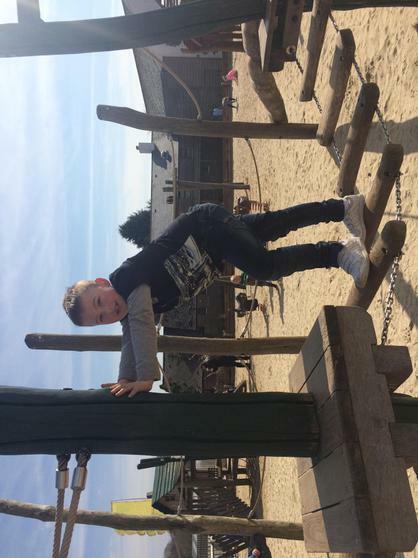 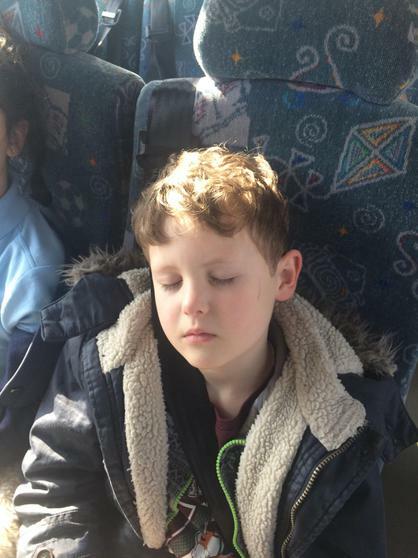 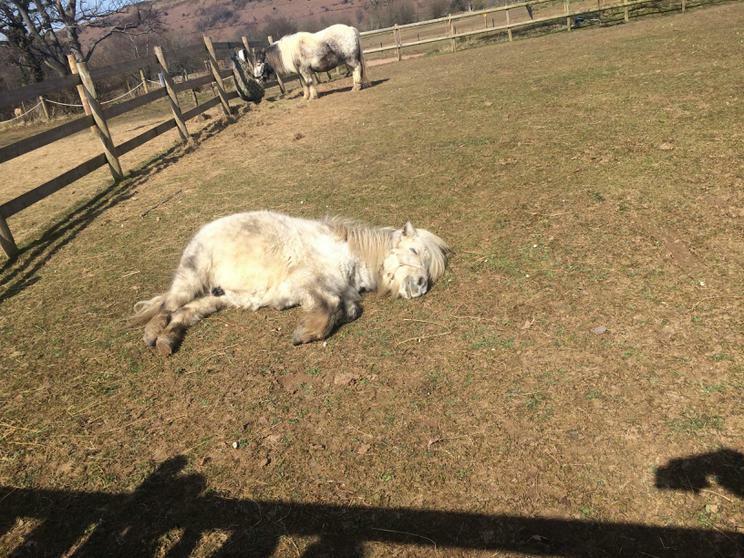 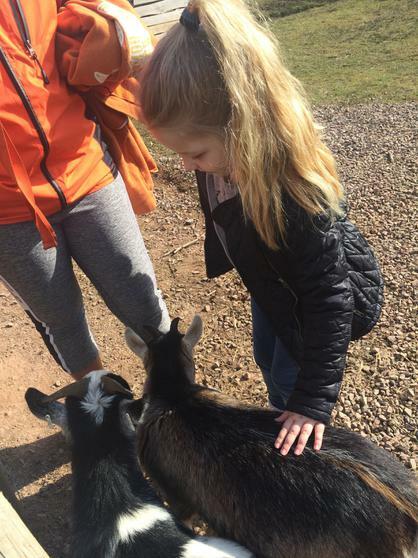 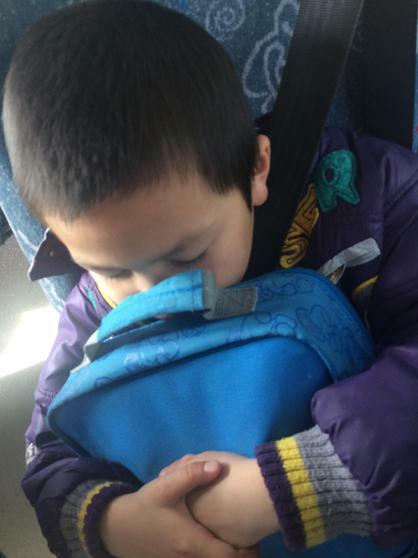 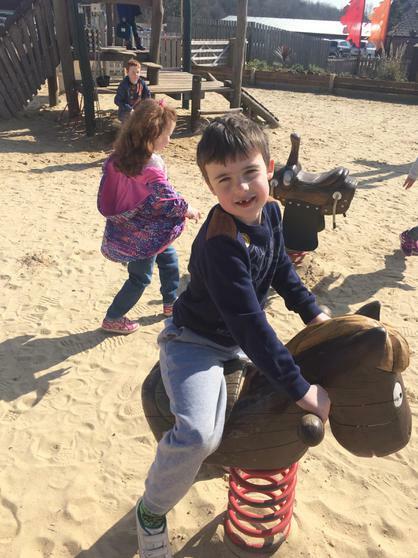 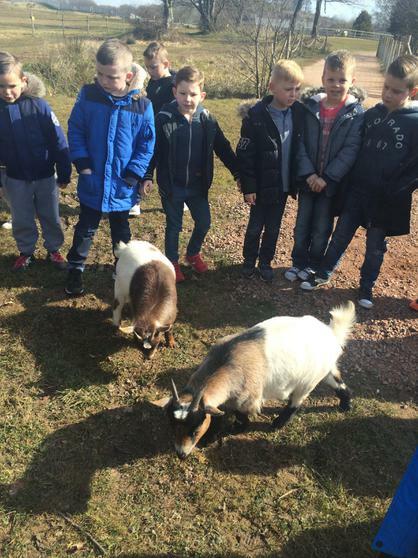 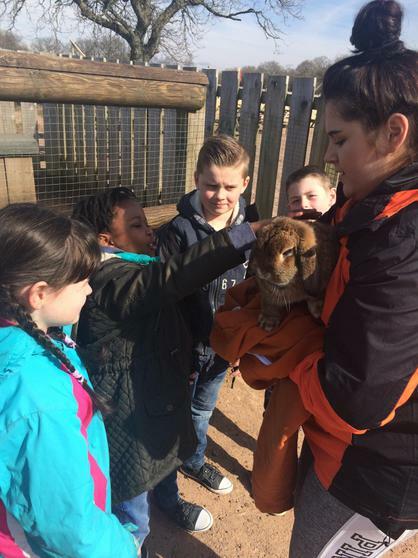 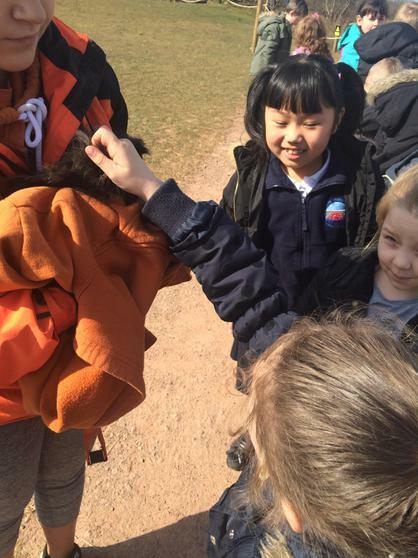 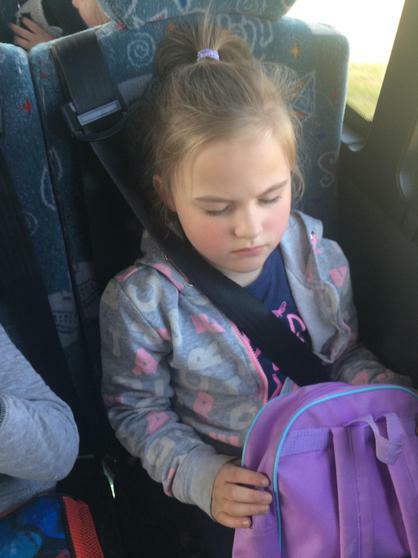 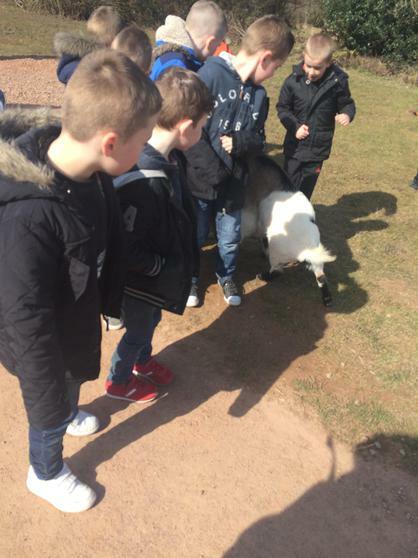 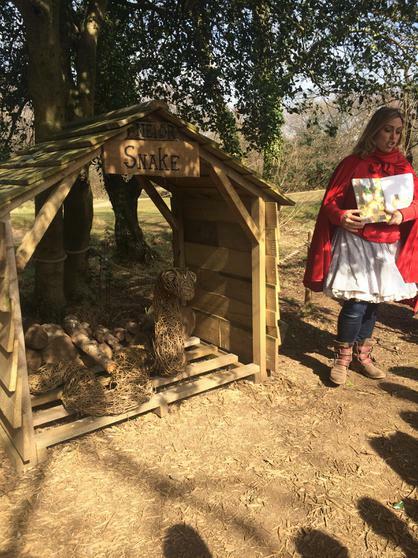 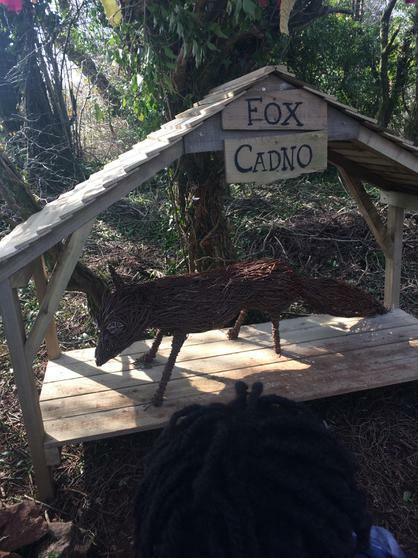 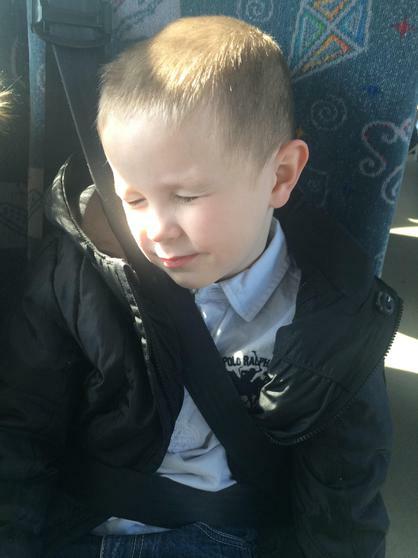 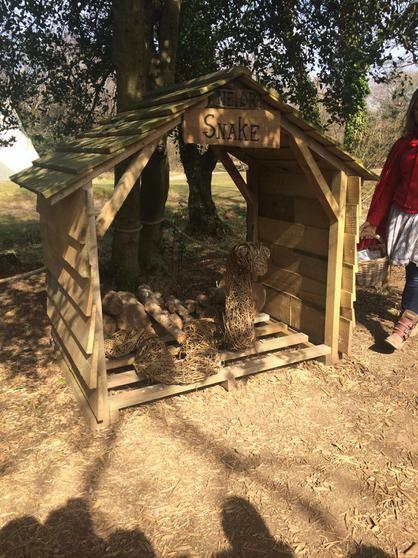 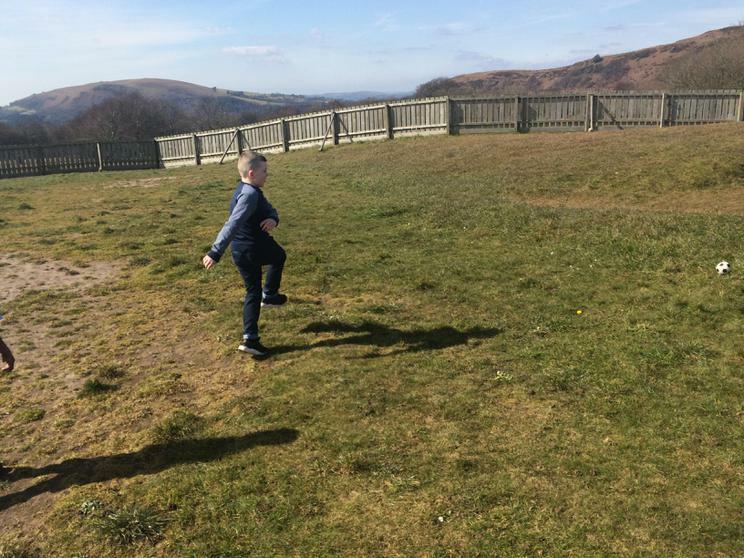 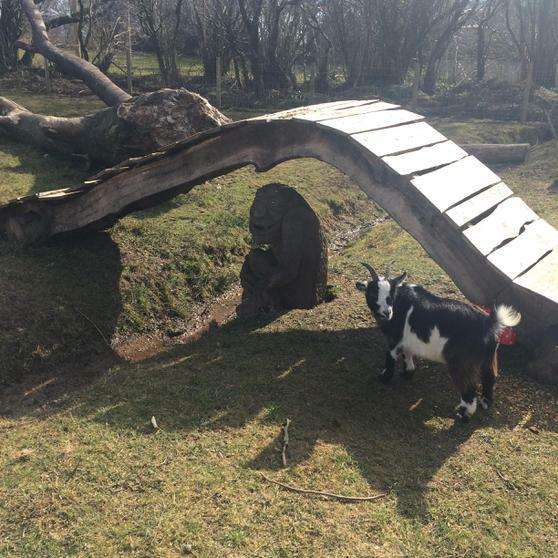 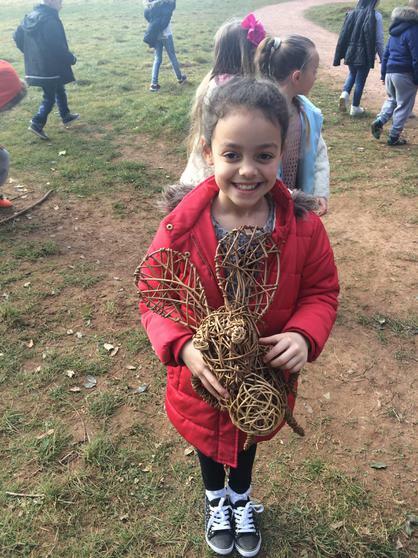 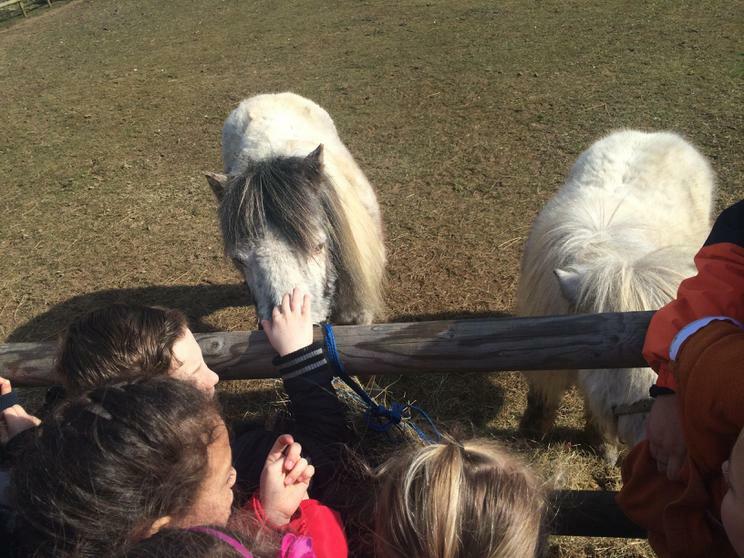 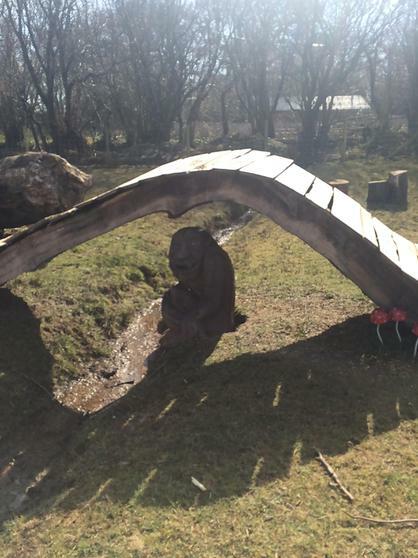 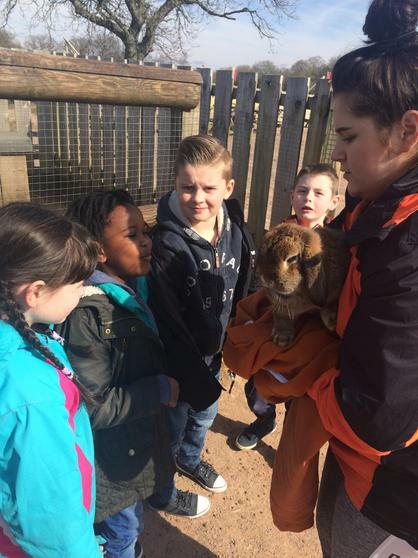 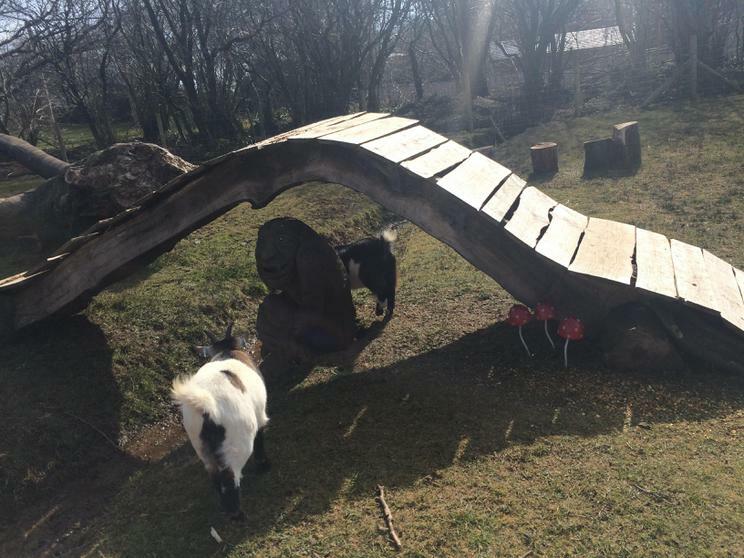 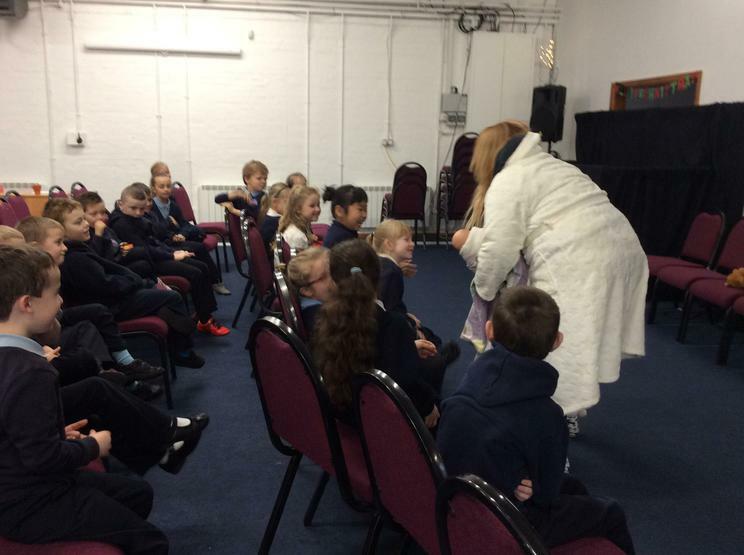 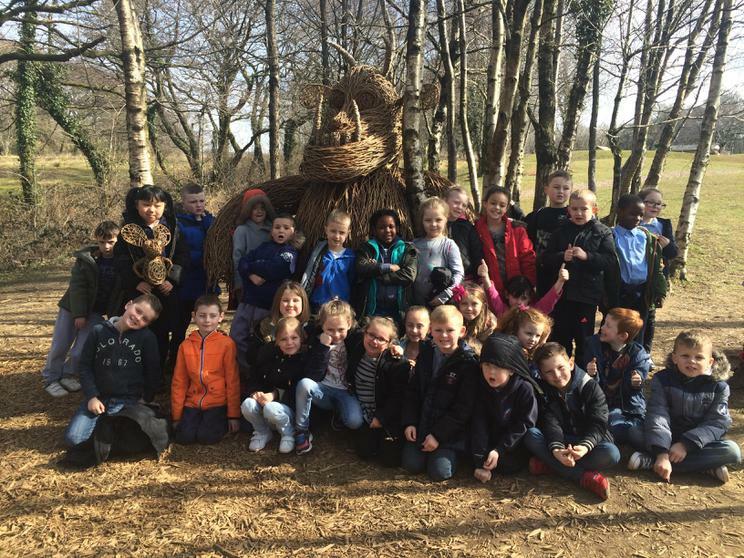 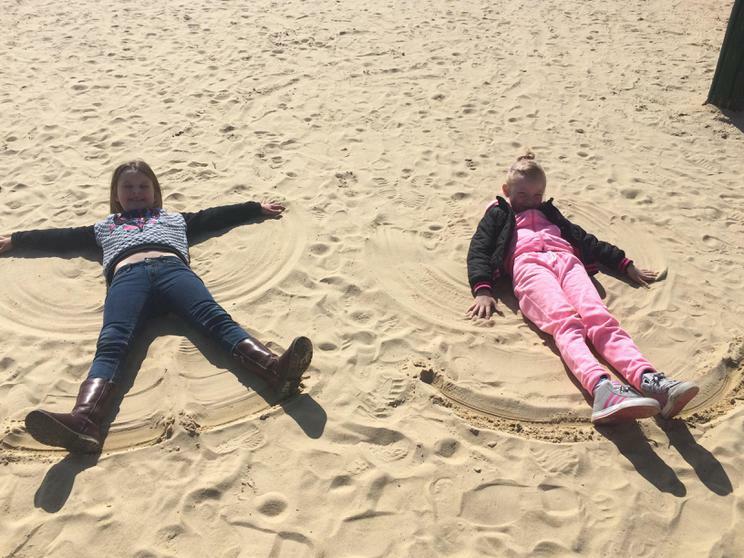 After learning about many fairy tale stories and completing a variety of different work, our class and the year 1 class were given the opportunity to go Mountain View Ranch. 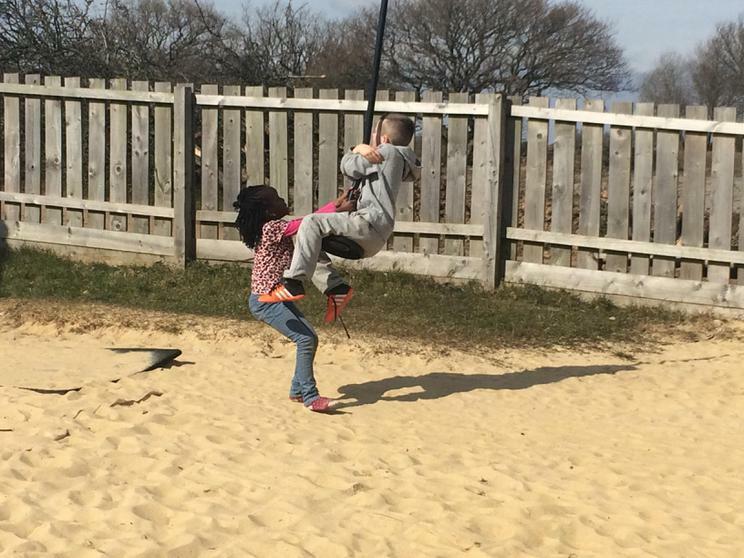 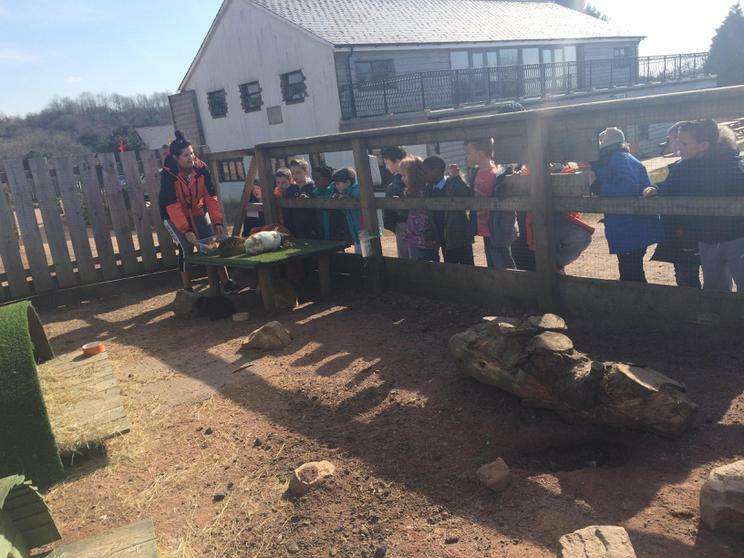 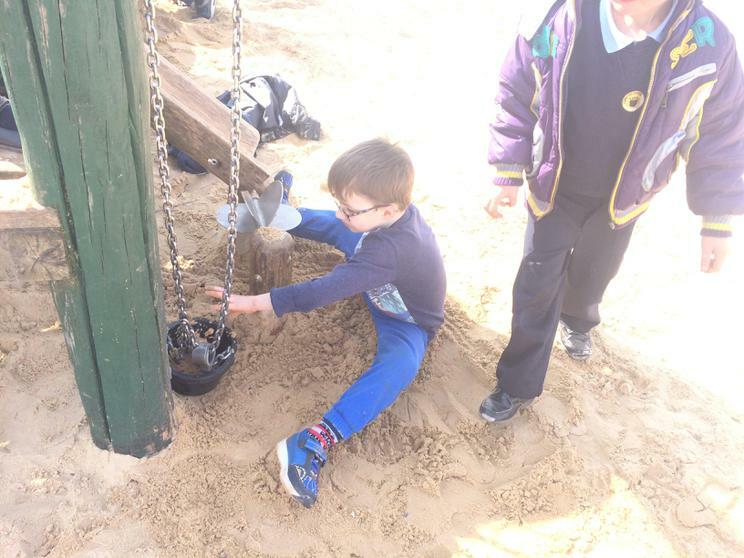 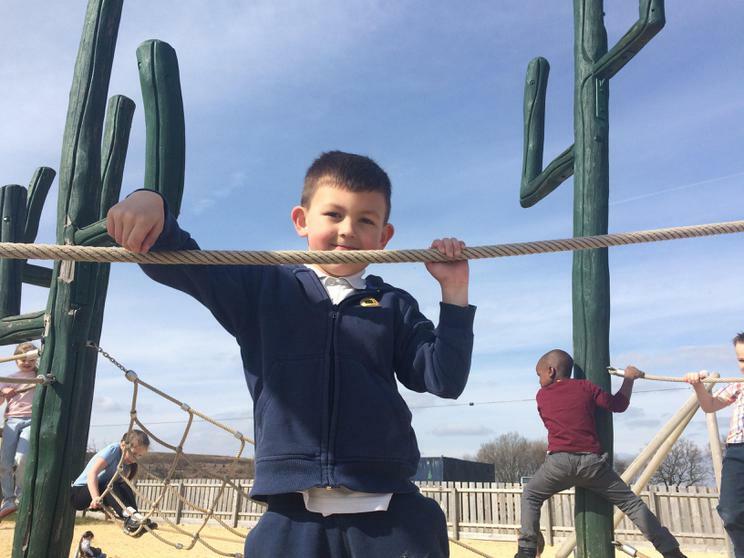 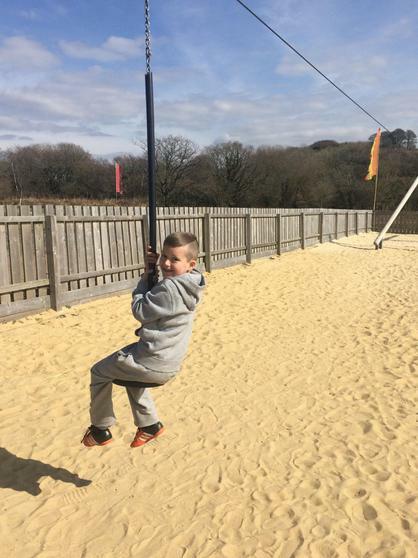 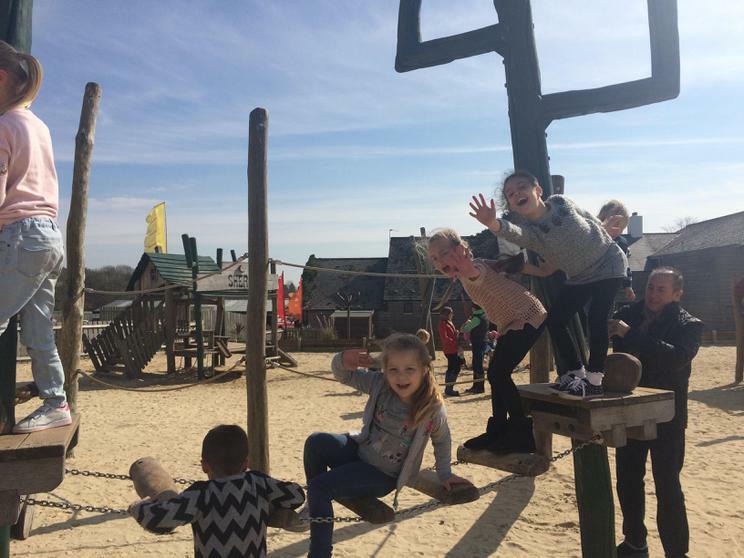 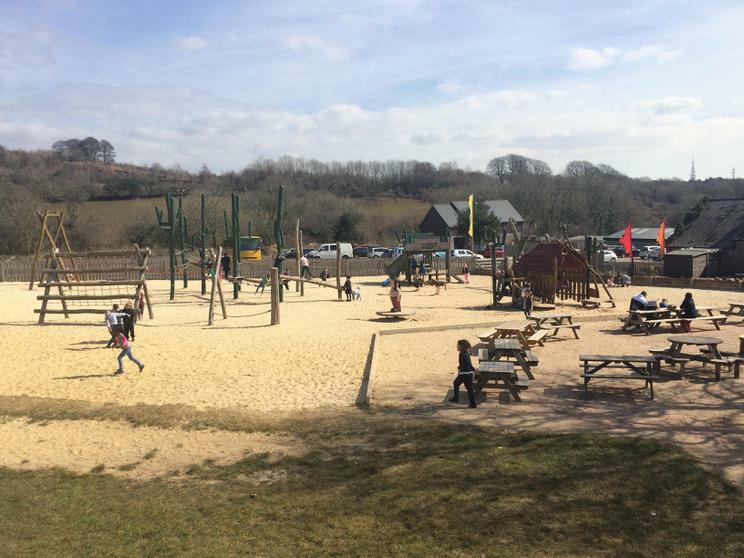 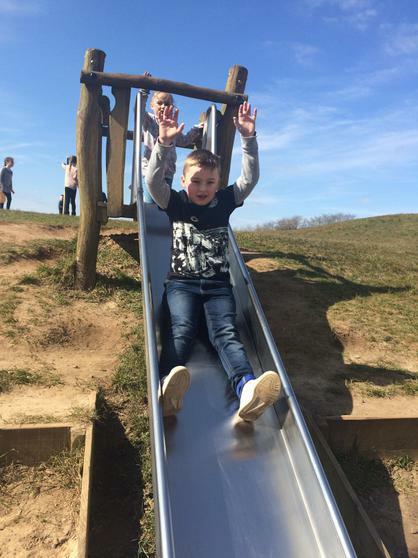 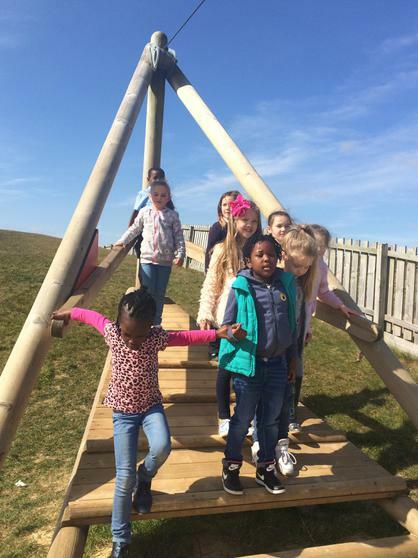 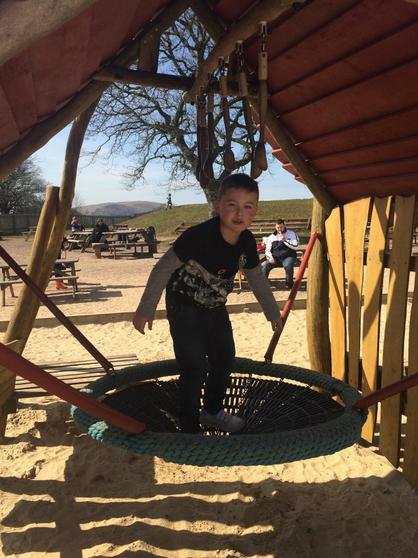 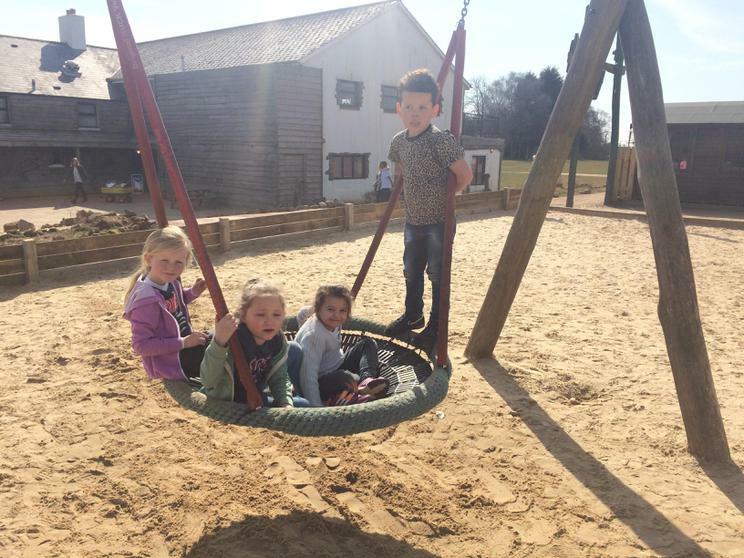 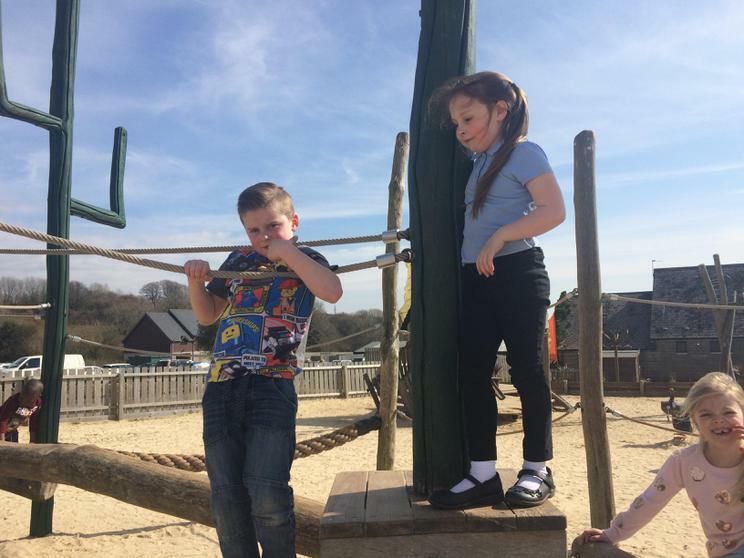 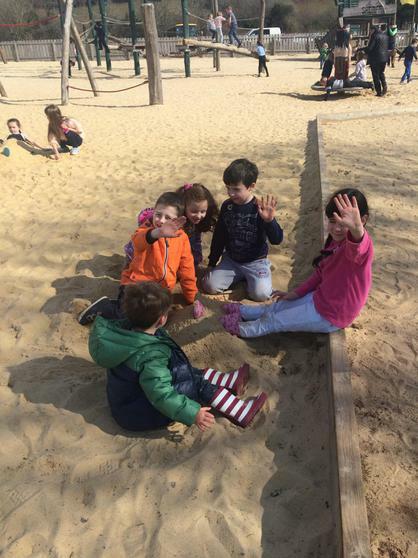 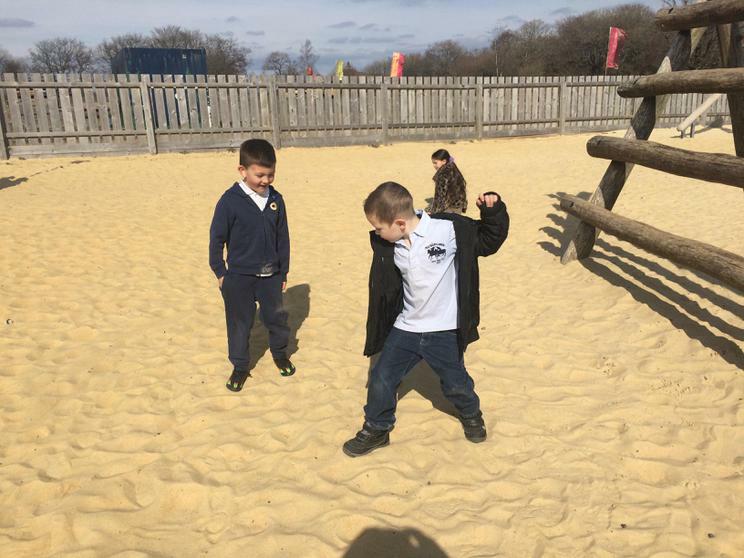 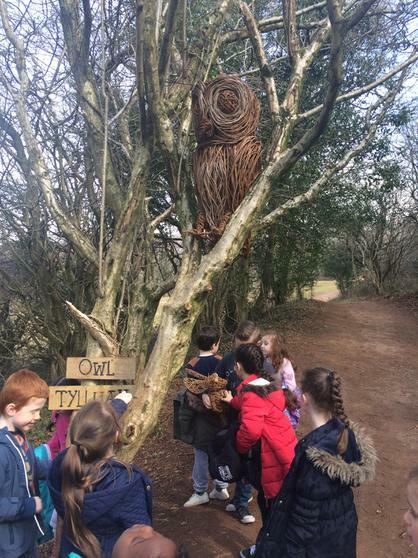 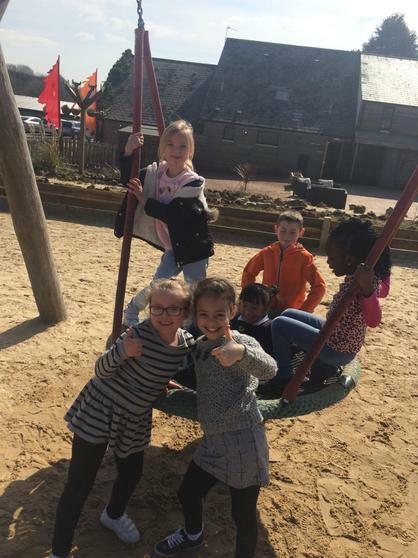 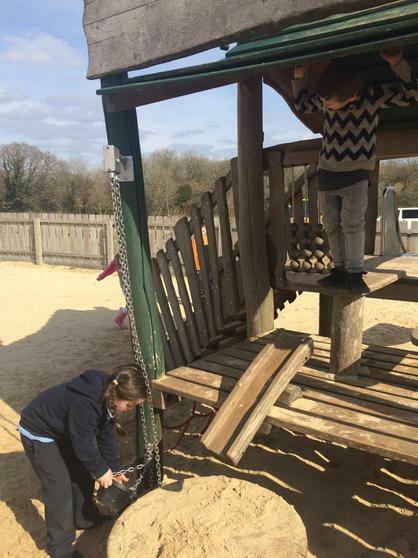 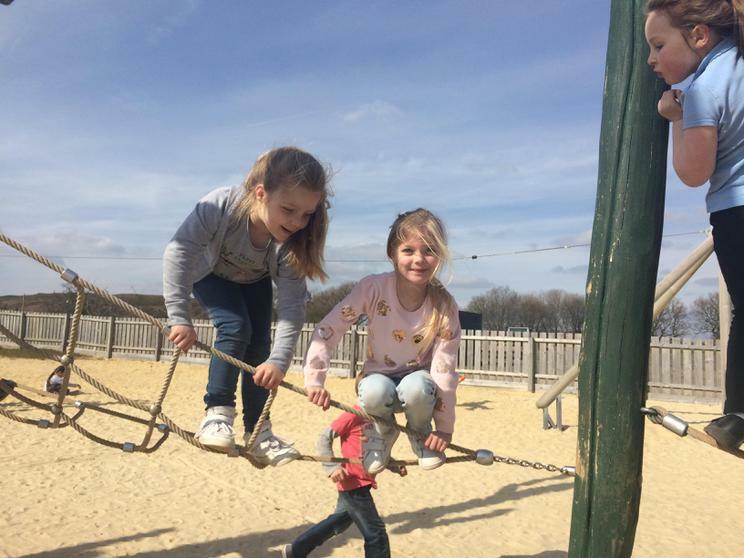 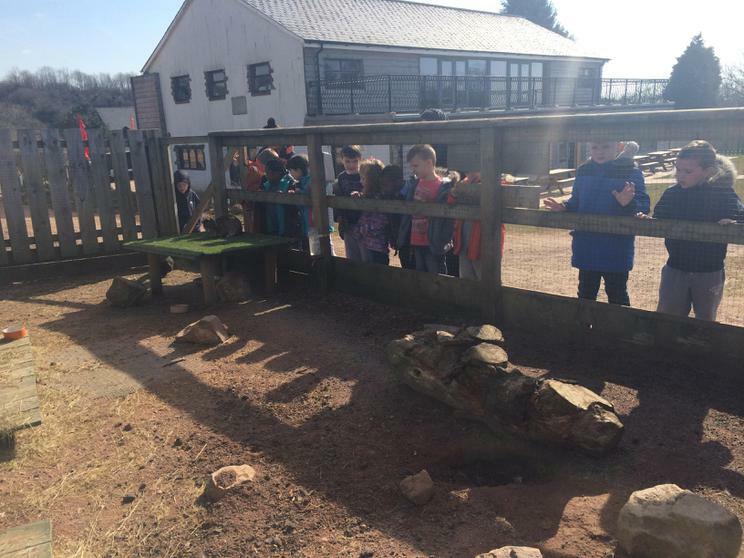 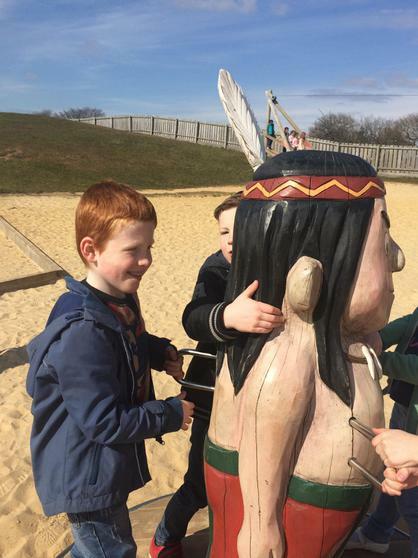 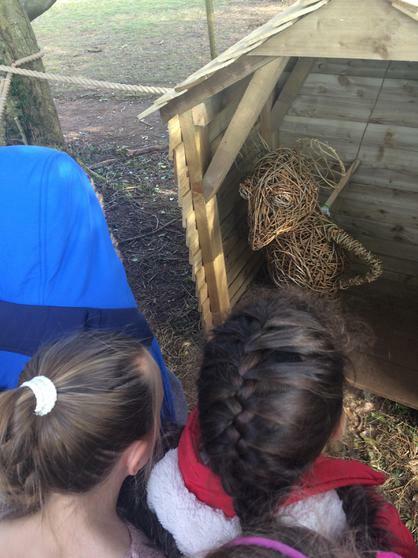 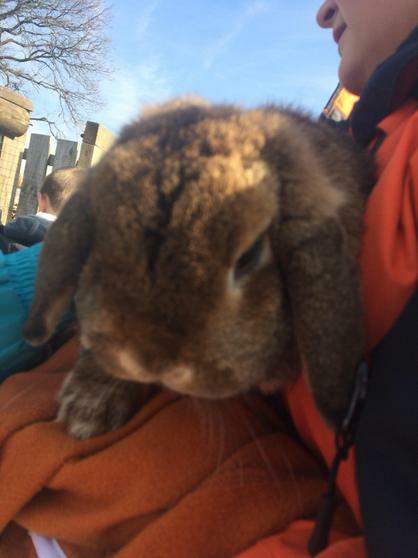 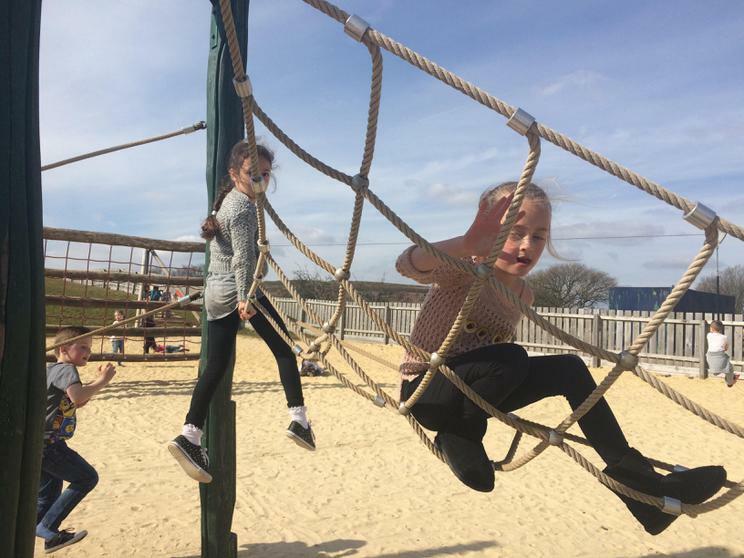 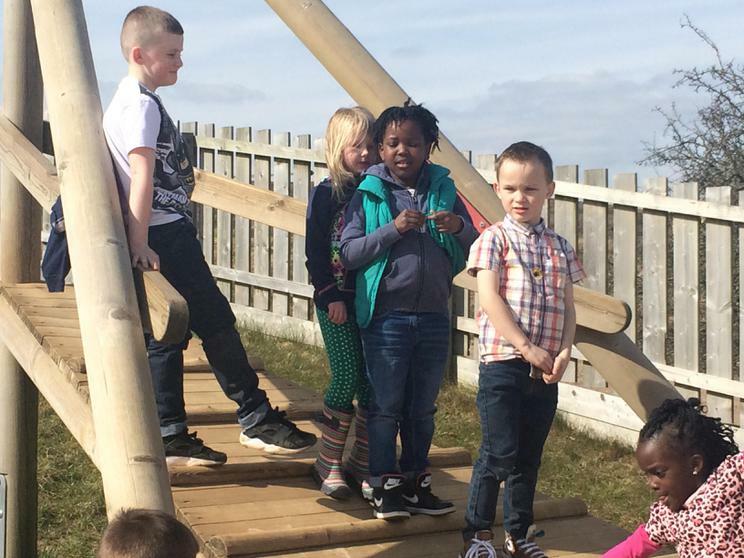 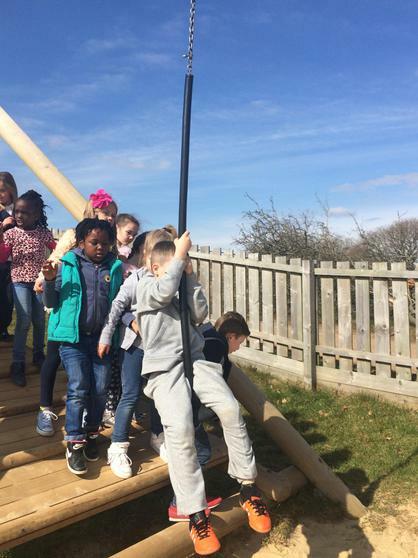 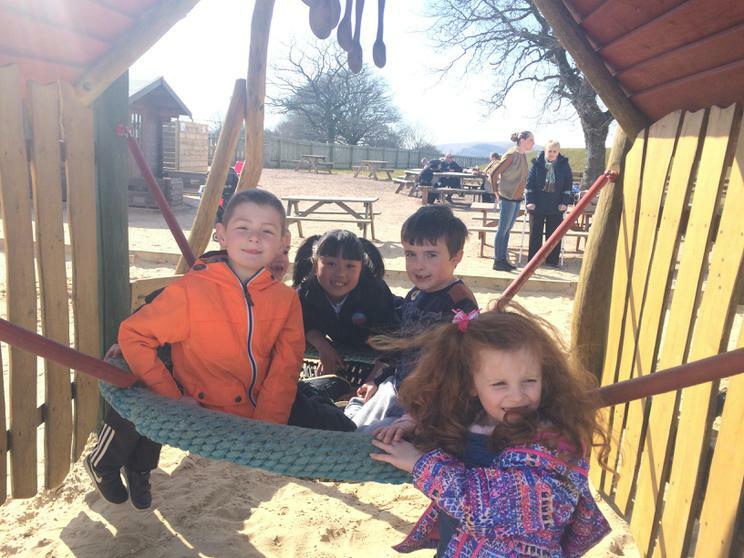 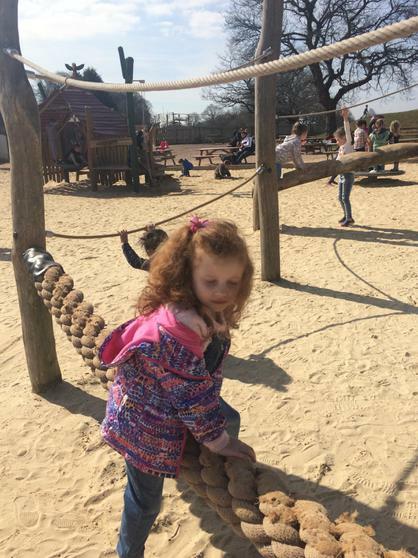 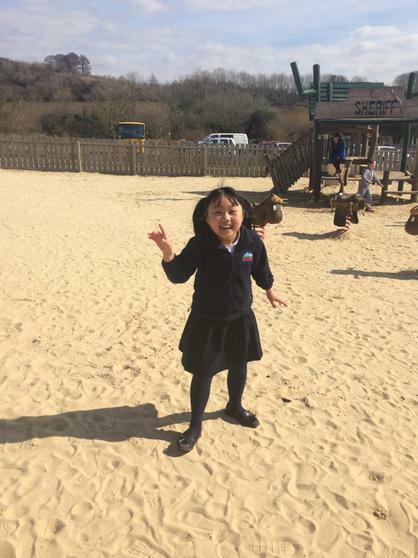 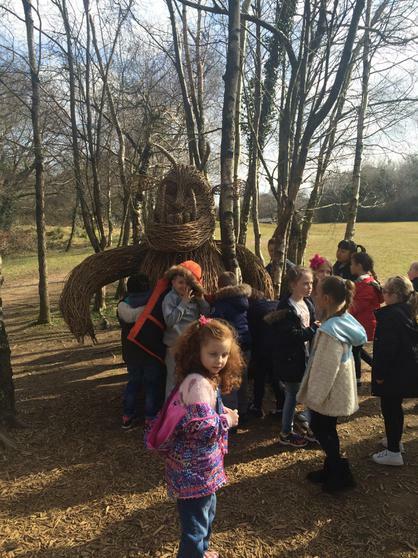 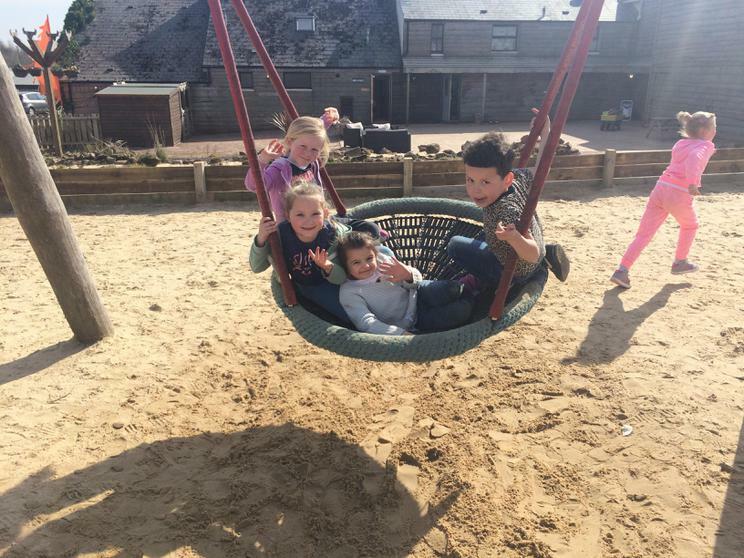 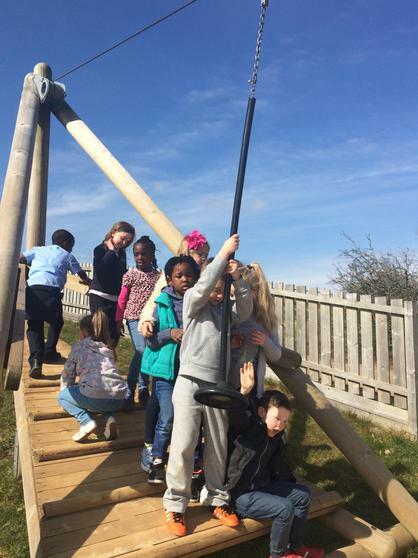 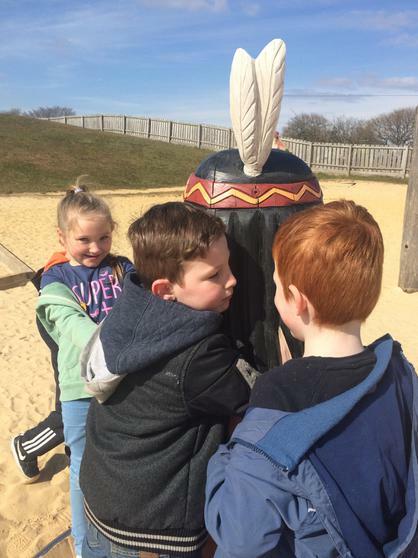 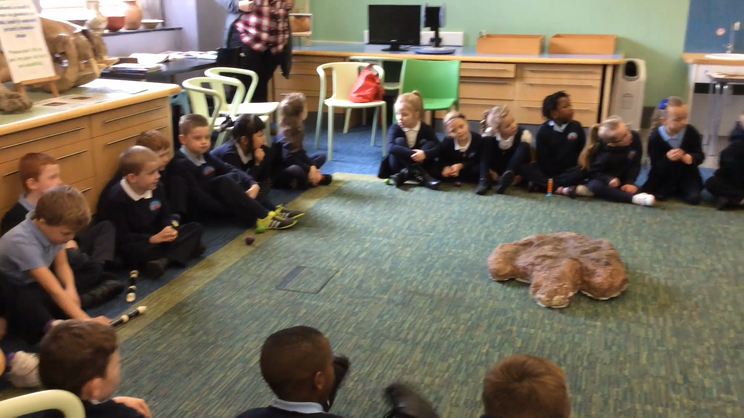 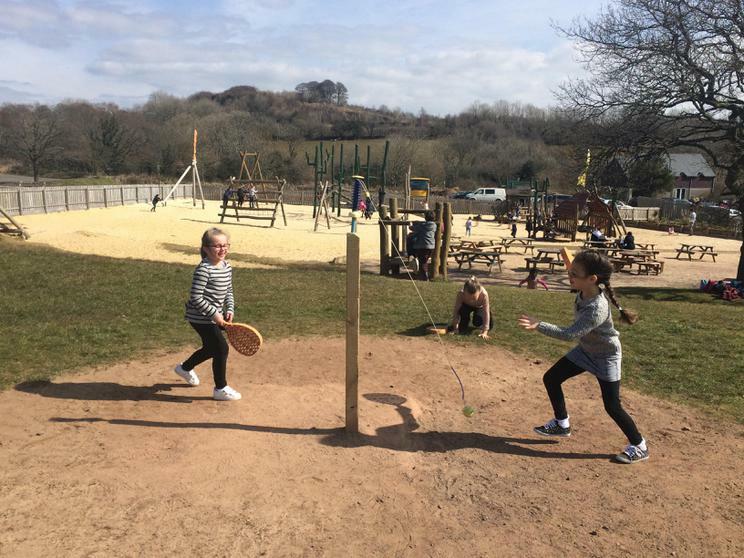 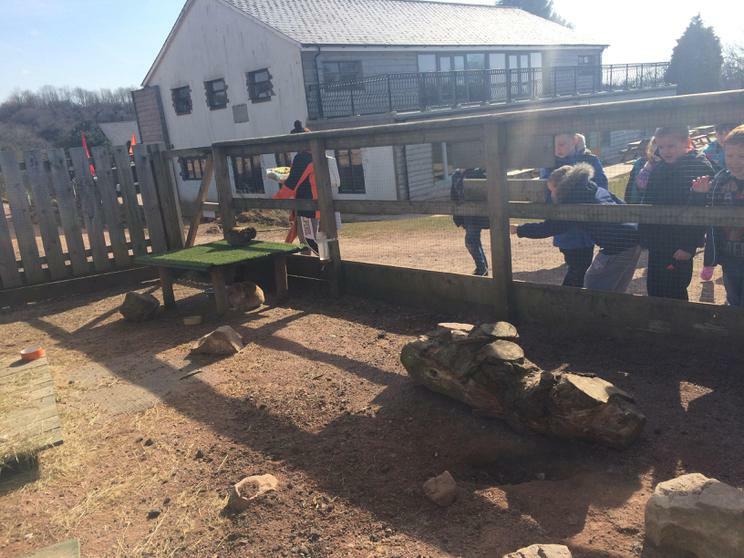 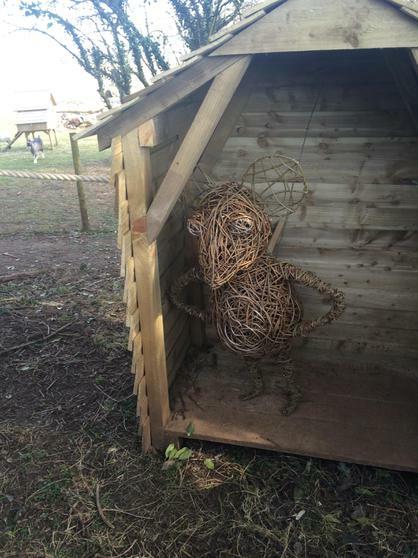 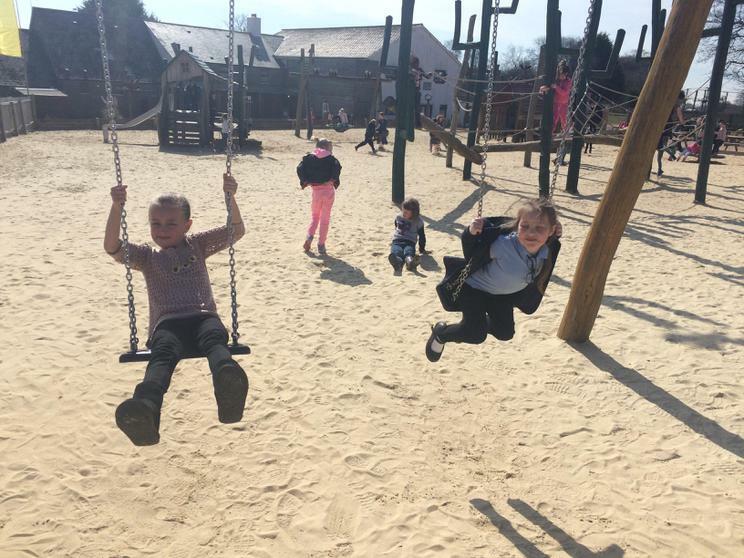 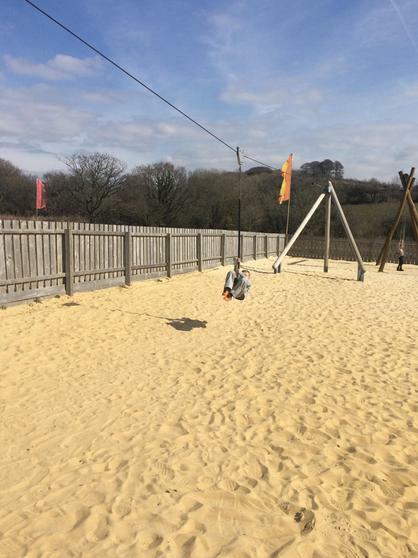 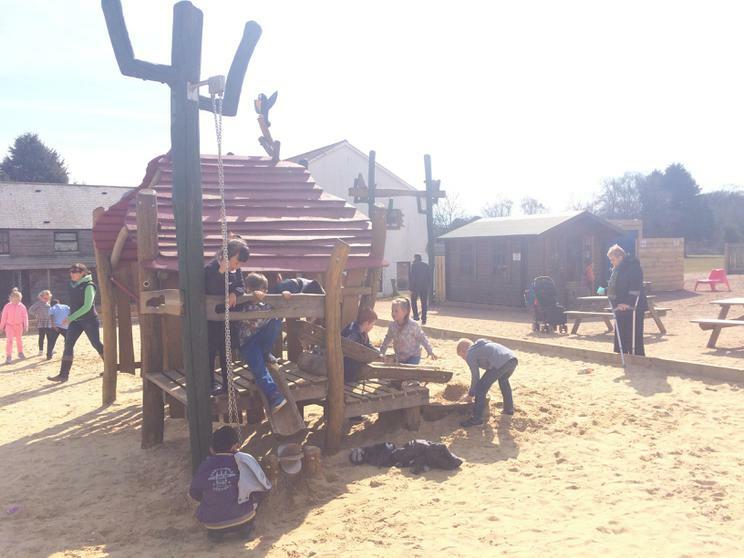 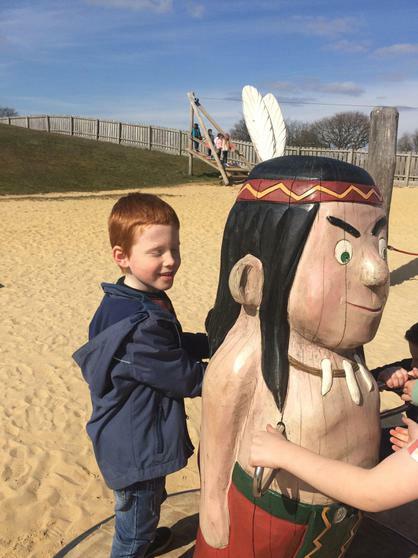 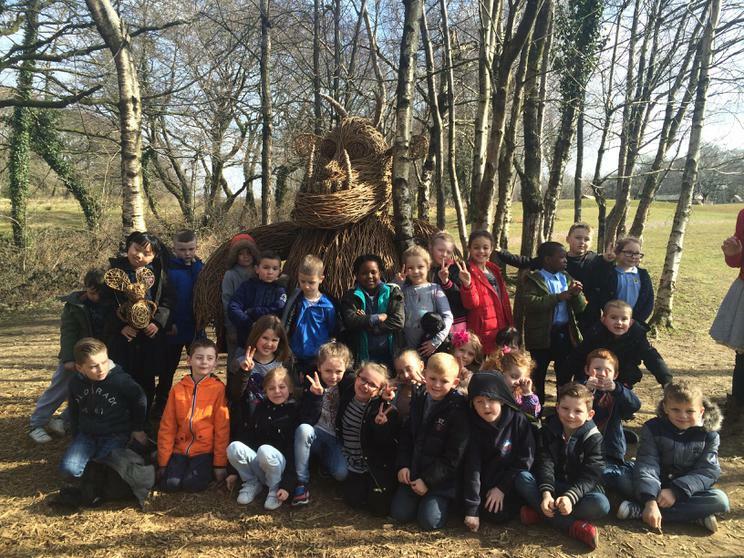 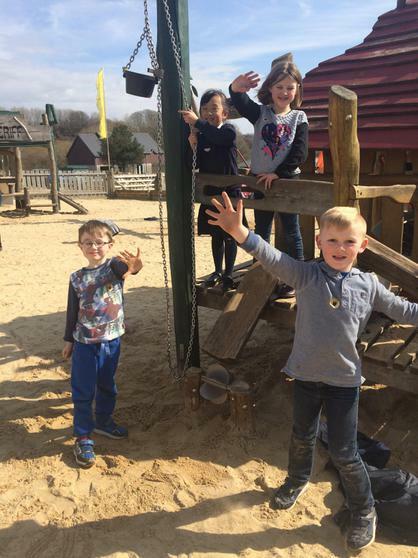 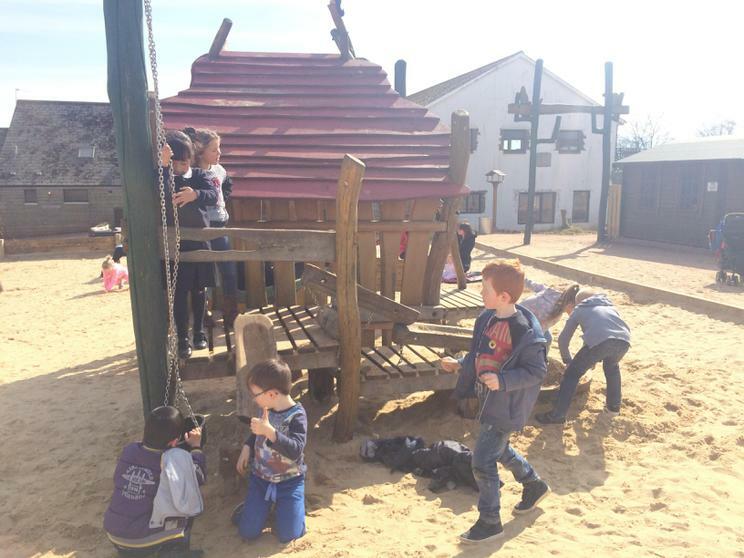 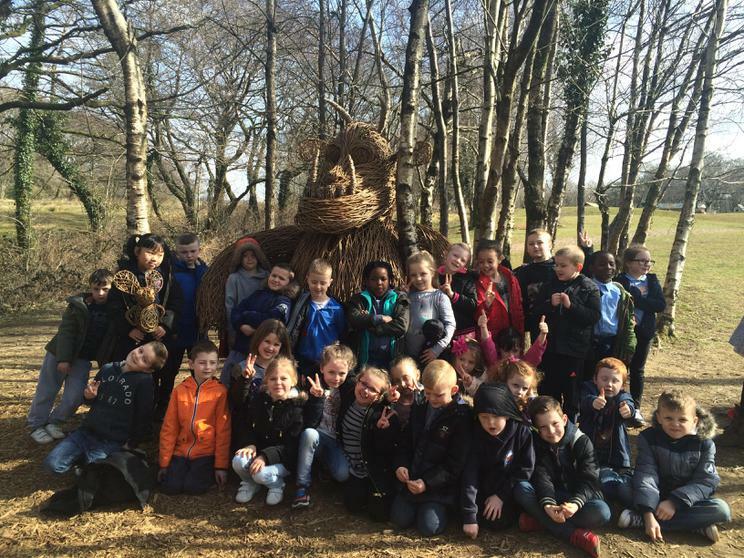 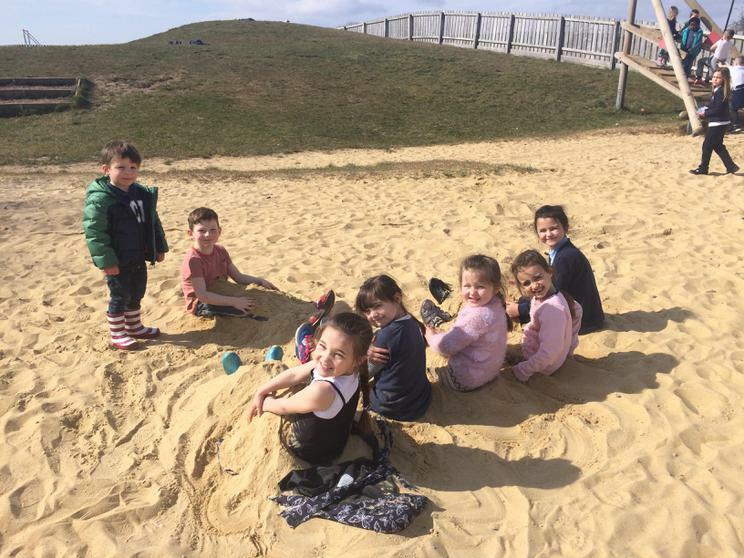 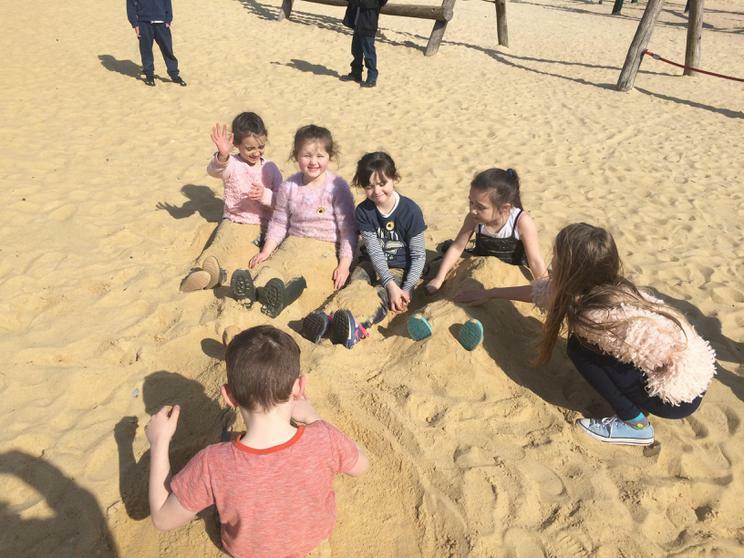 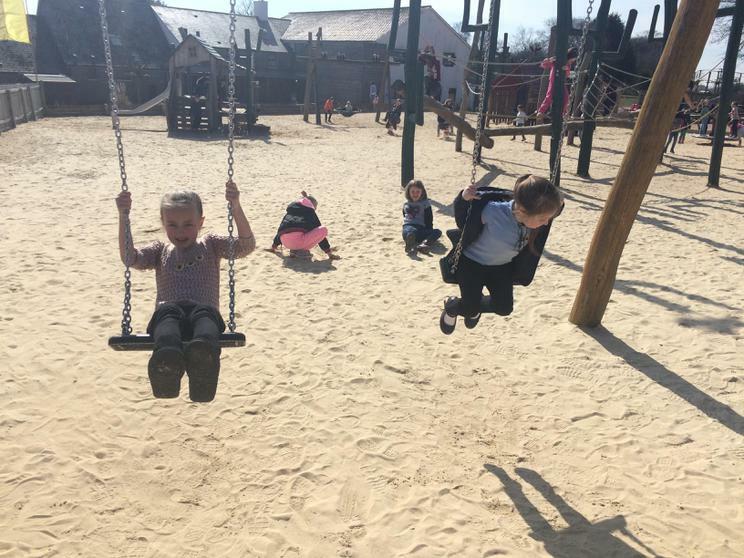 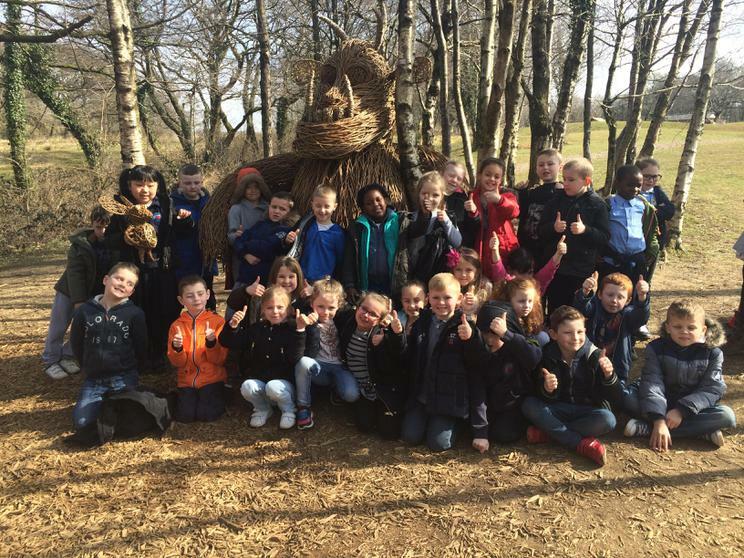 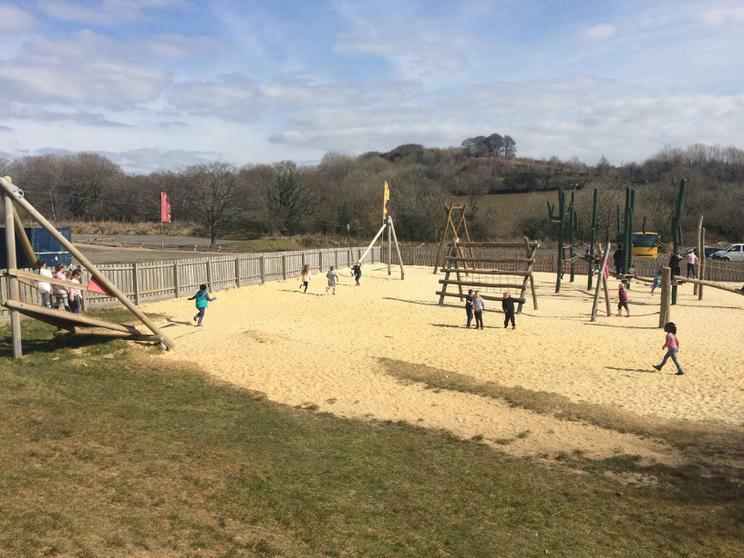 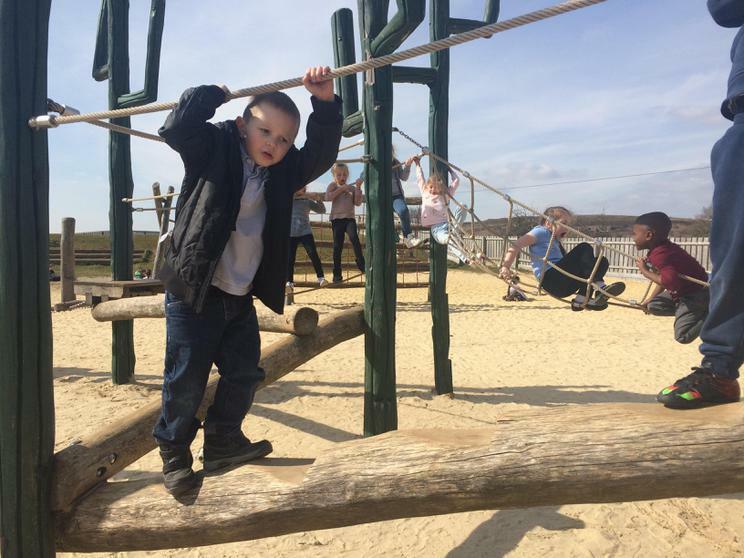 We enjoyed all the different activities such as meeting the animals, playing in the playground area with our friends and most of all, going on an adventure to find The Gruffalo. 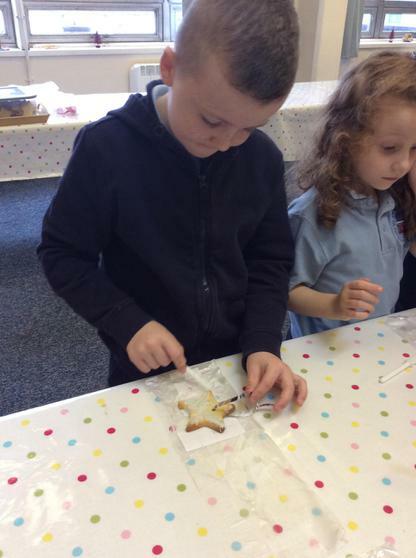 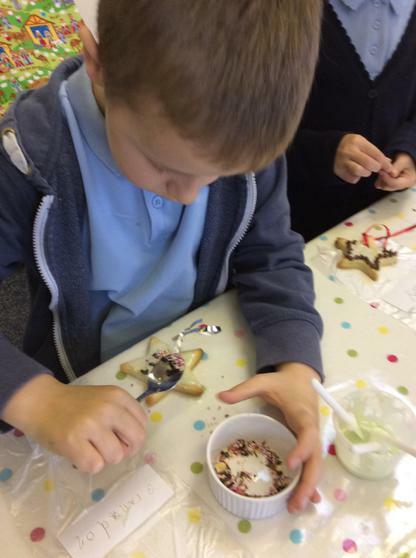 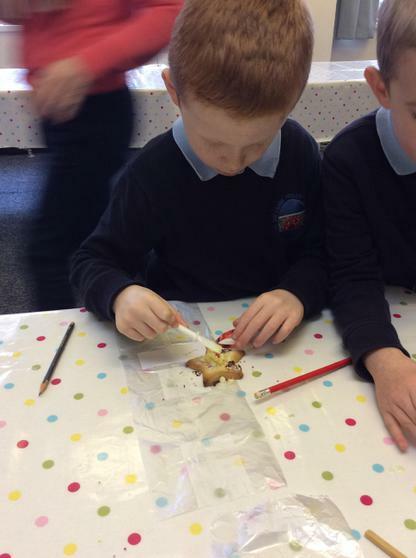 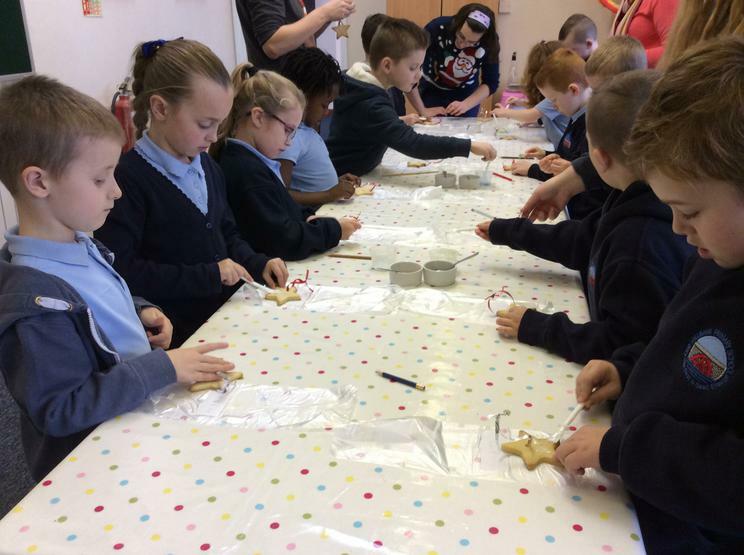 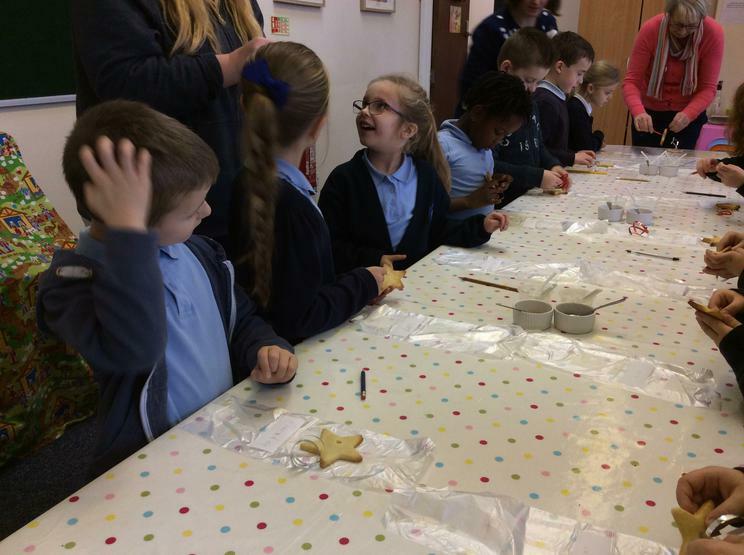 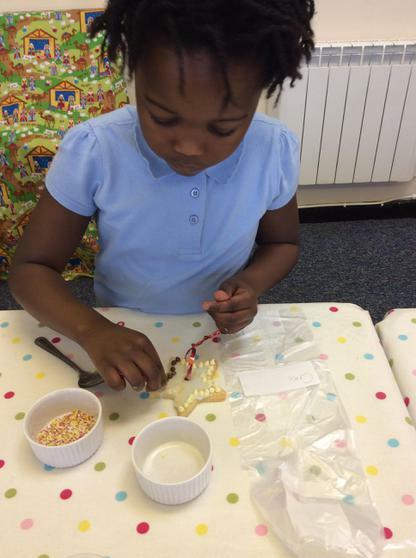 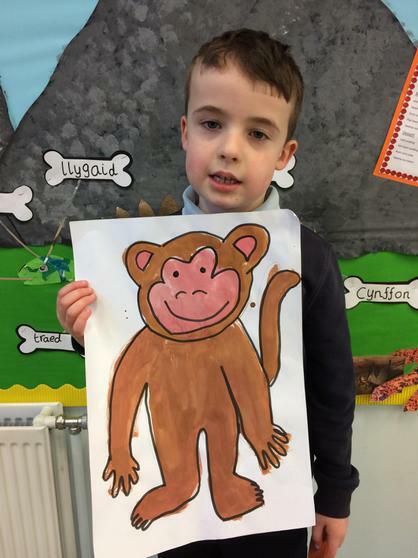 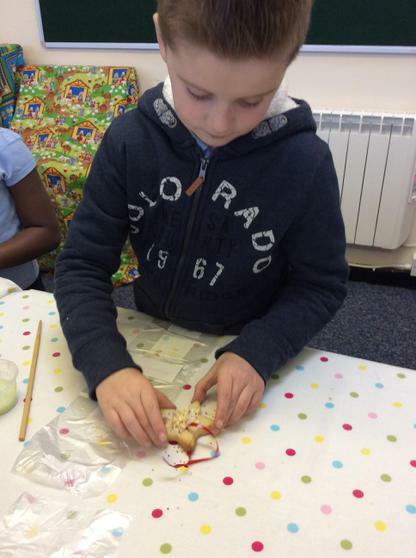 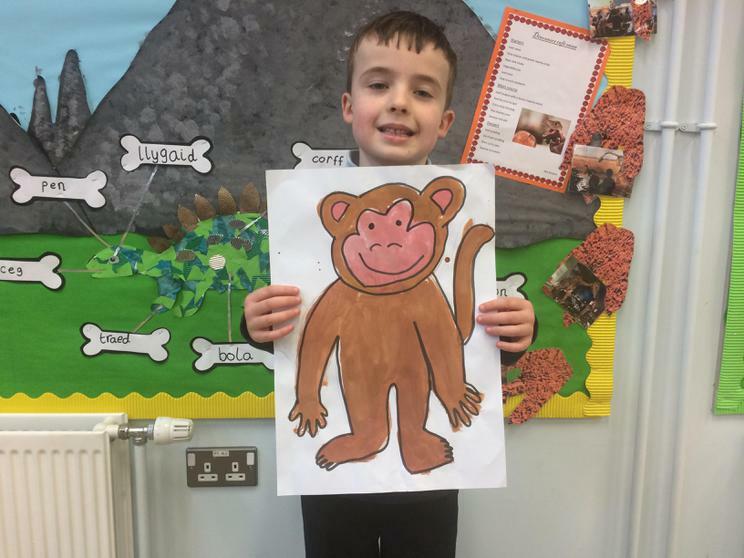 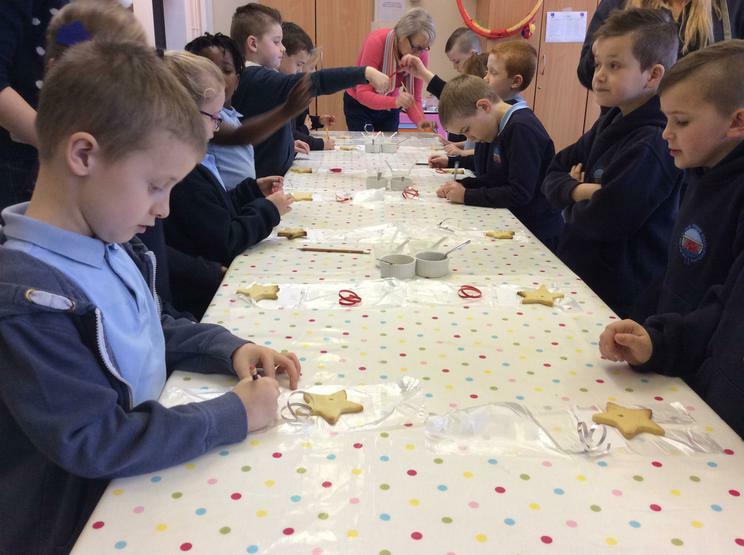 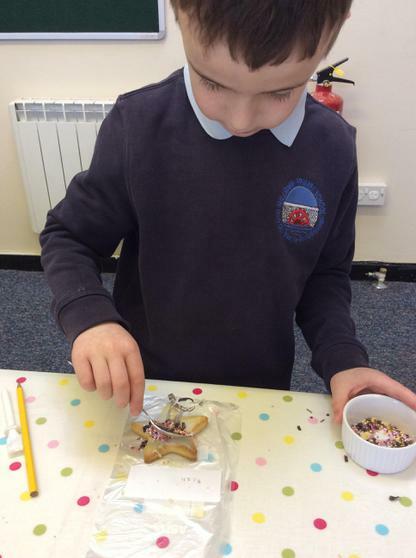 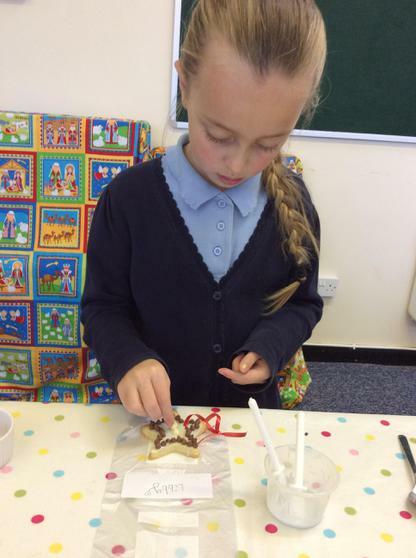 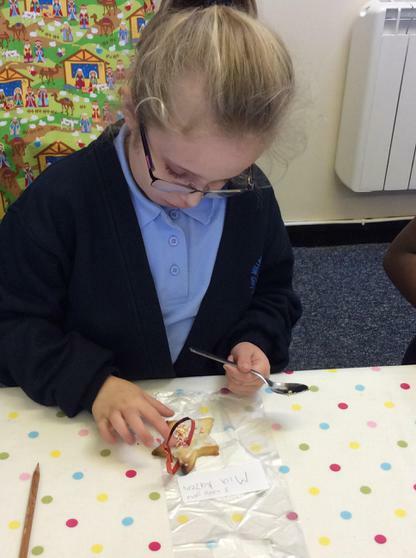 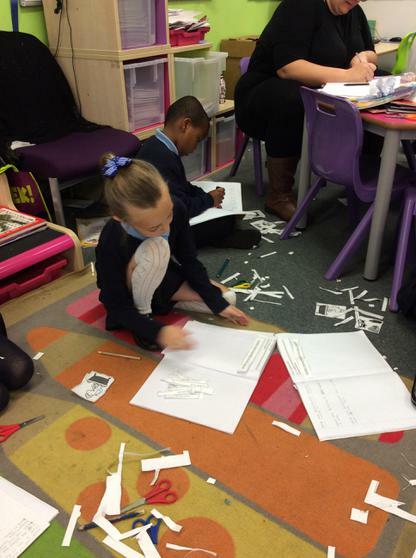 We've been learning about the gingerbread man story by writing information text, annotating the gingerbread man in welsh and finally, we decided to make our own. 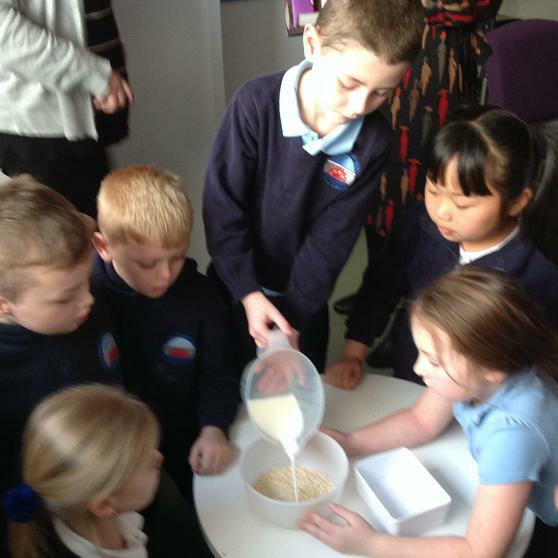 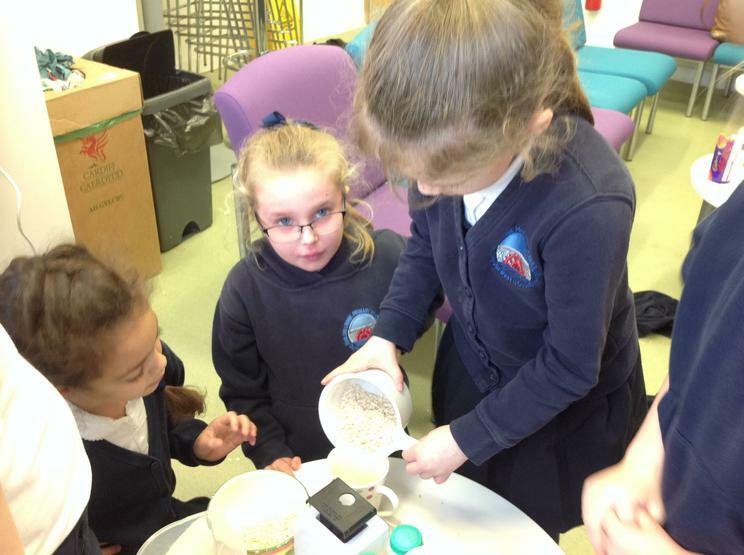 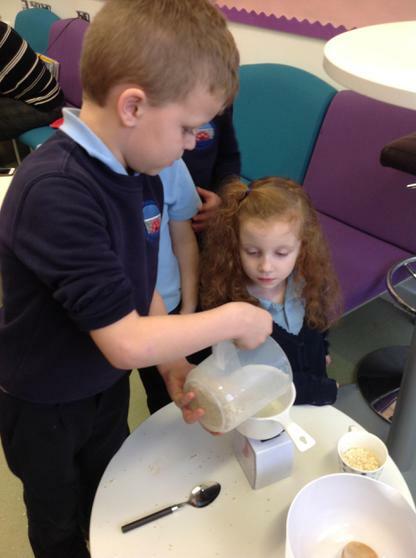 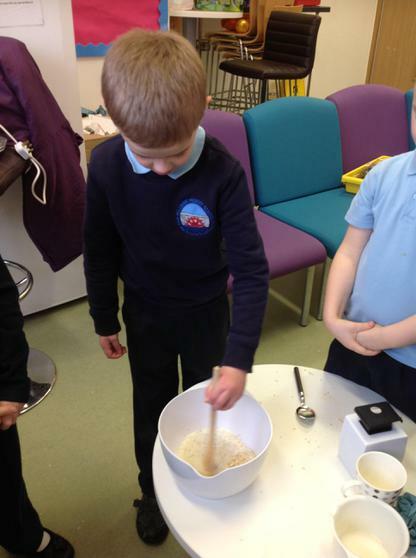 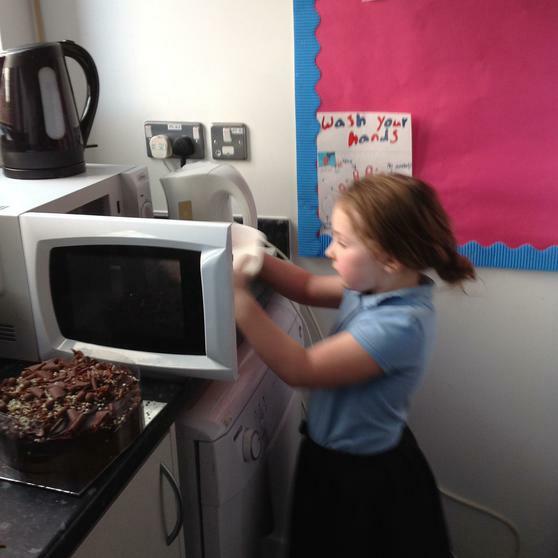 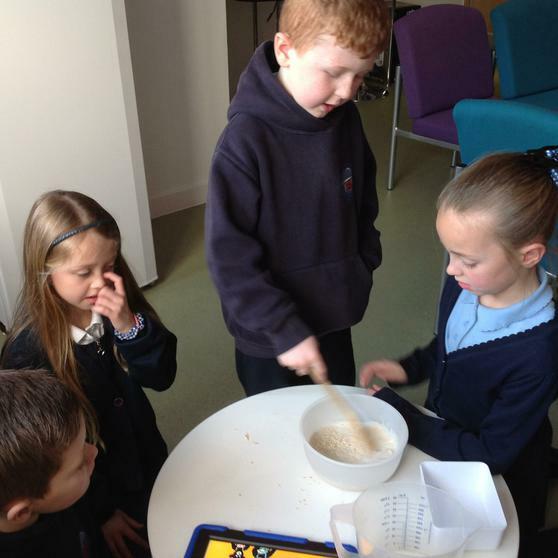 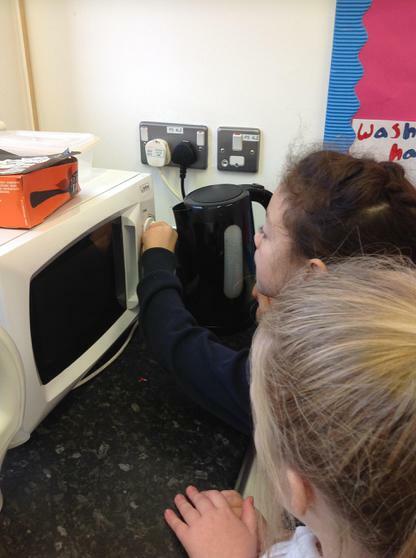 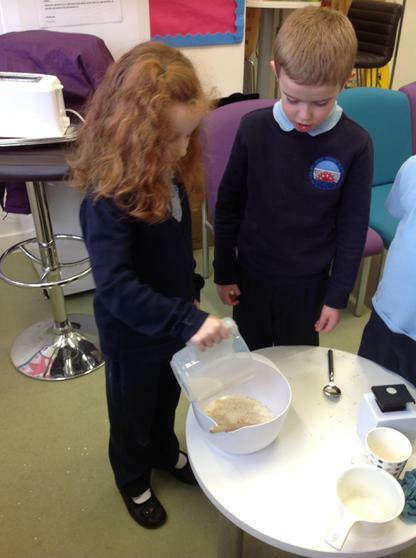 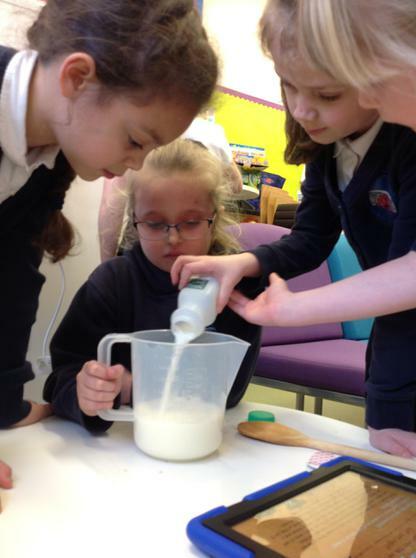 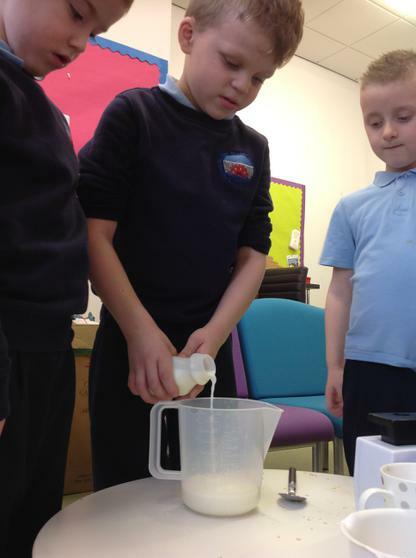 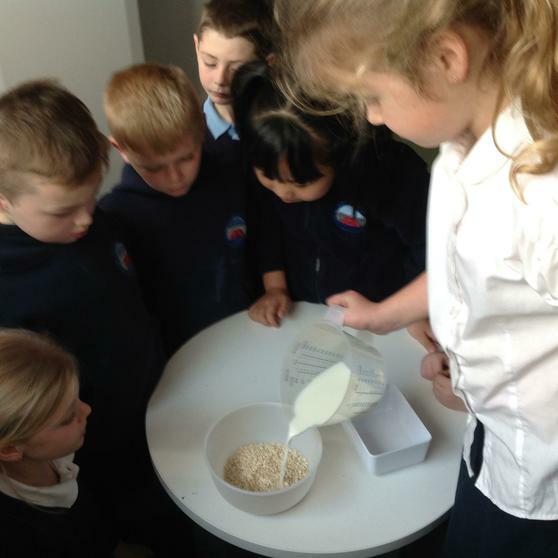 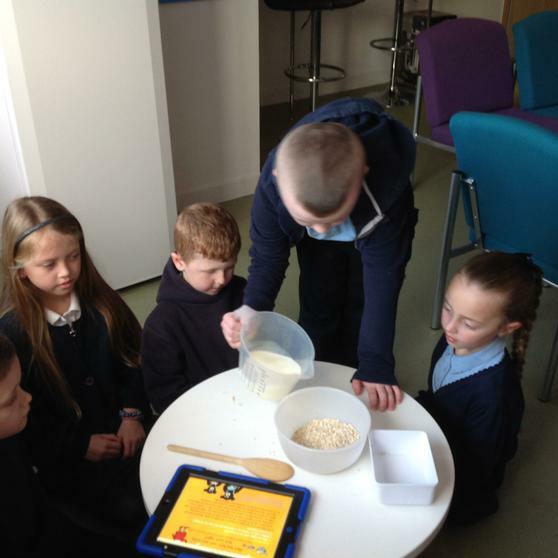 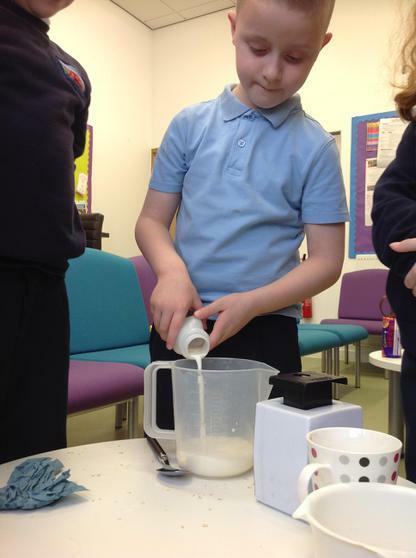 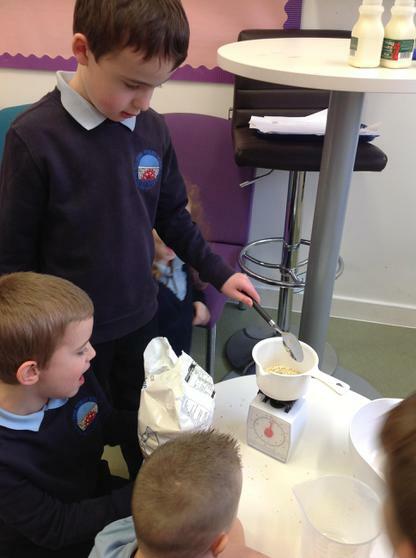 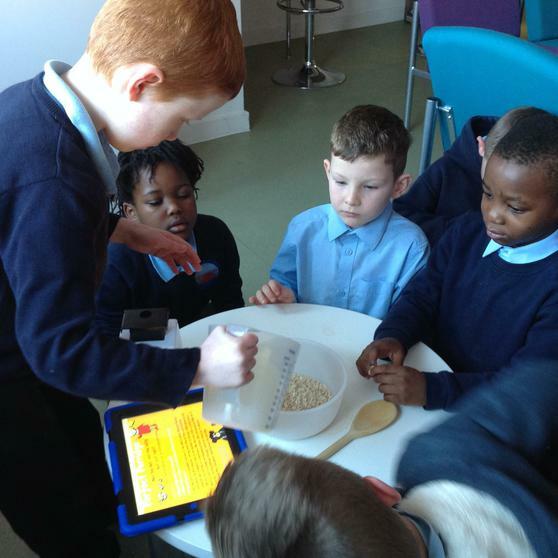 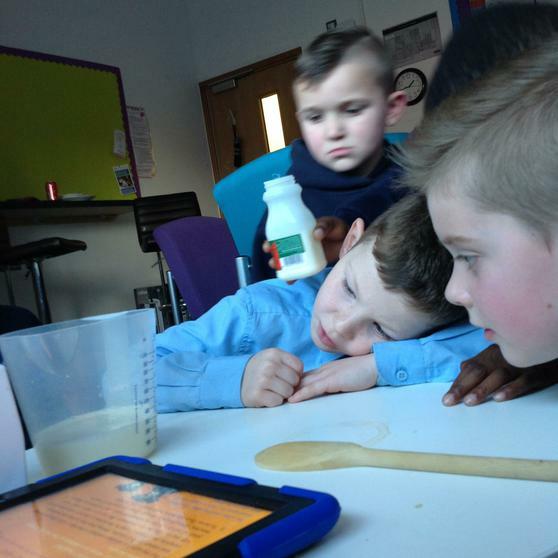 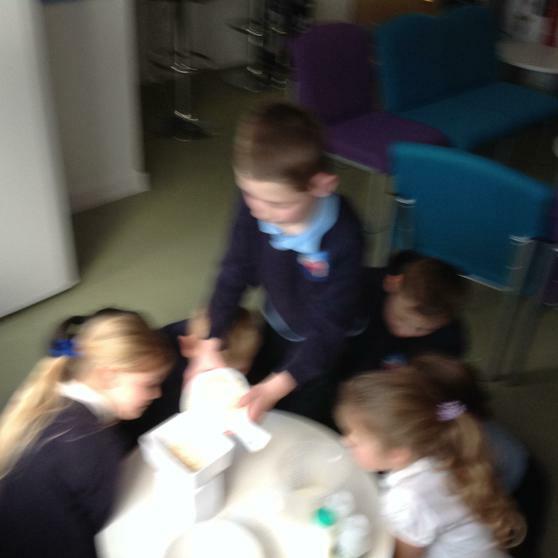 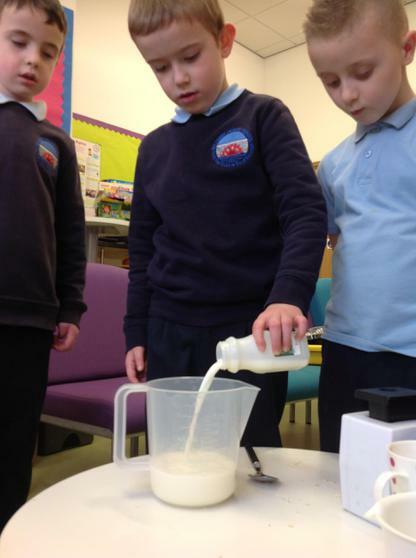 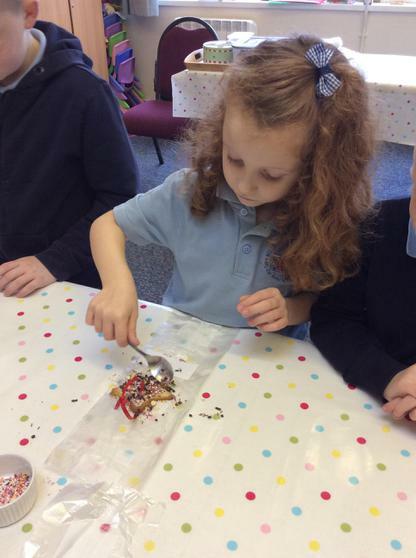 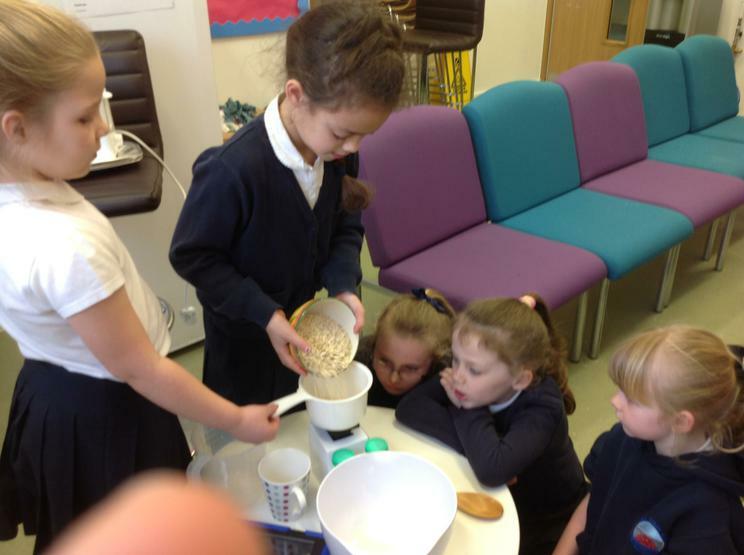 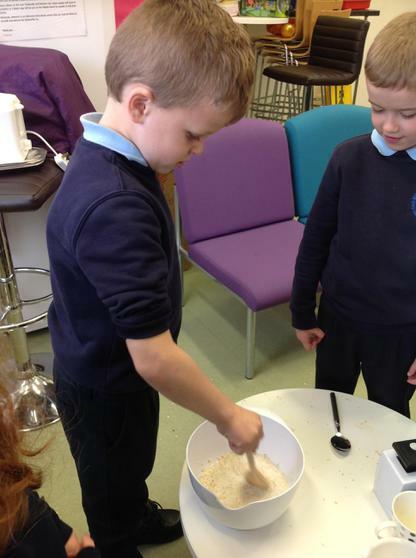 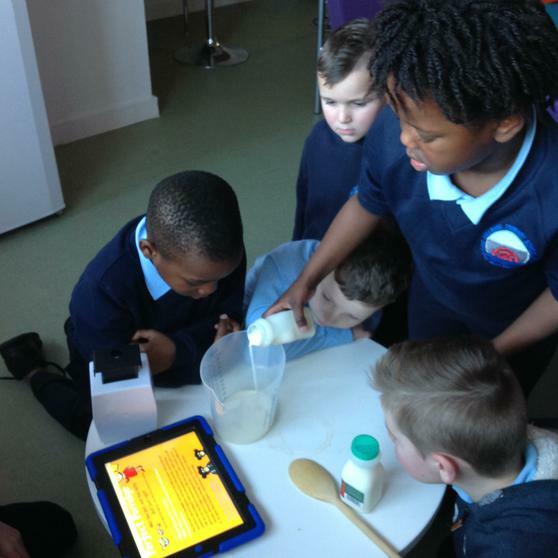 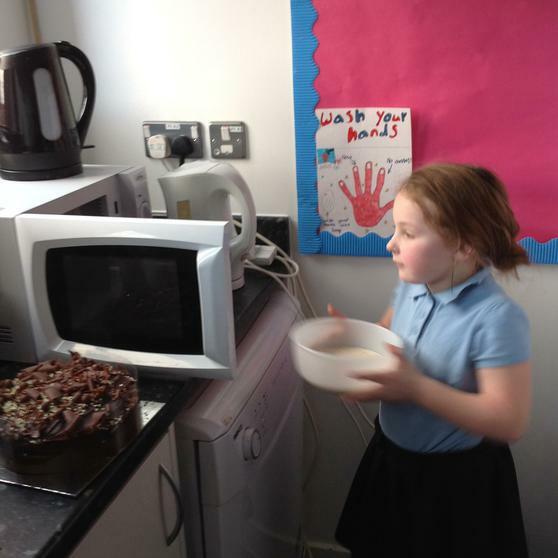 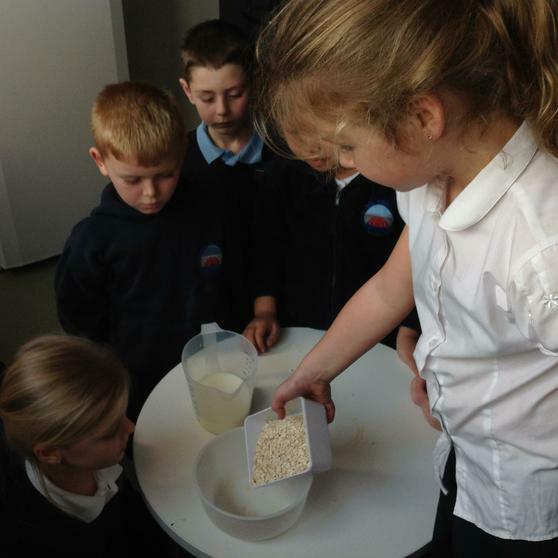 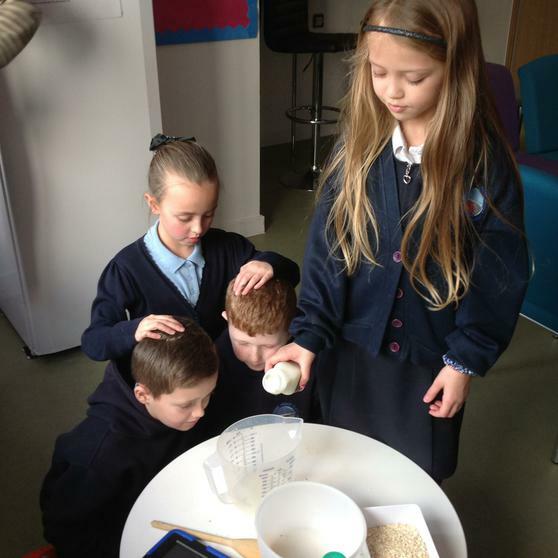 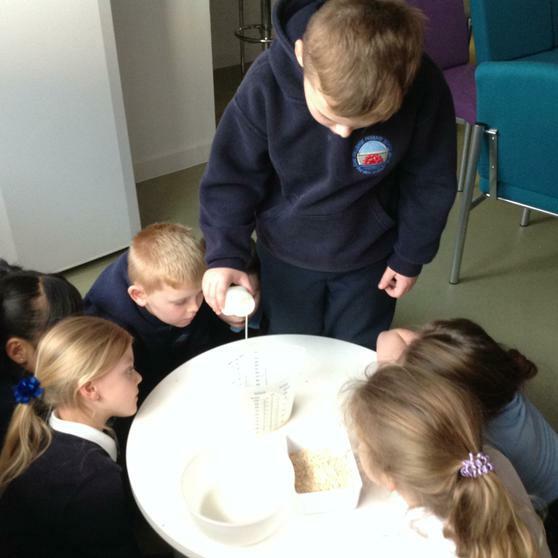 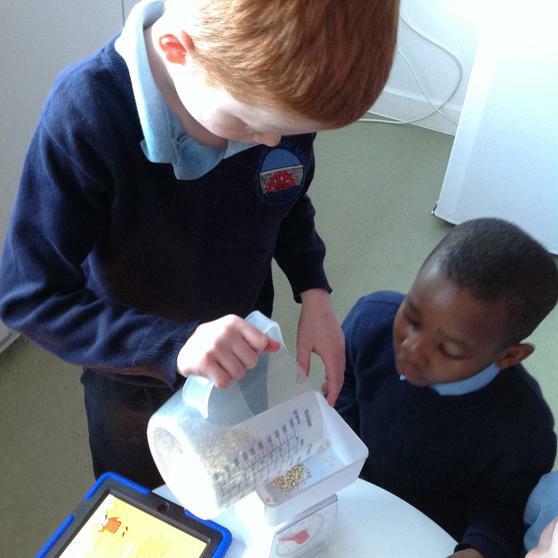 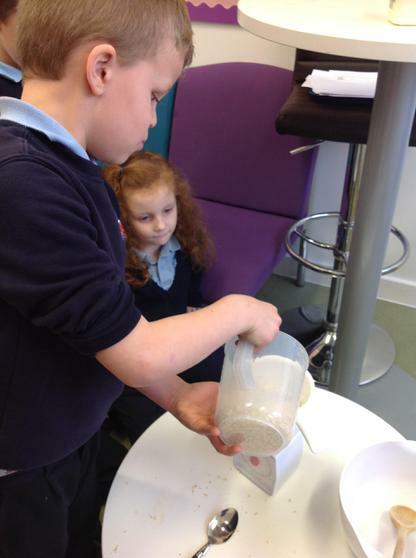 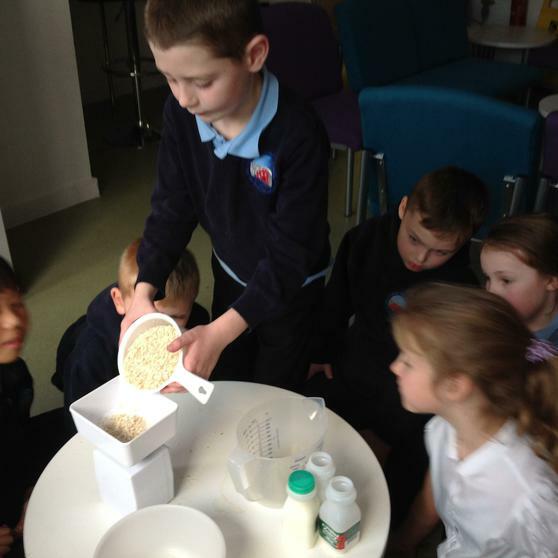 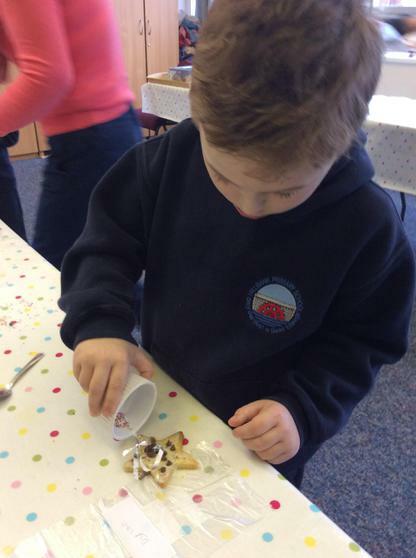 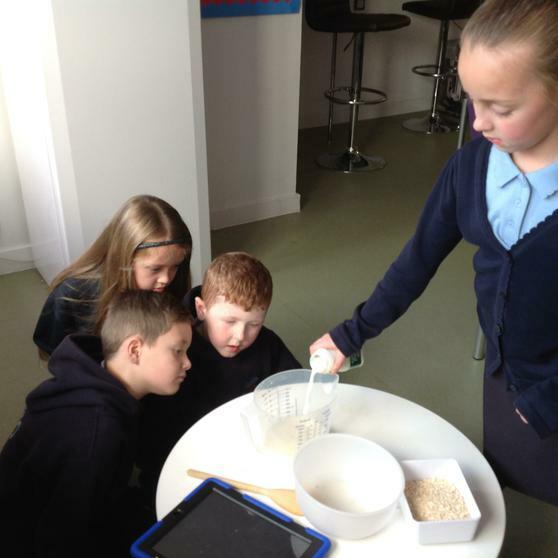 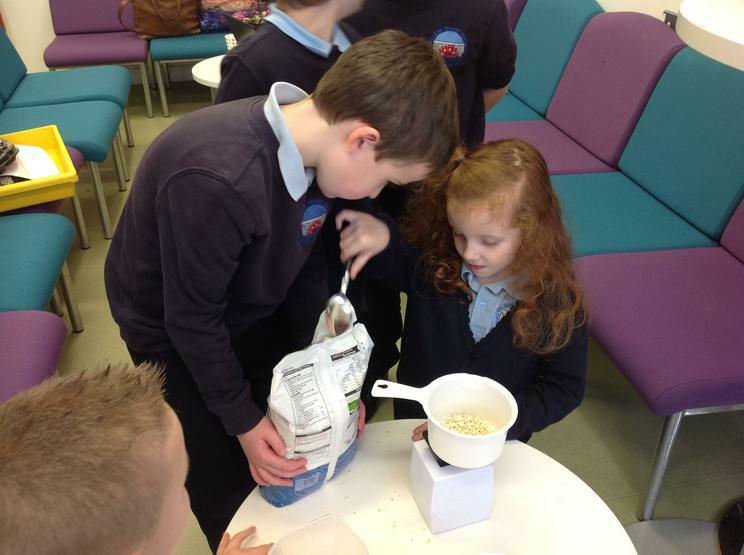 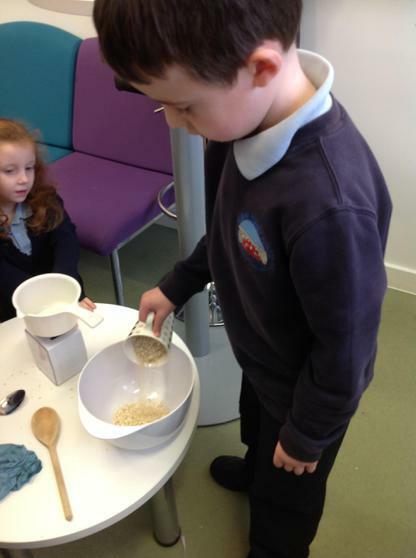 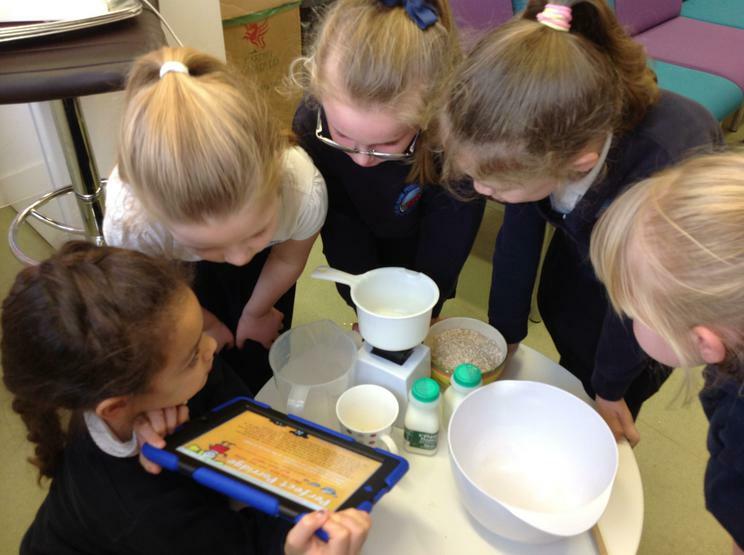 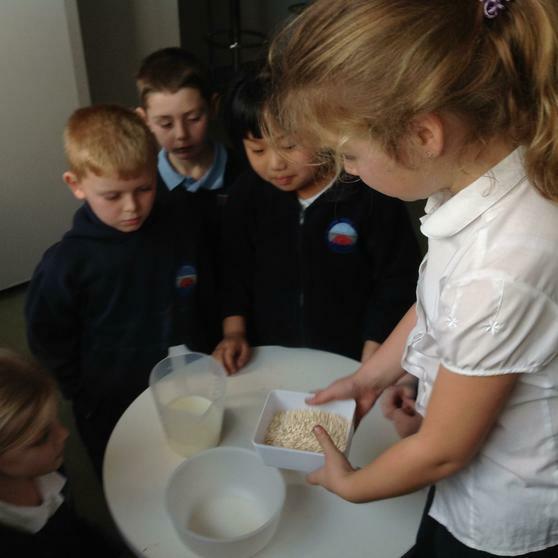 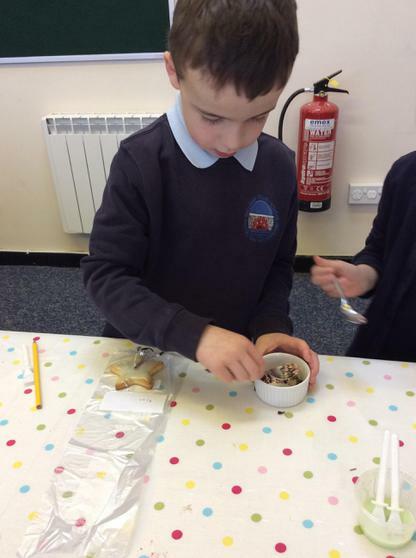 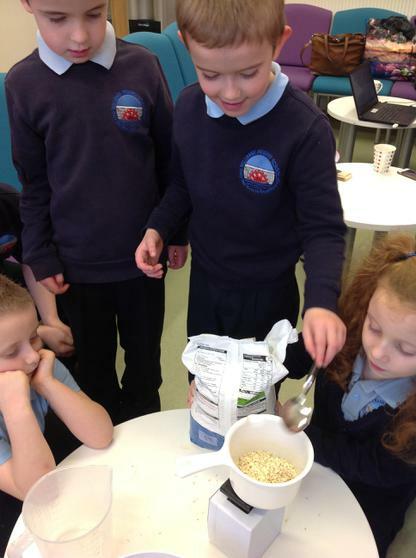 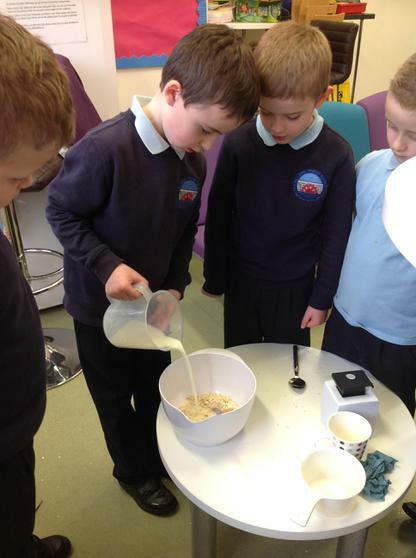 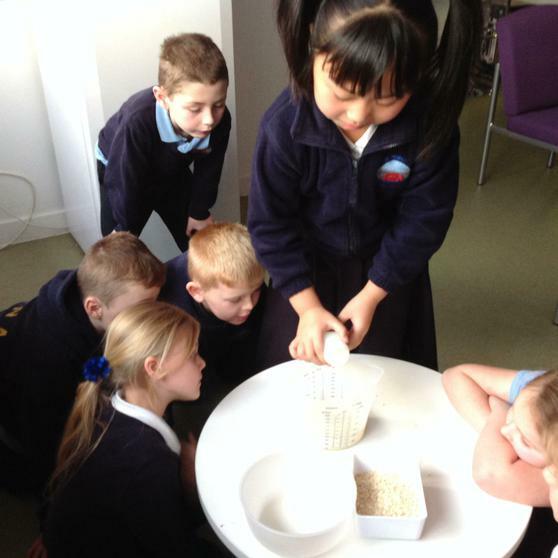 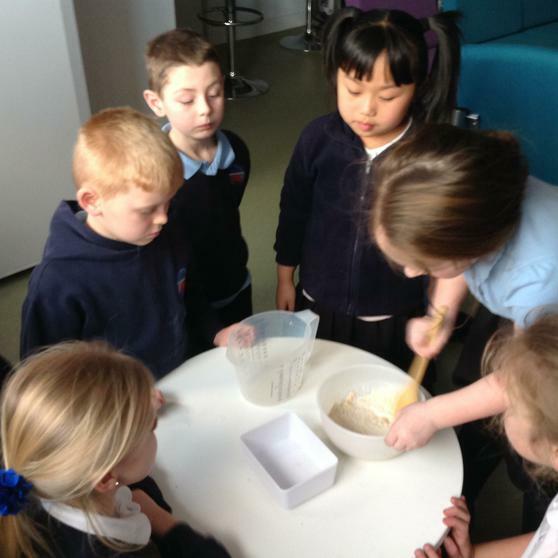 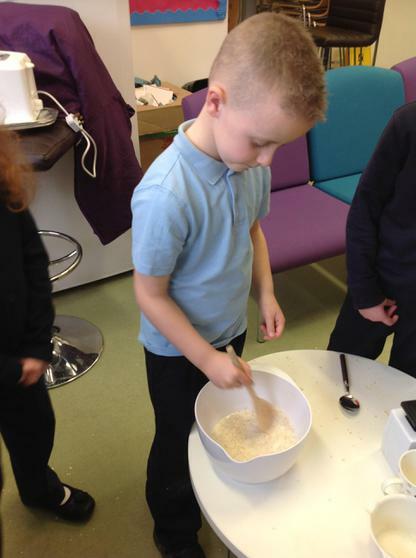 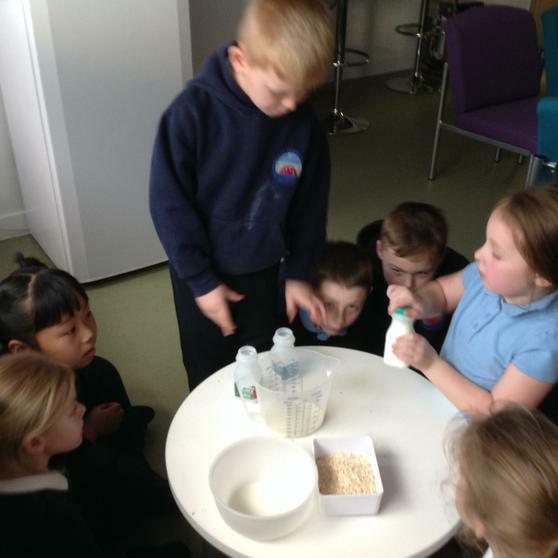 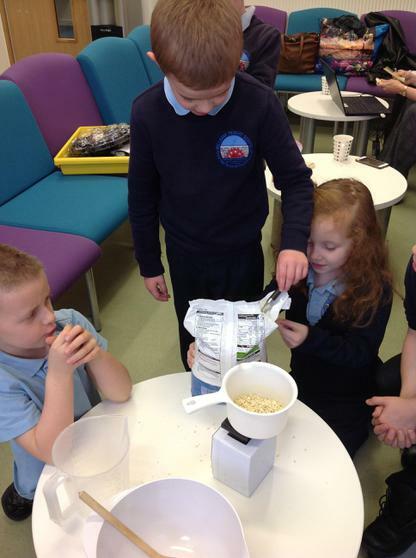 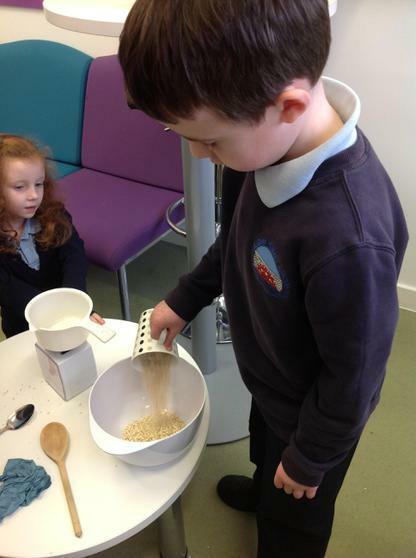 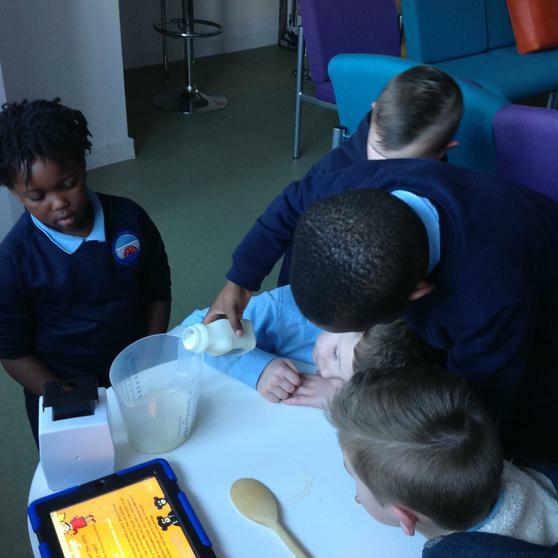 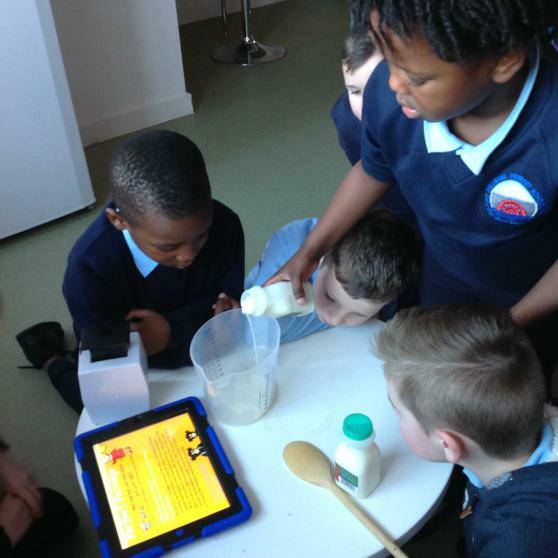 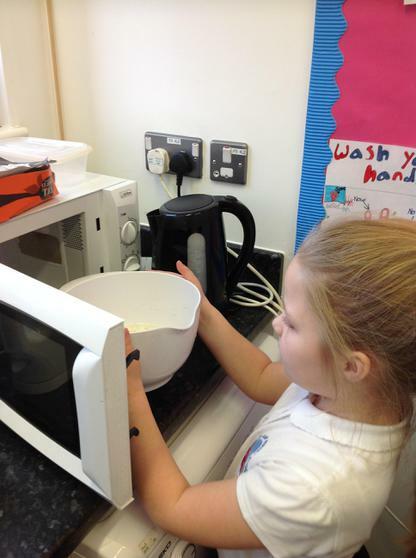 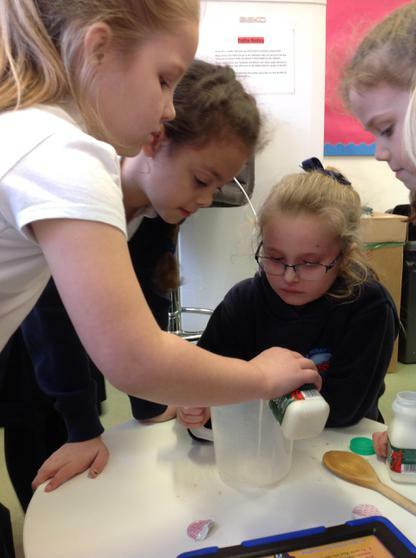 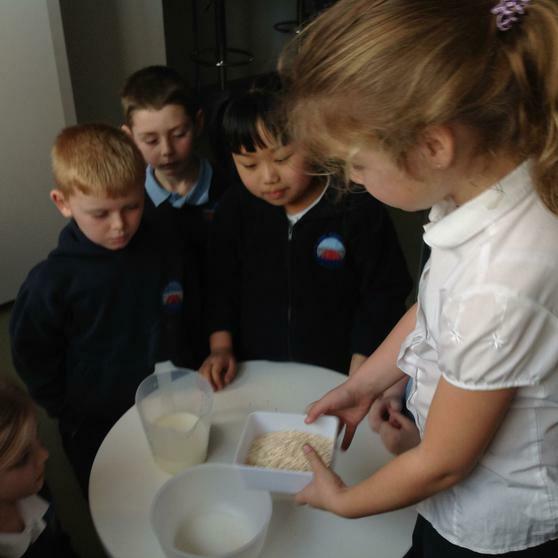 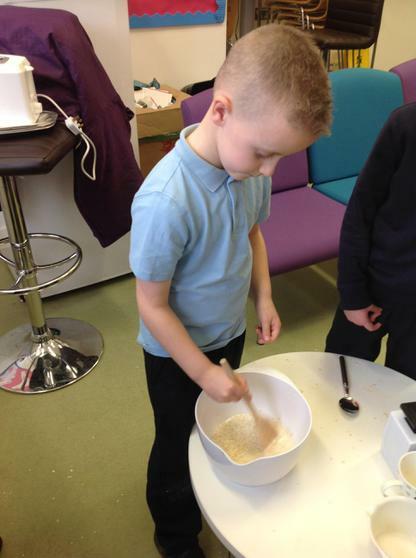 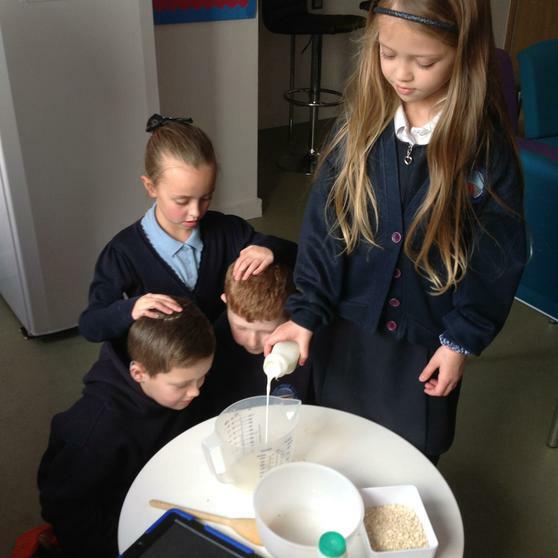 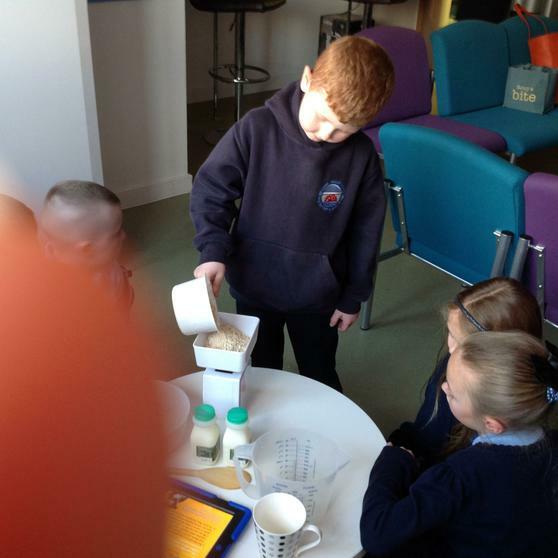 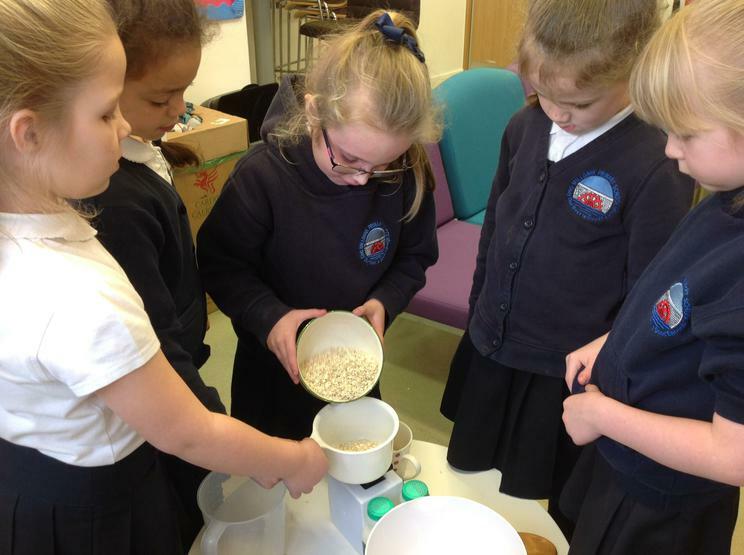 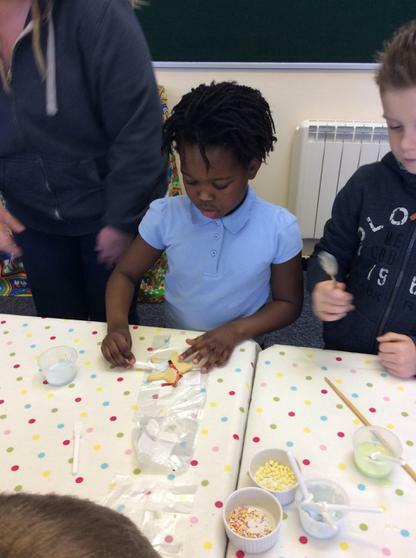 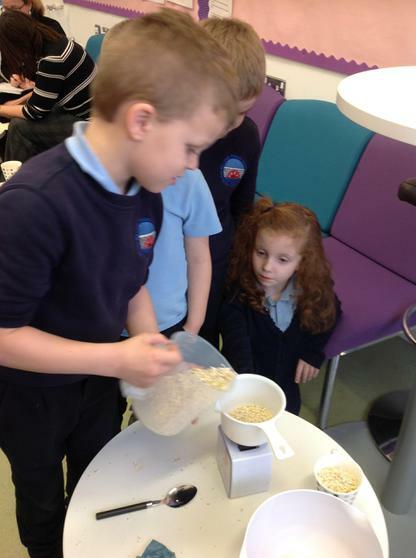 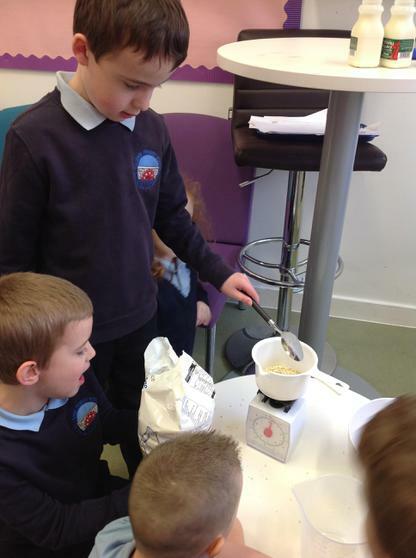 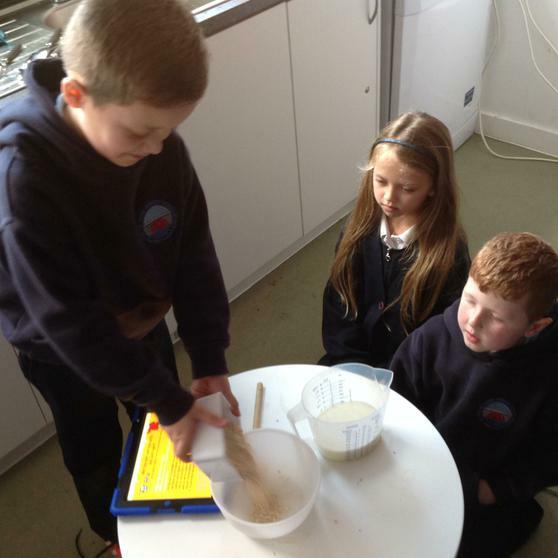 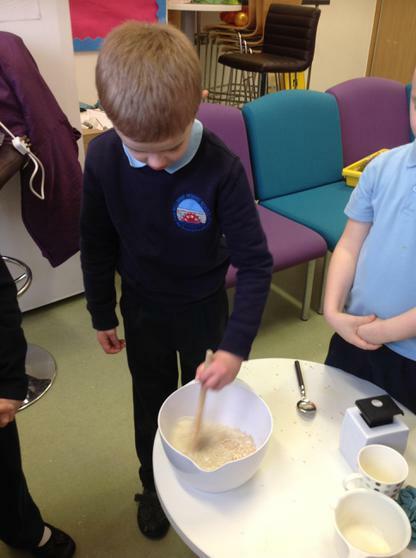 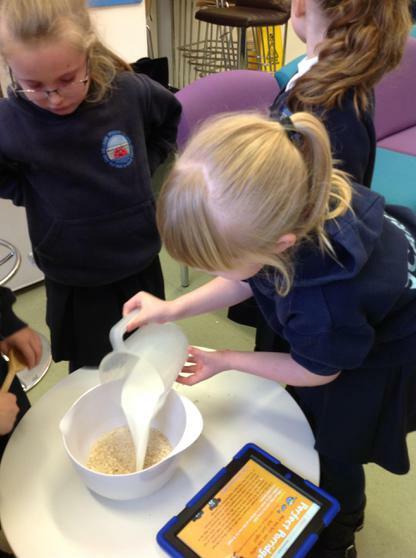 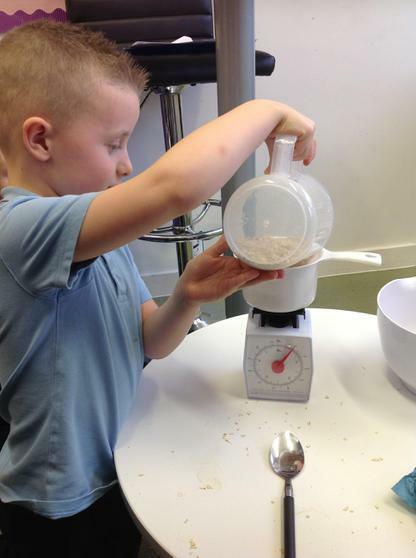 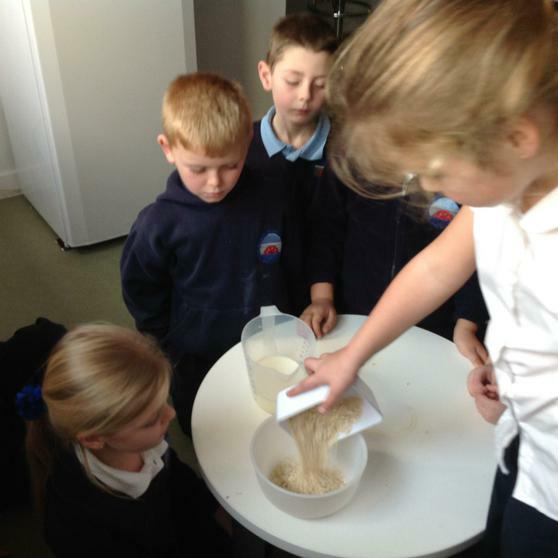 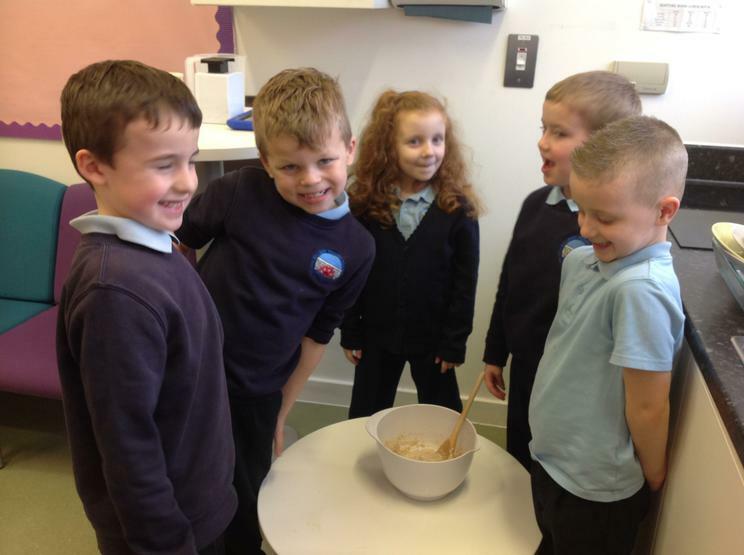 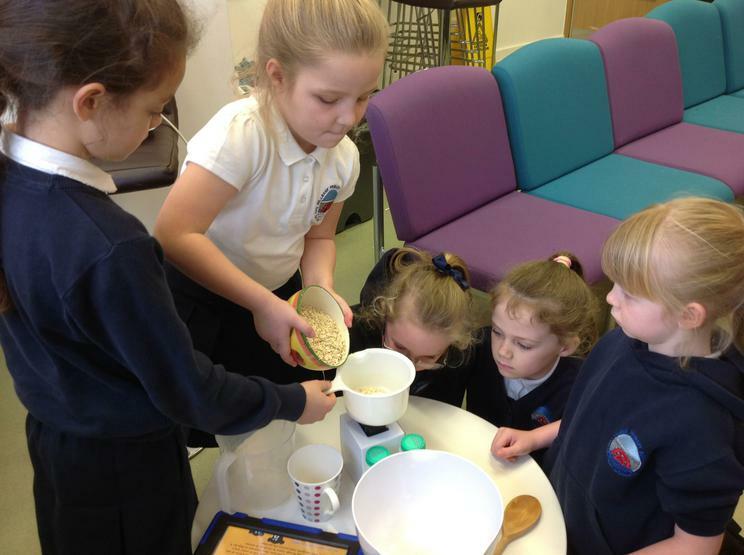 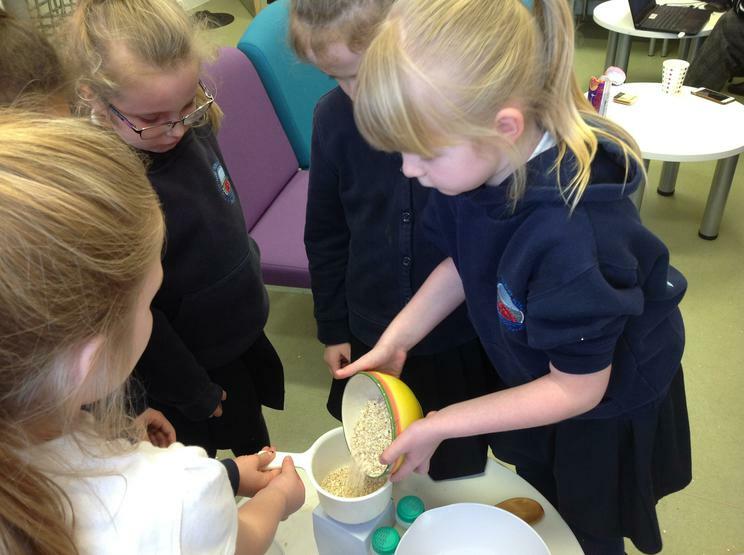 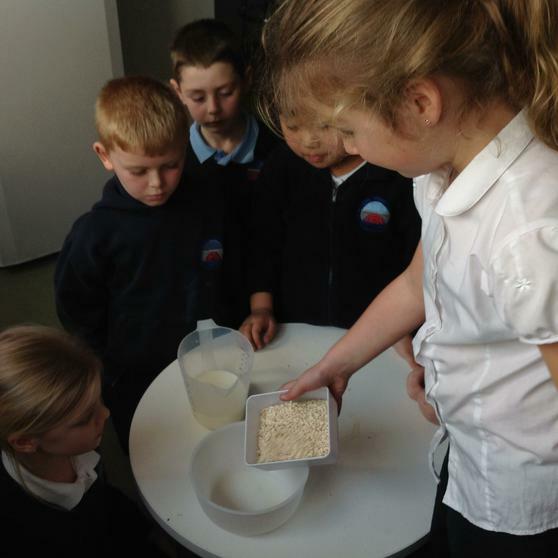 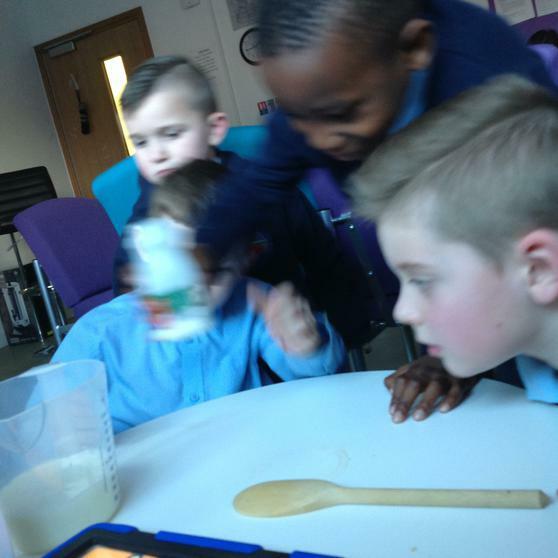 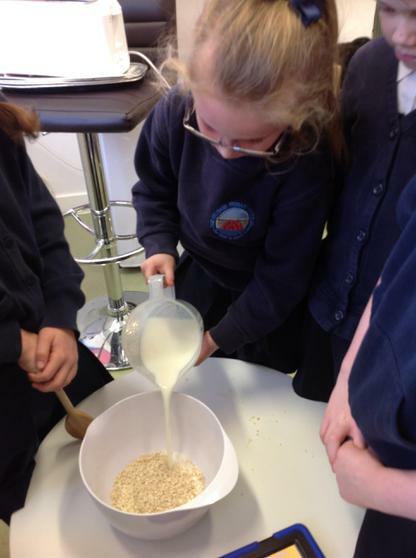 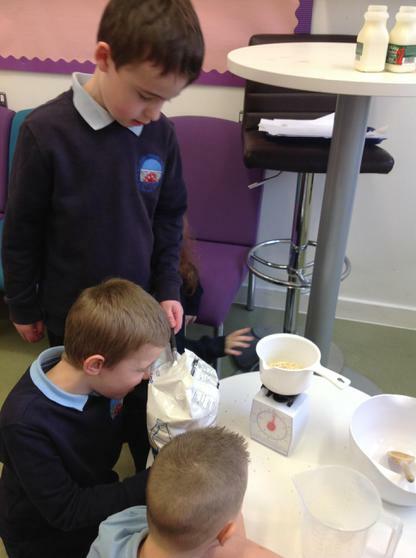 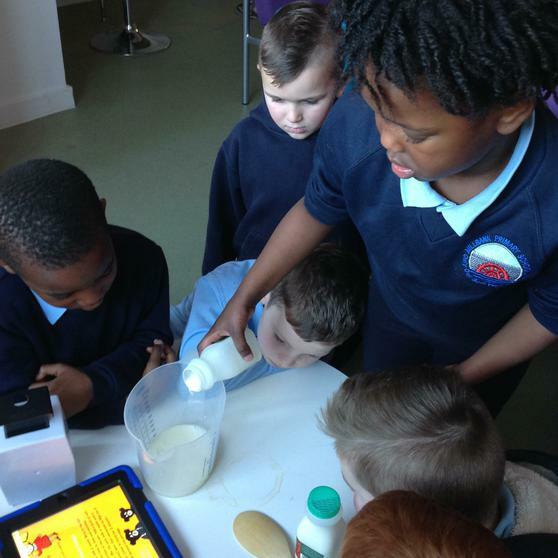 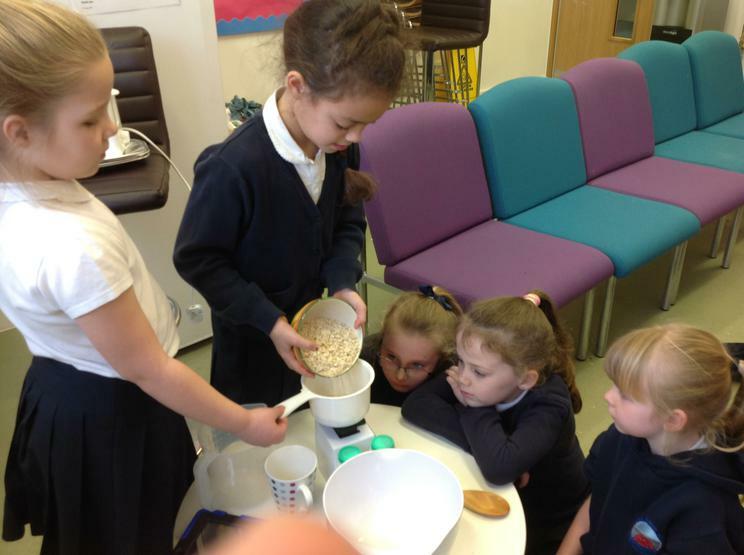 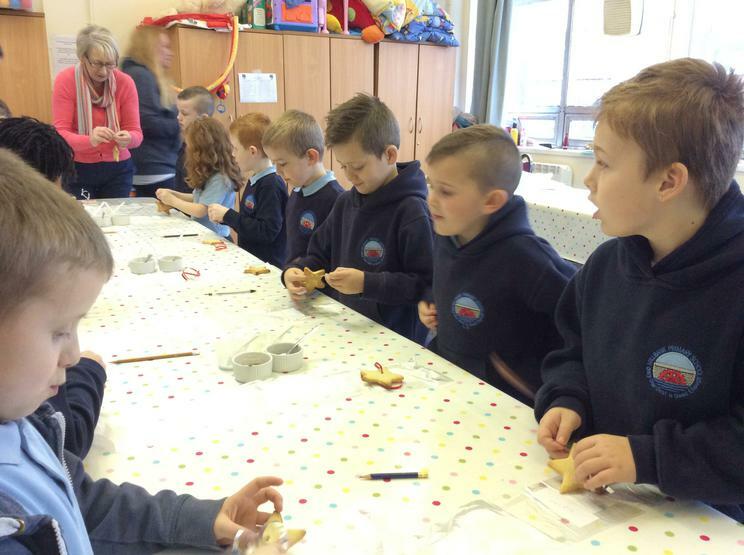 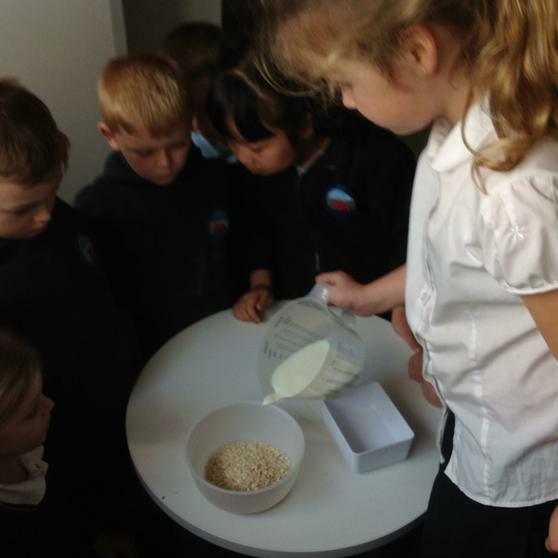 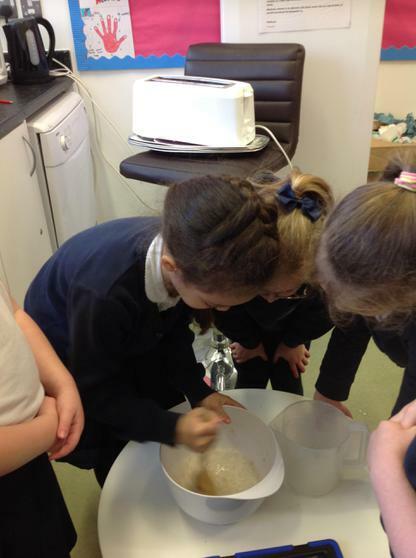 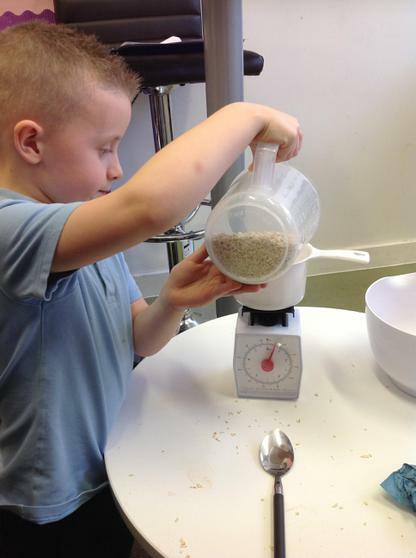 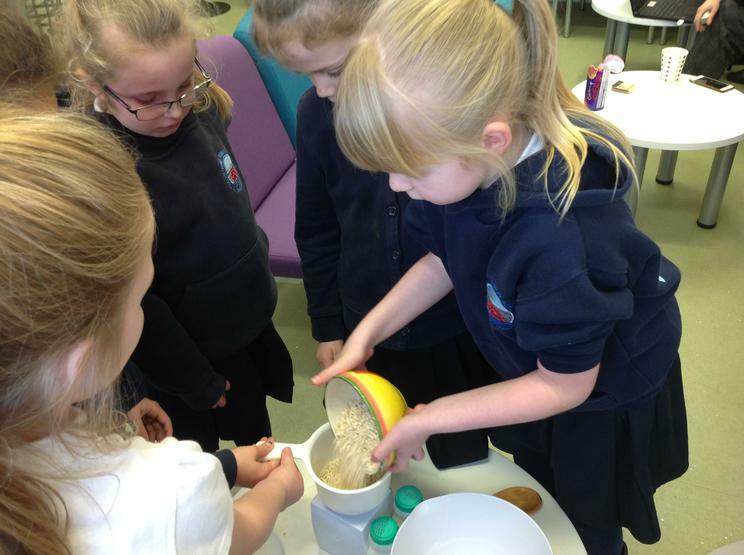 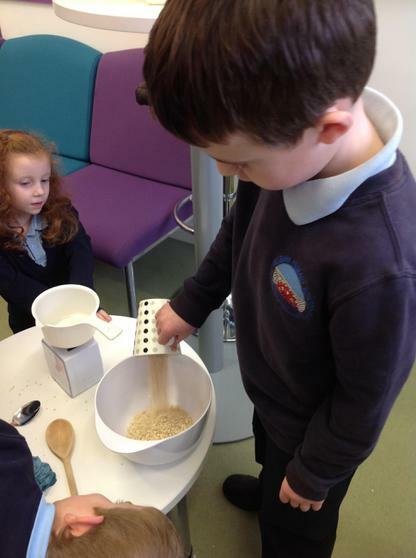 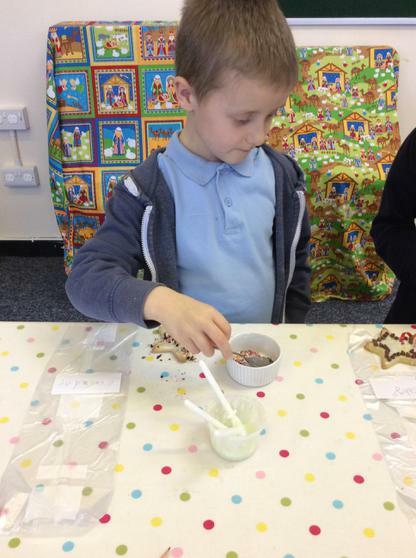 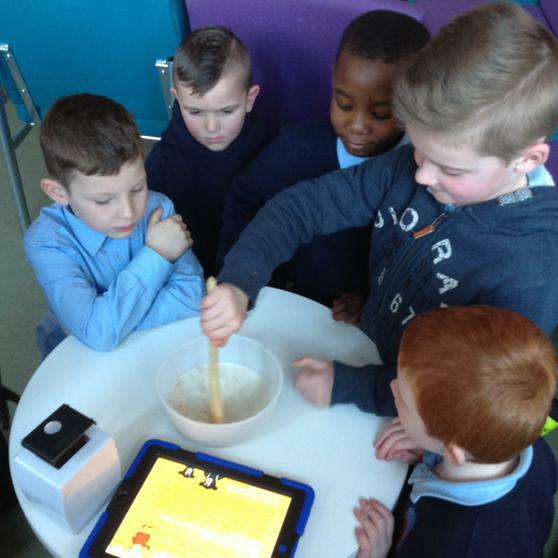 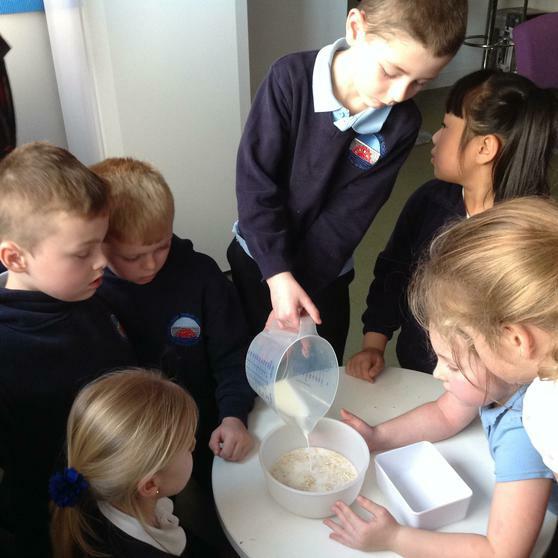 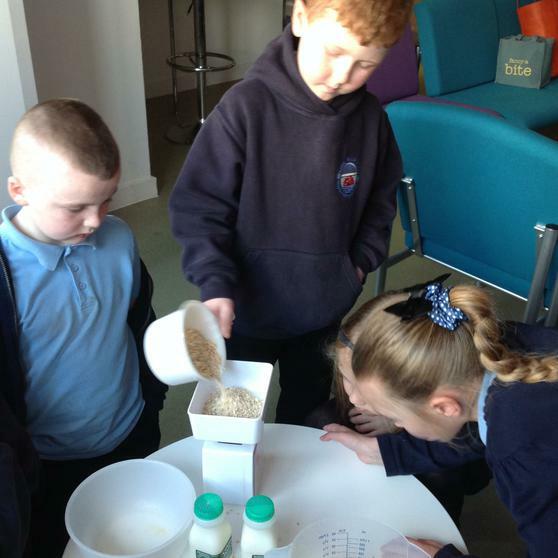 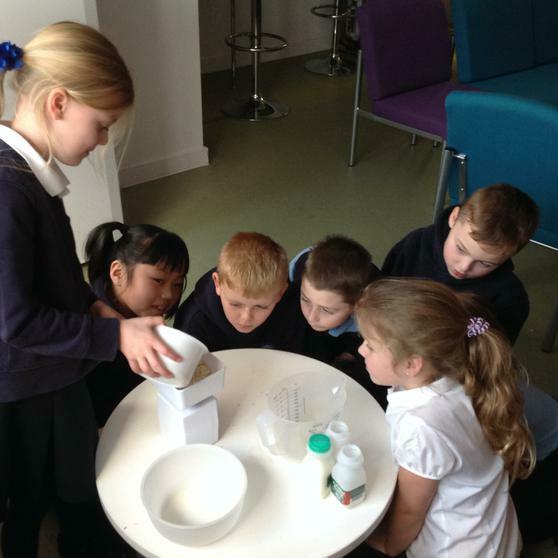 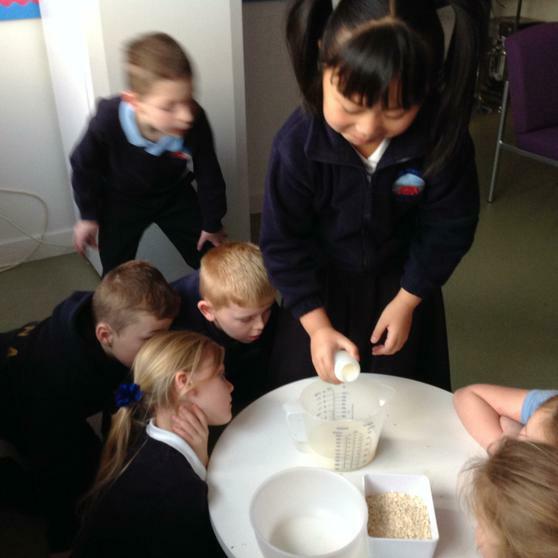 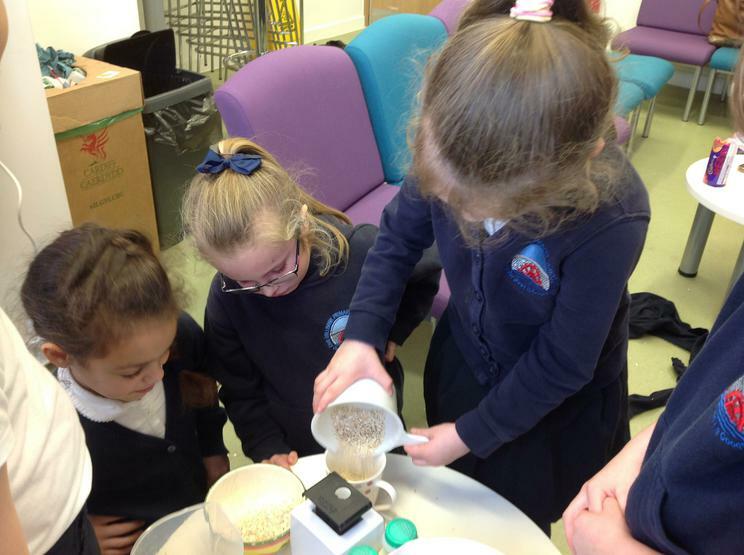 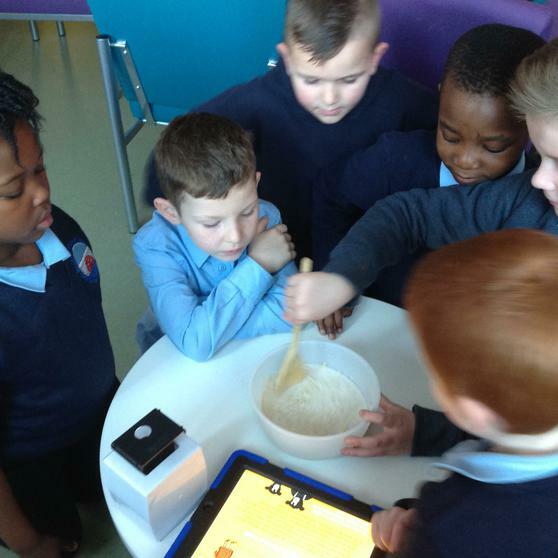 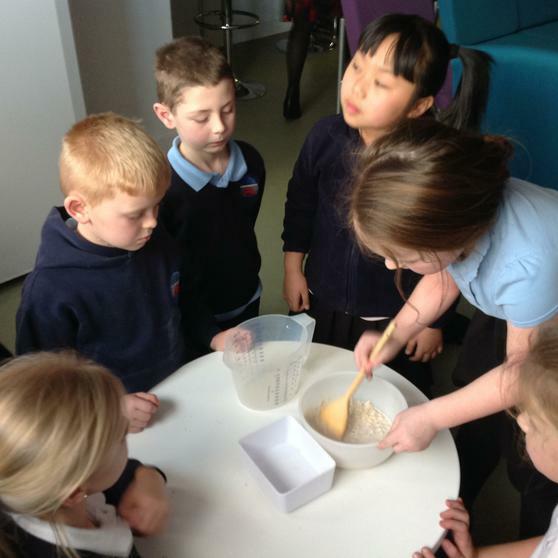 Our class were busy following instructions to make porridge for Goldilocks. 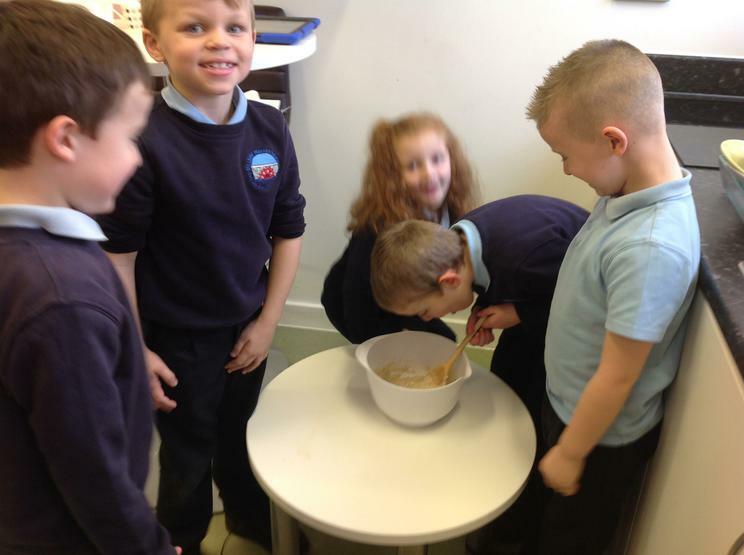 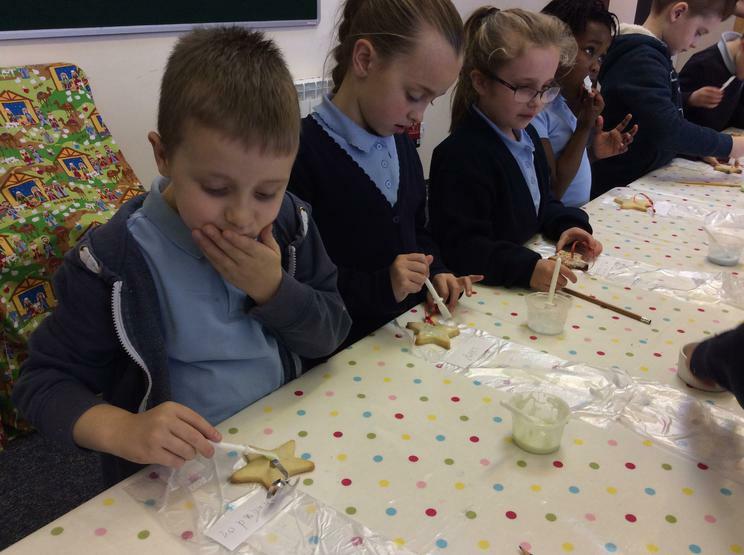 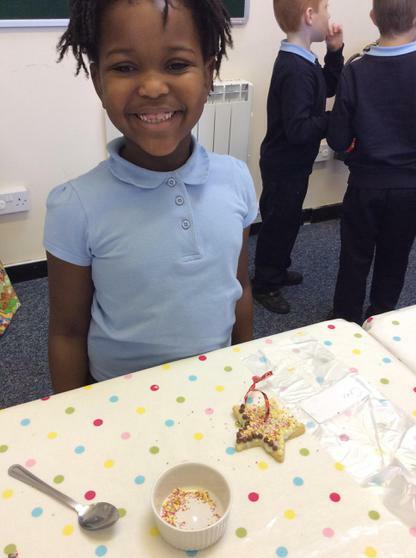 We stirred, we mixed, we heated, we ate, we enjoyed! 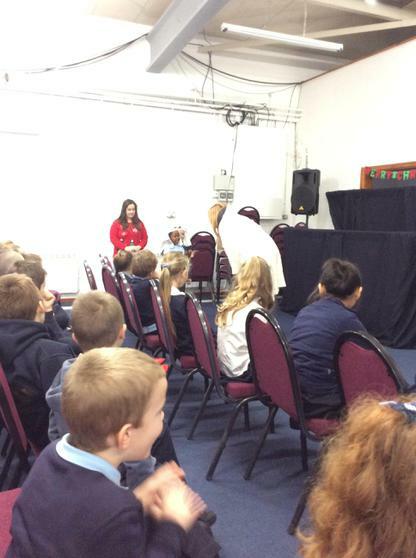 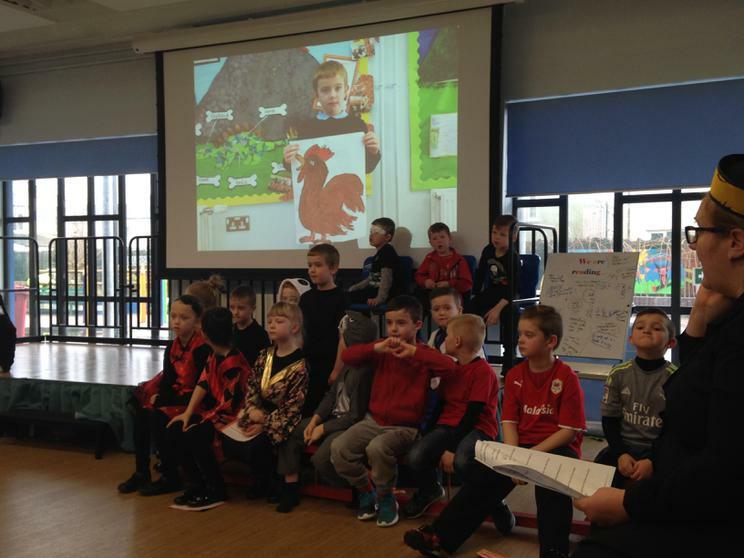 We were extremely excited about meeting some of the Cardiff City F.C players and getting their autographs. 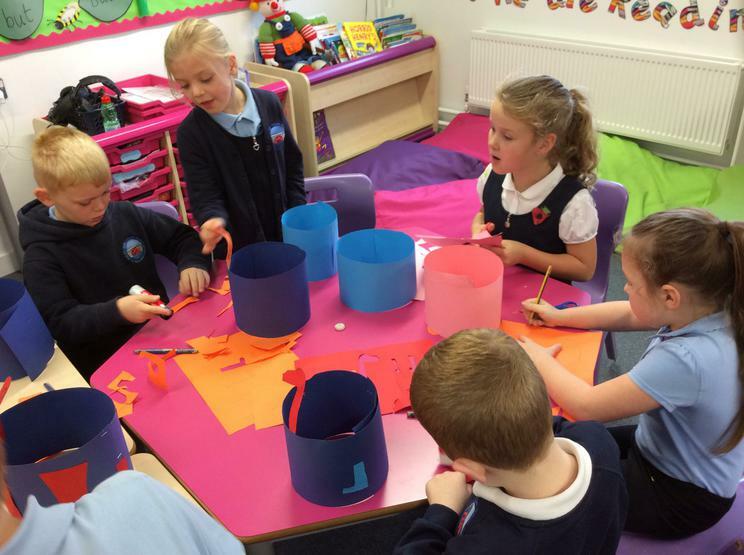 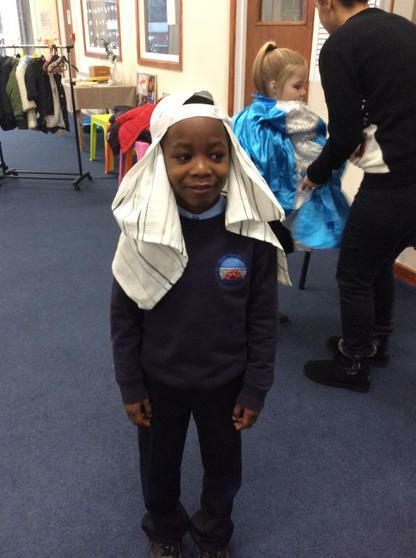 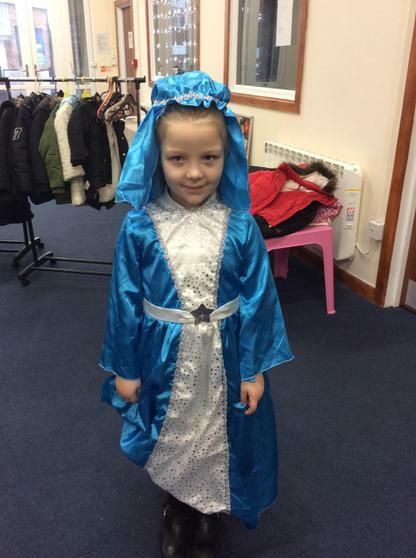 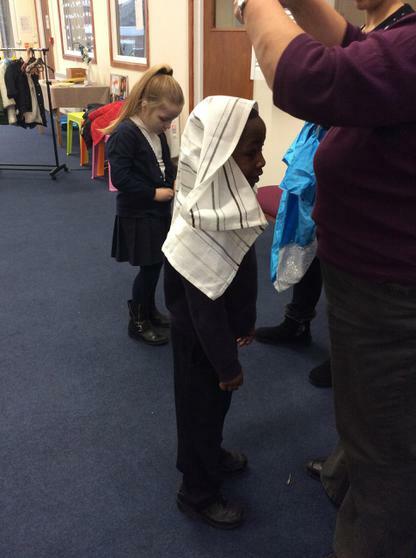 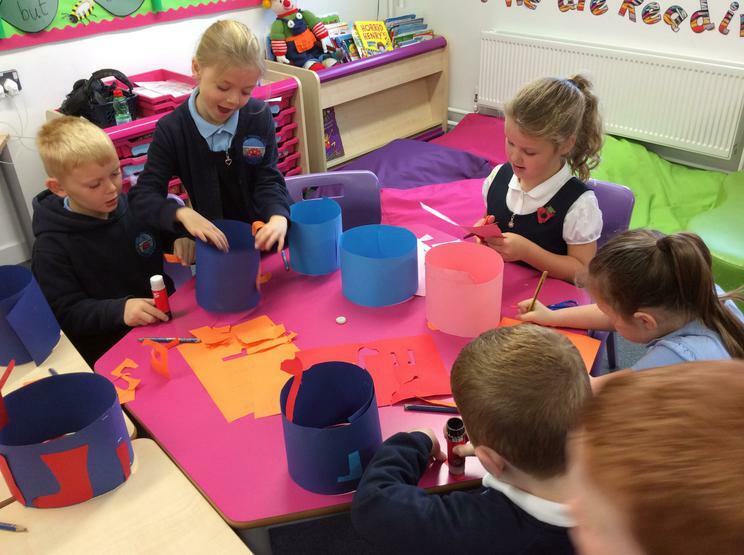 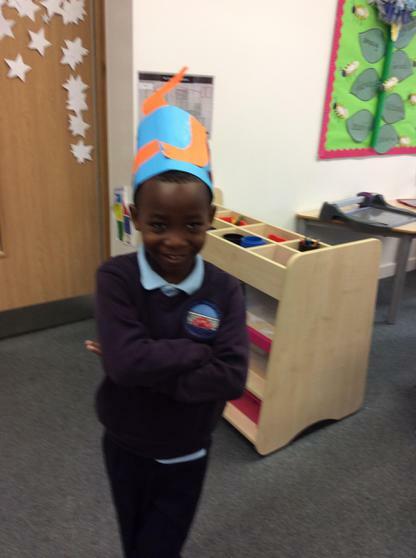 We've been enjoying our new fancy dress shop area in our classroom. 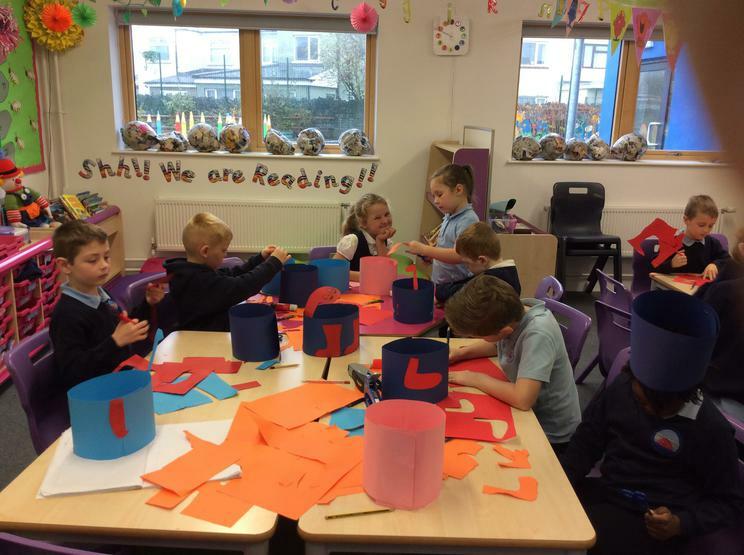 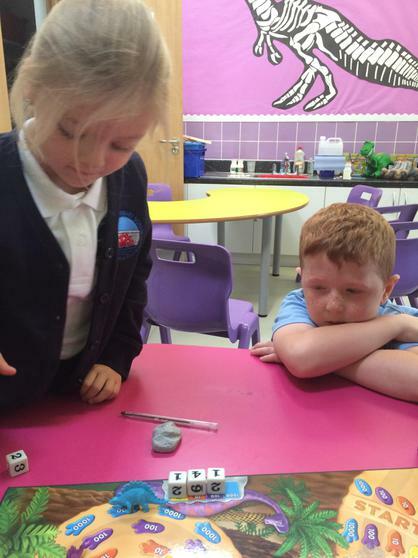 Not only are we dressing up but we're also using our numeracy skills to count money, our social skills to communicate with customers and developing our teamwork with friends. 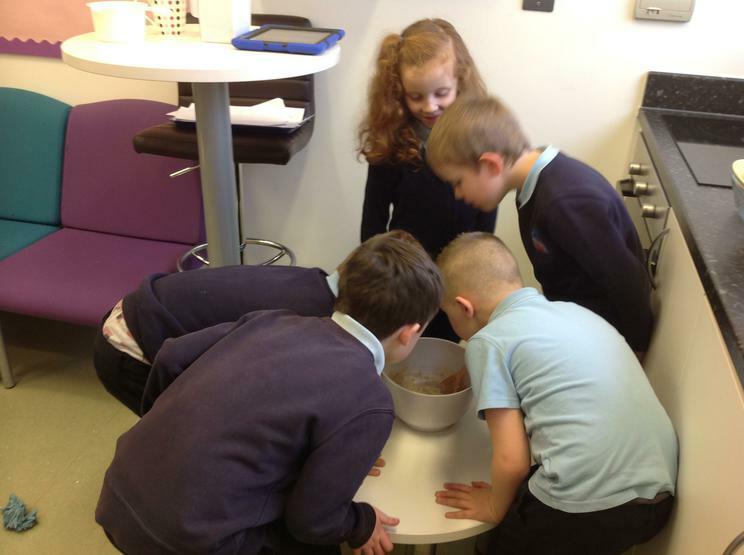 We went on a hunt to match the cupcakes to the right amount of money that Pudsey had in his bag. 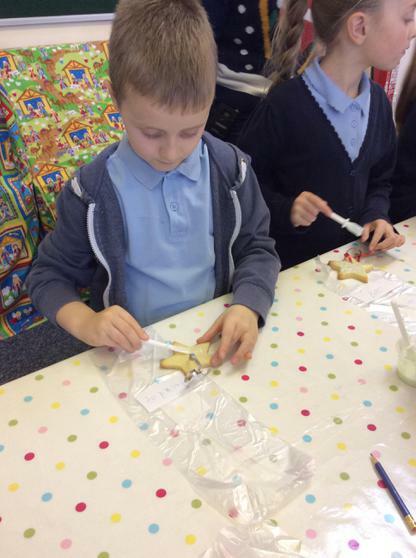 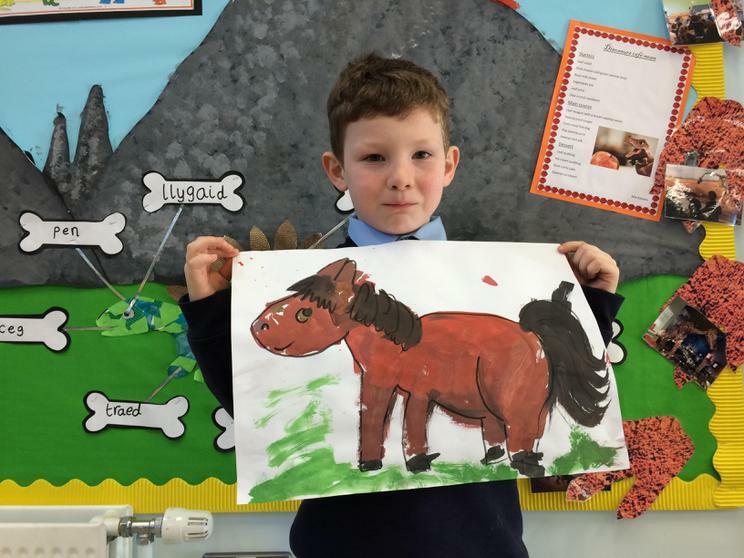 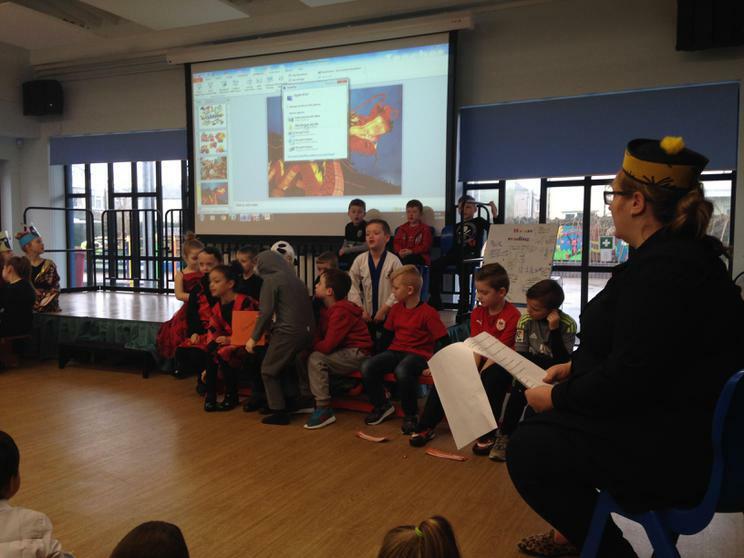 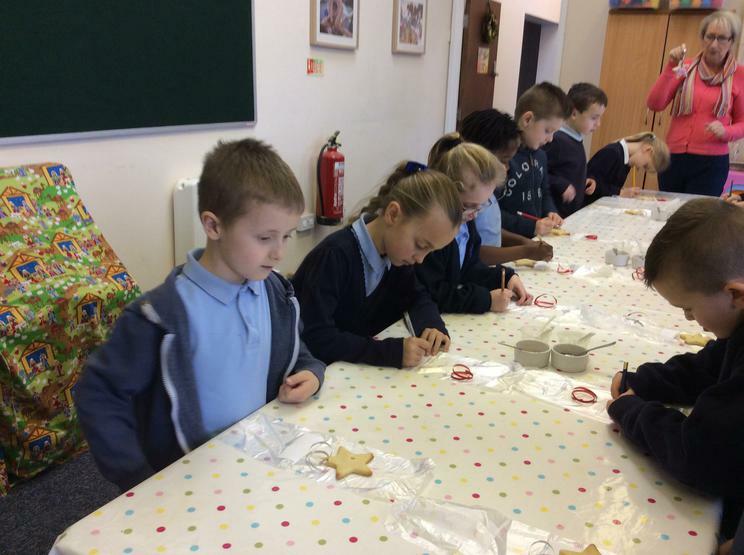 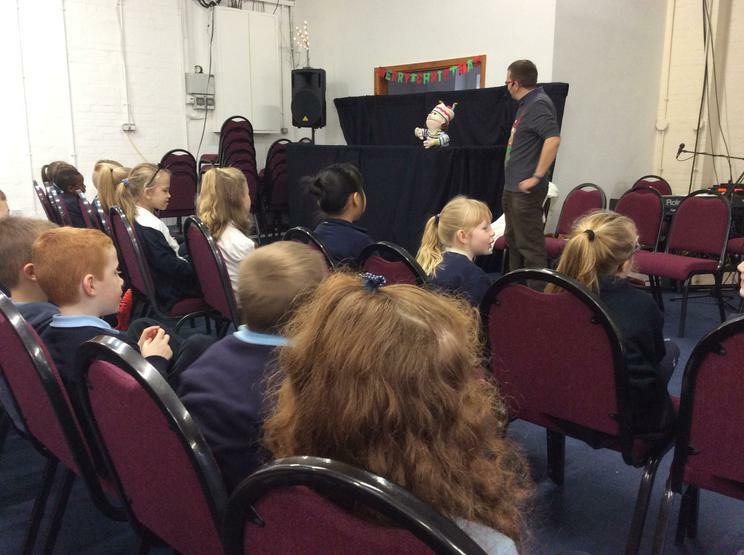 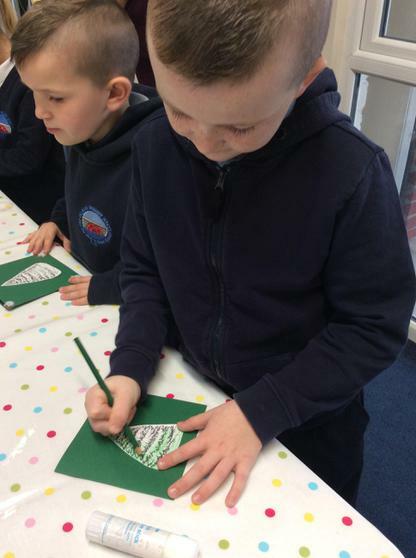 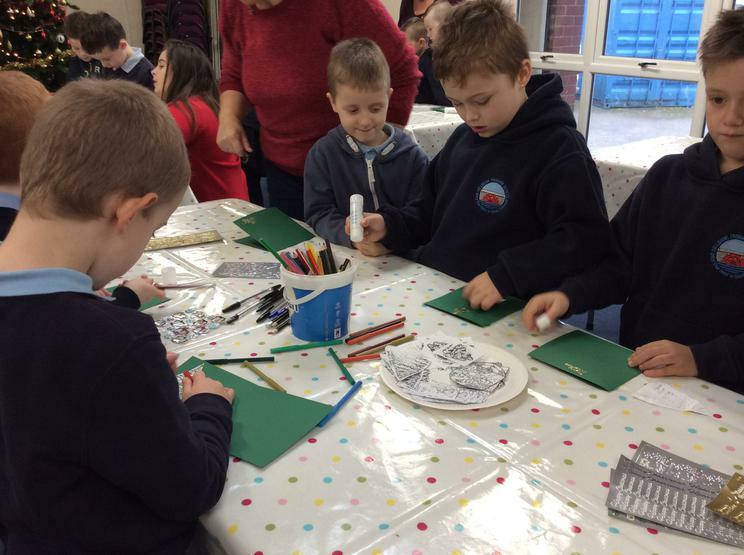 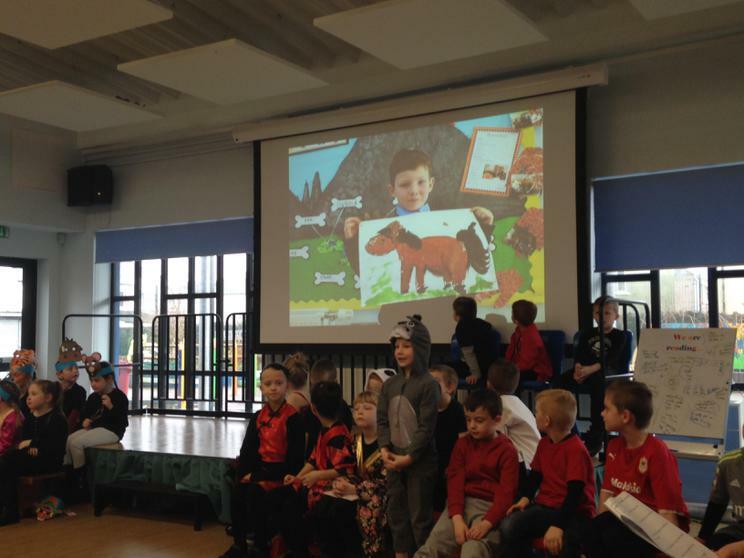 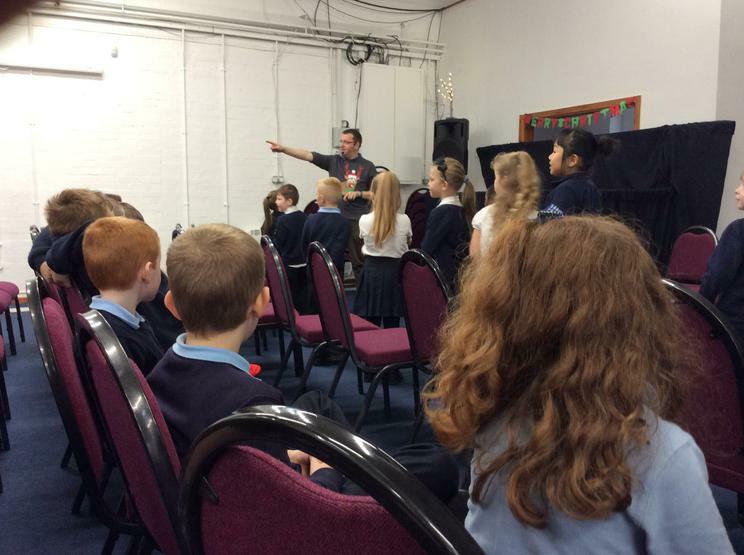 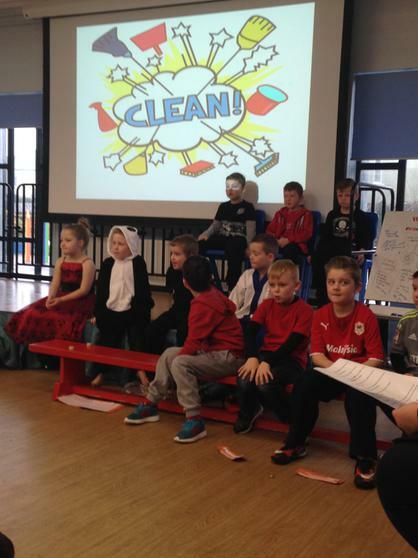 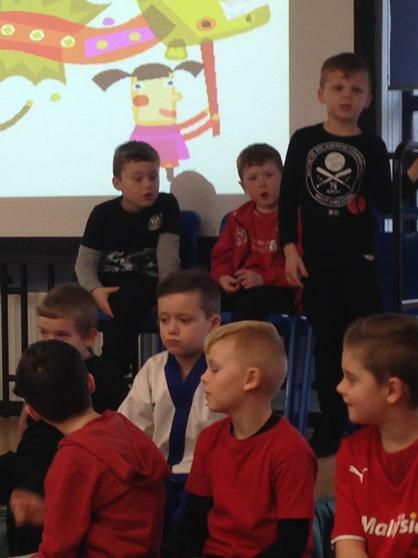 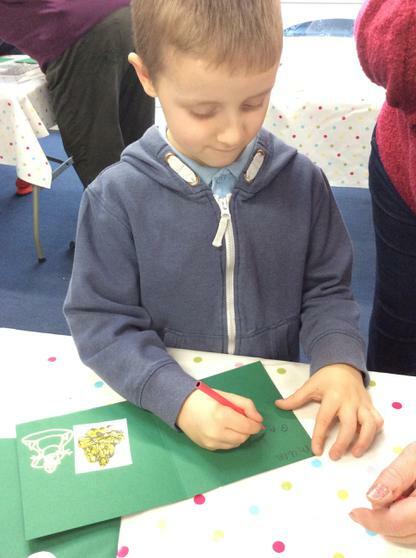 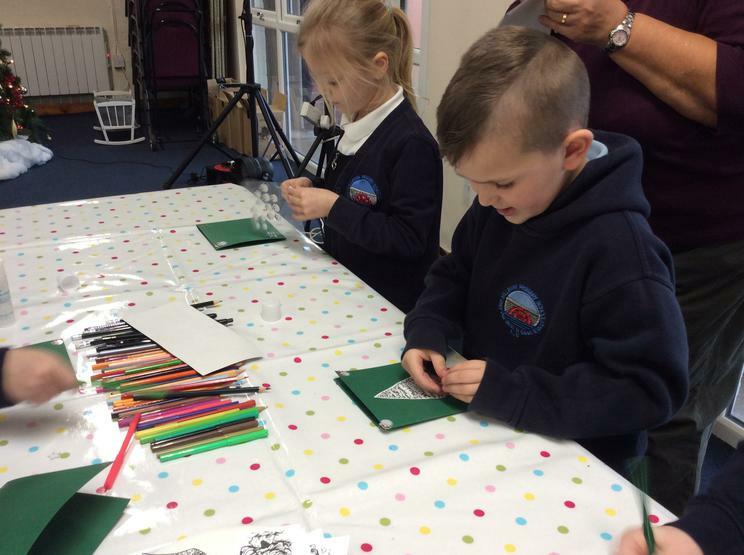 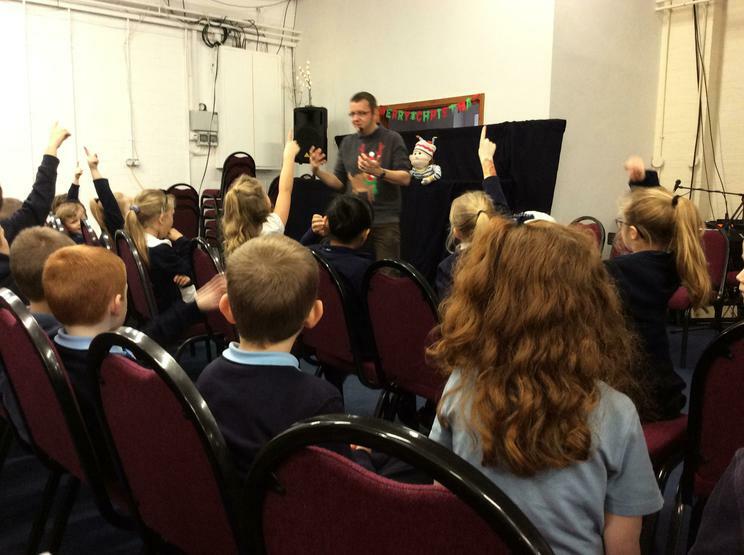 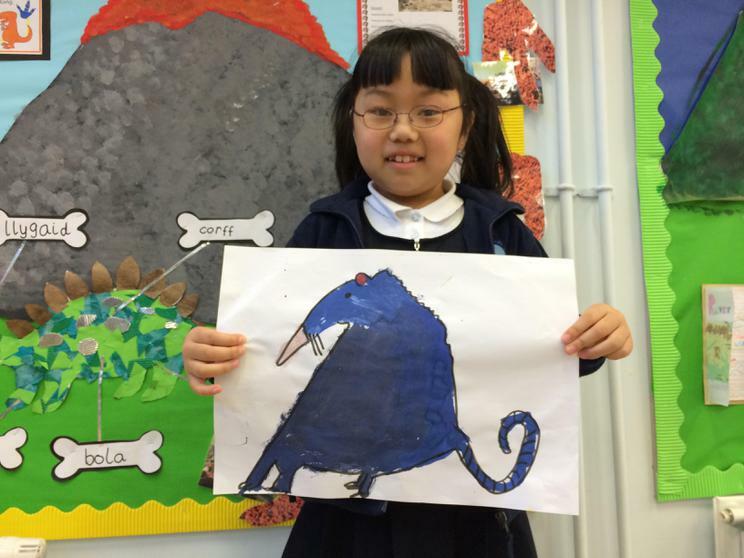 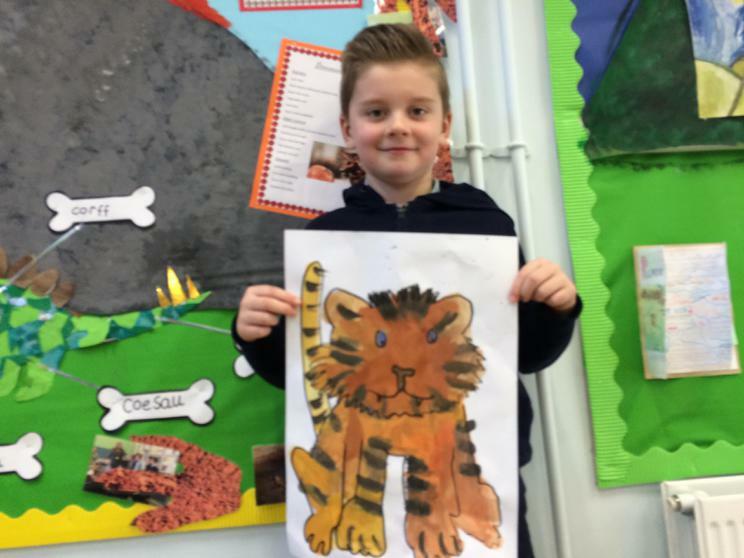 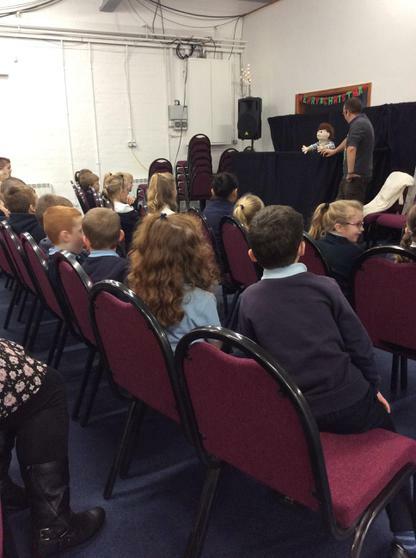 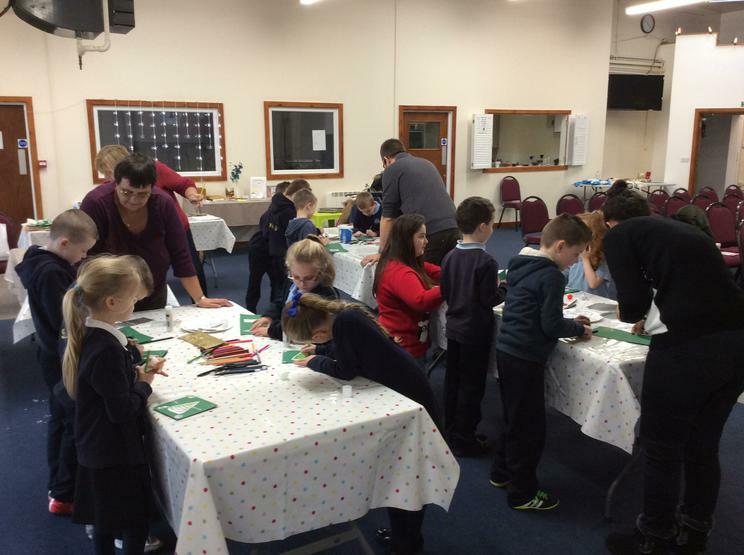 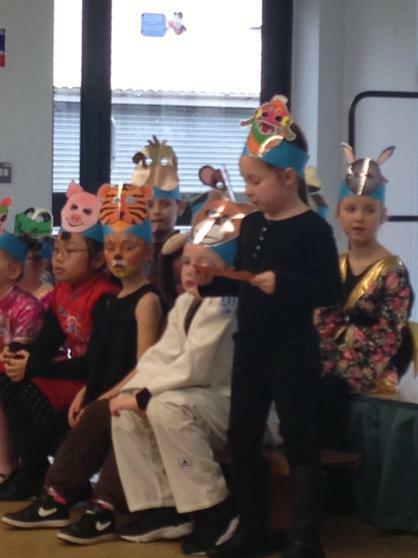 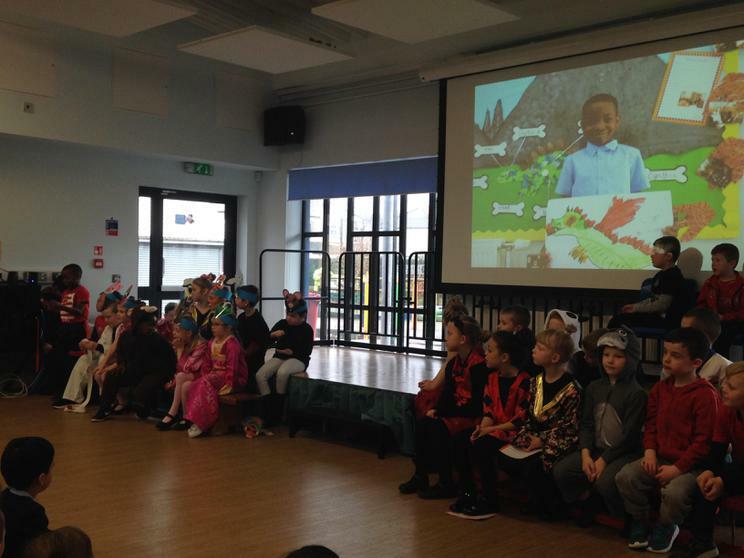 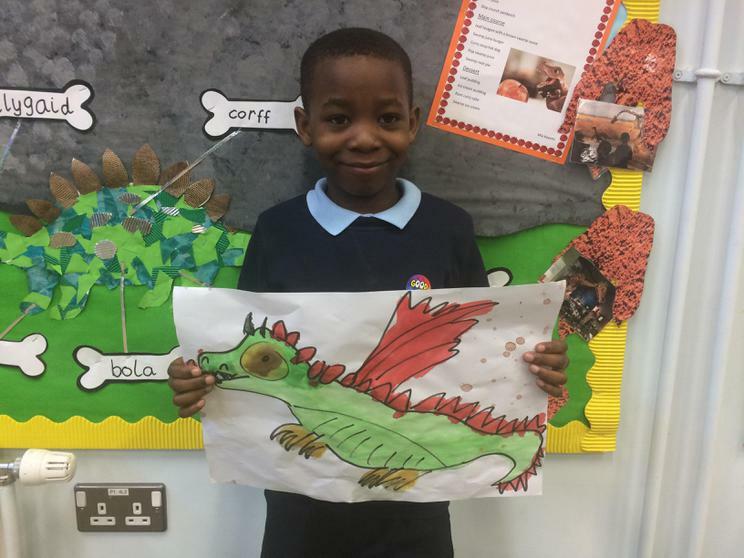 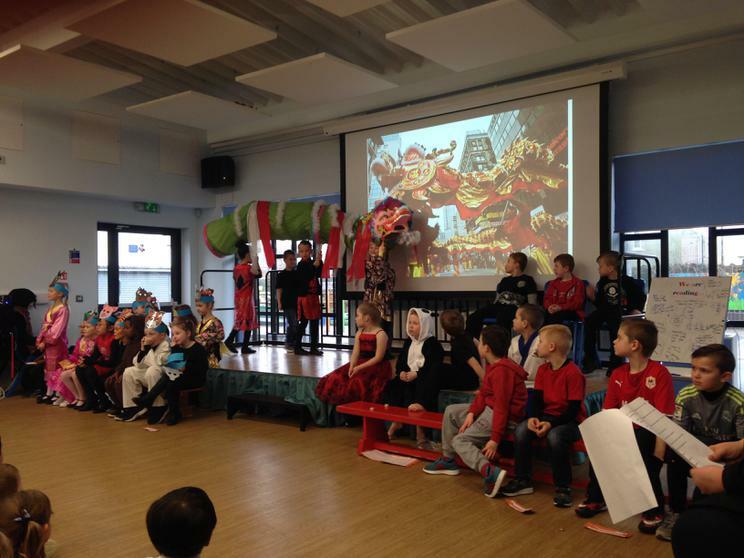 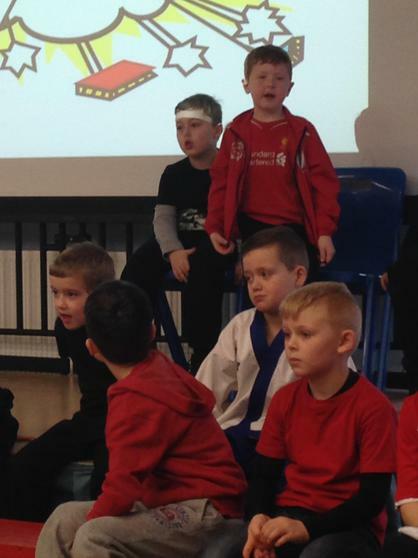 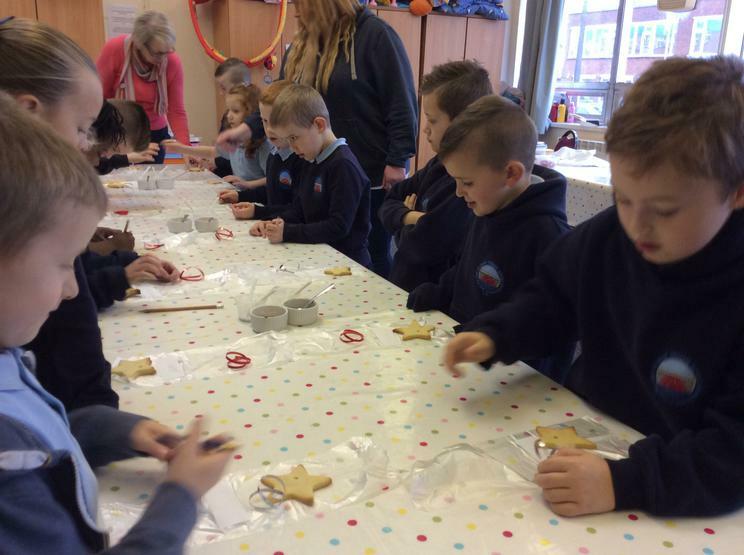 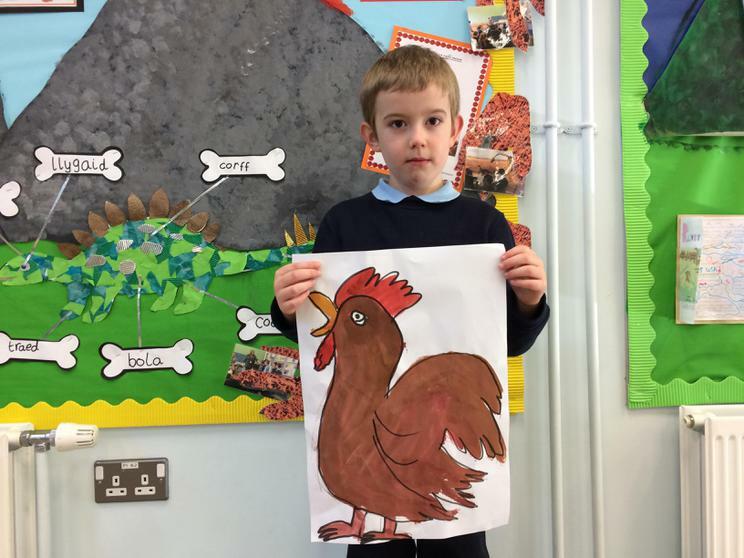 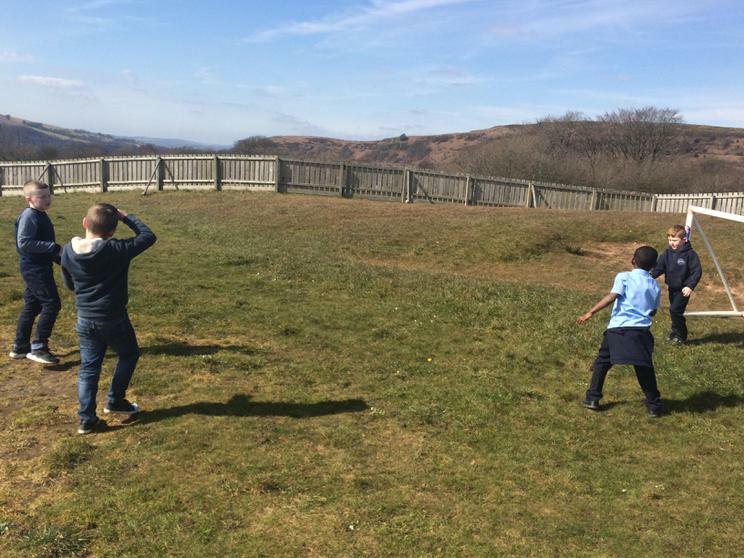 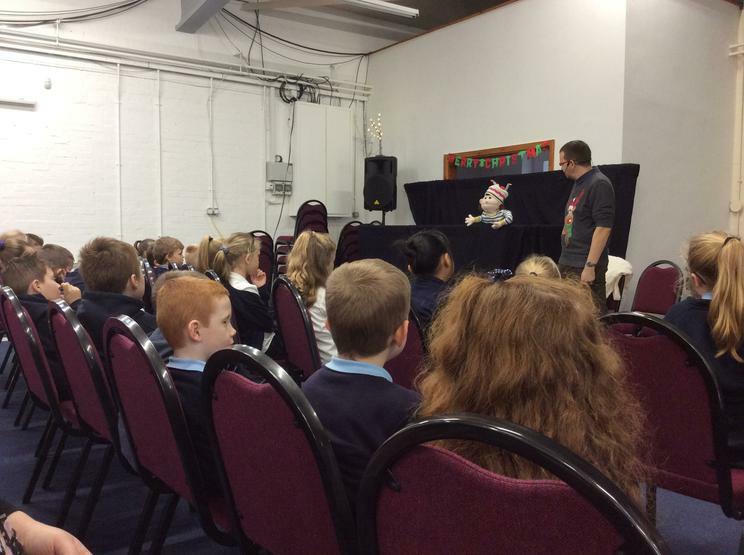 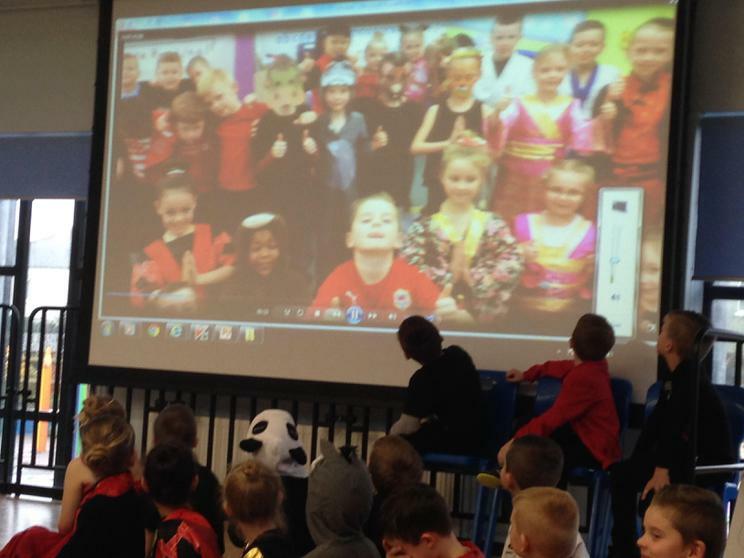 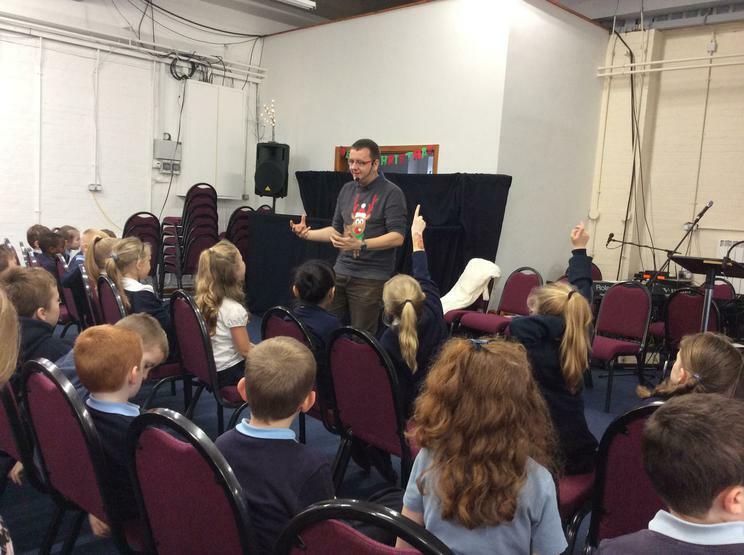 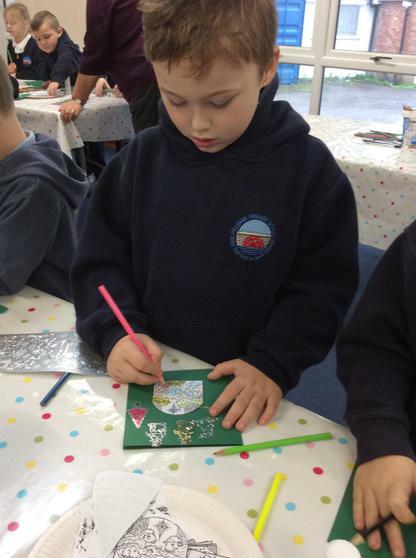 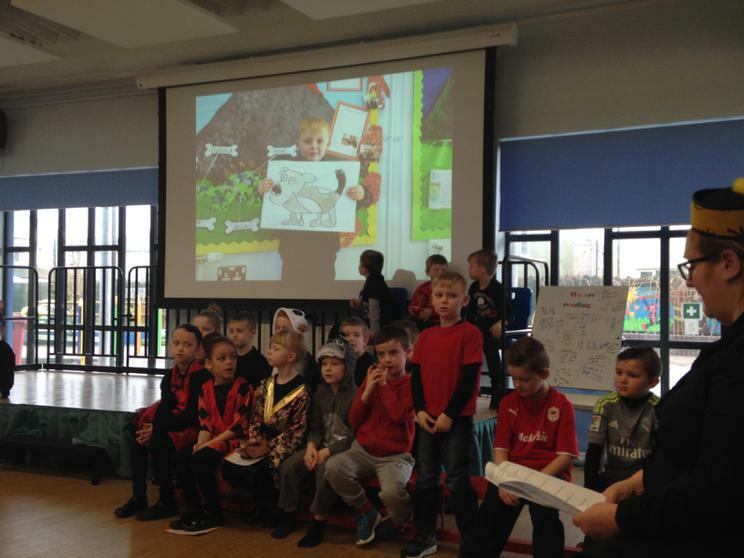 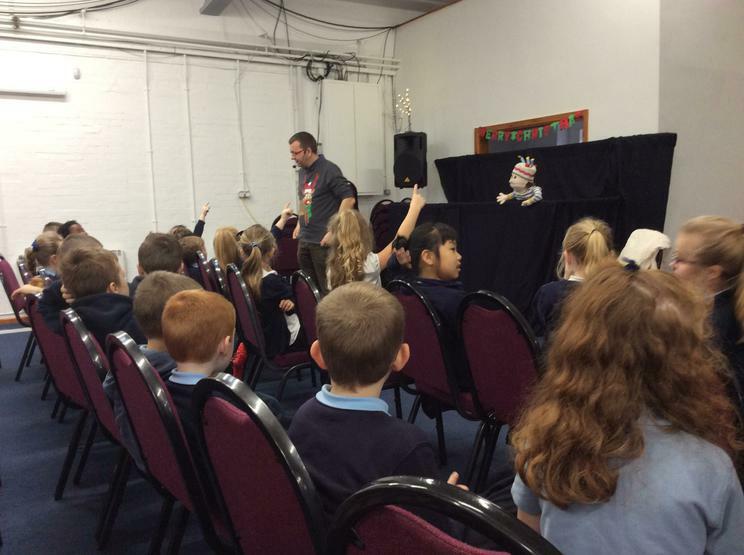 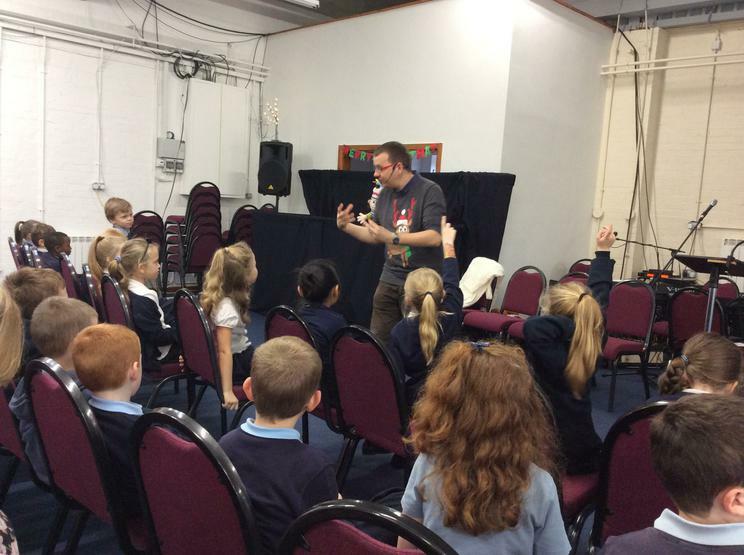 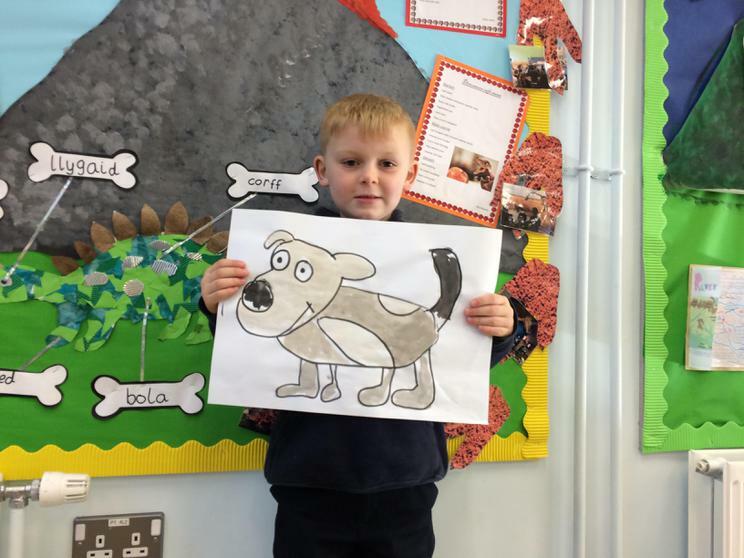 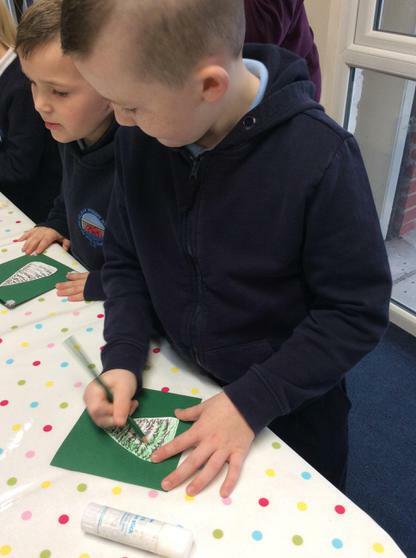 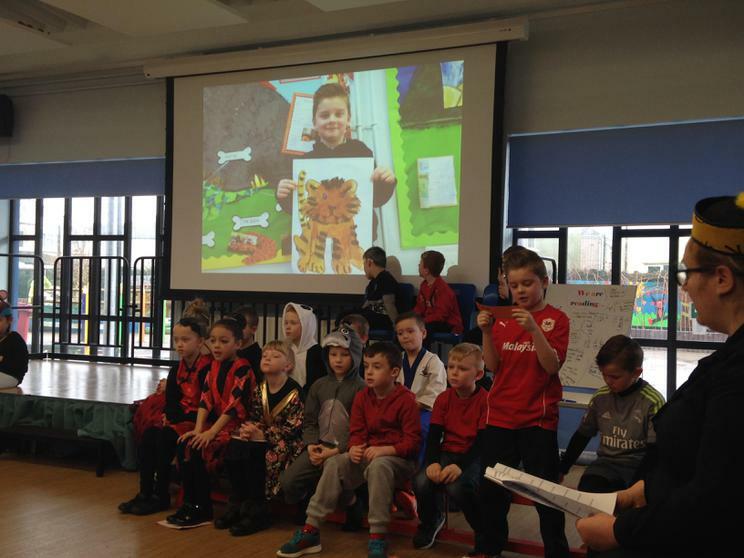 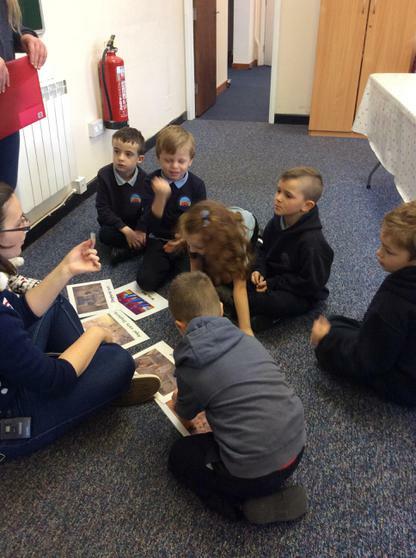 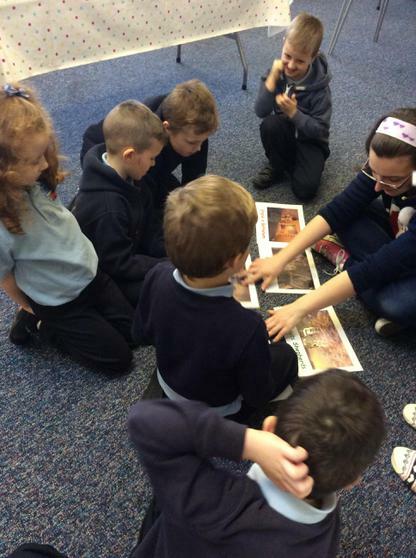 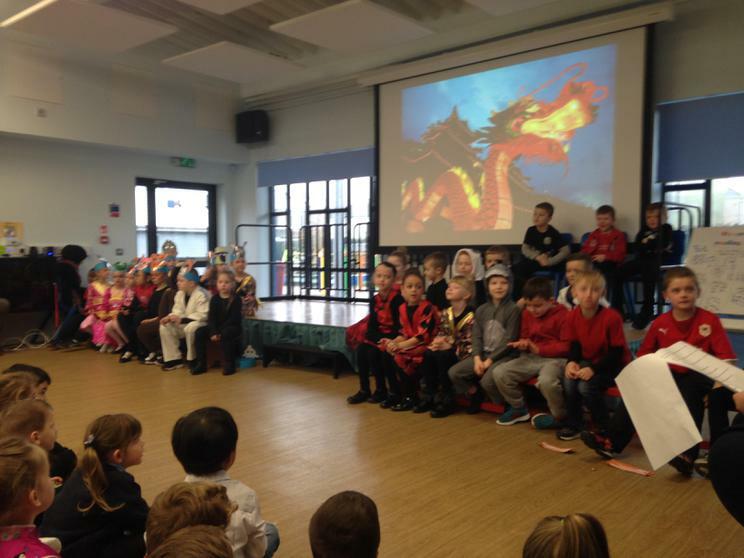 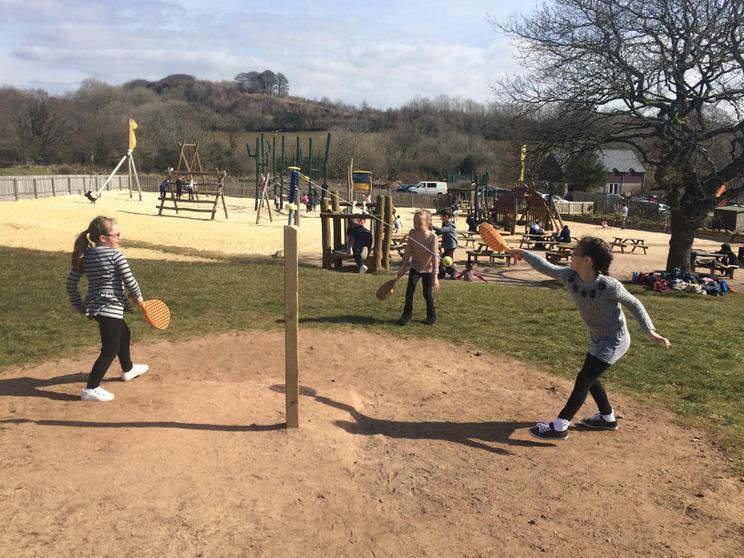 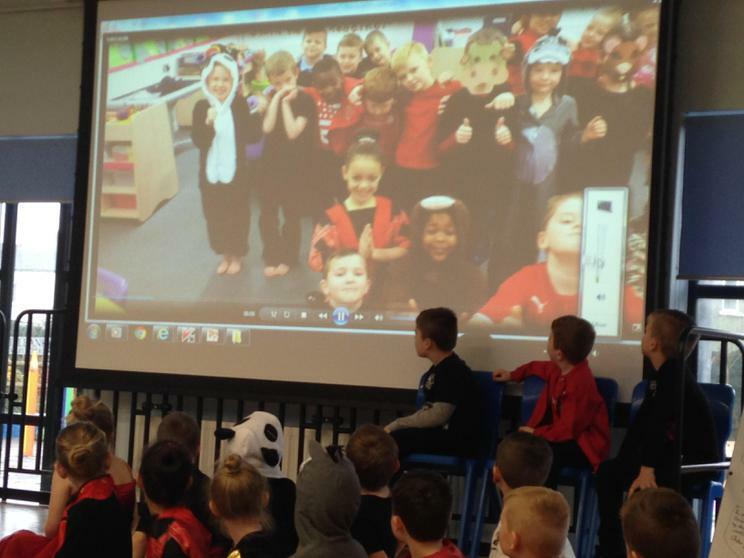 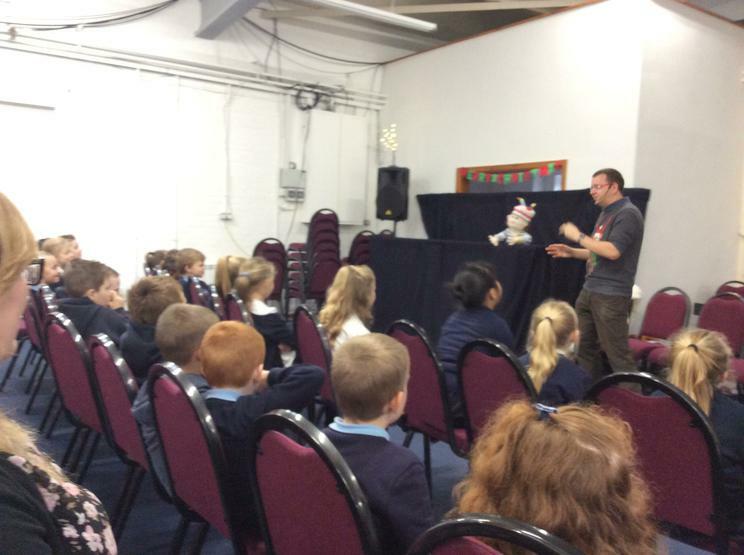 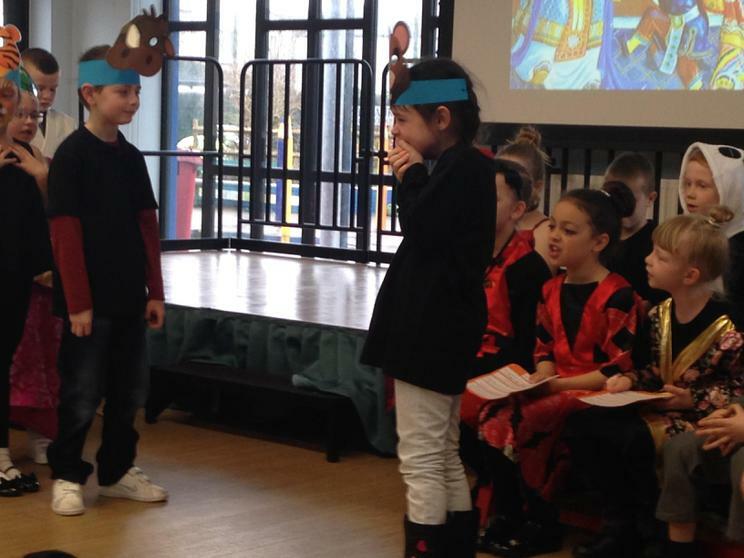 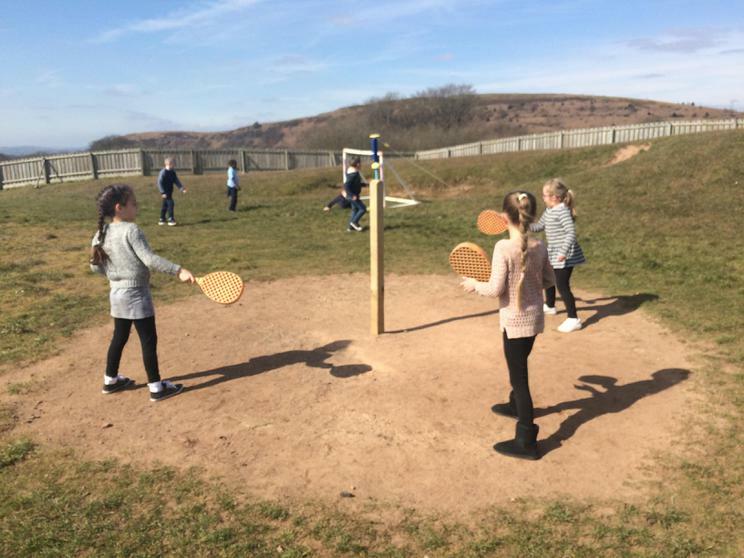 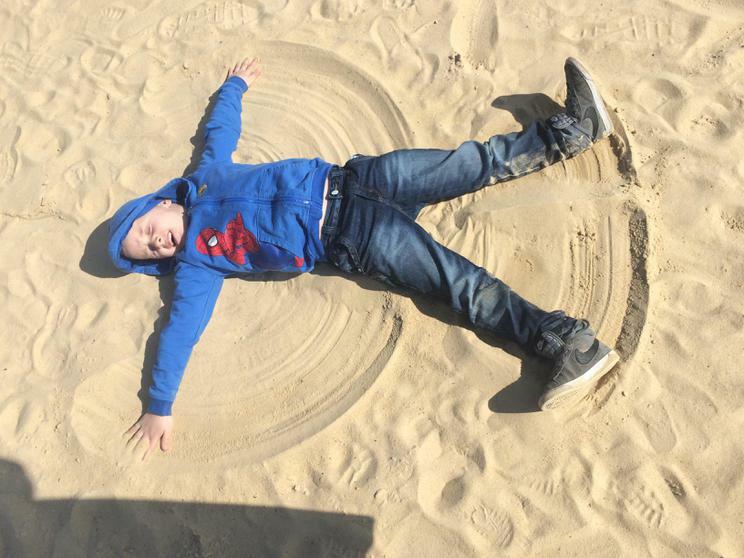 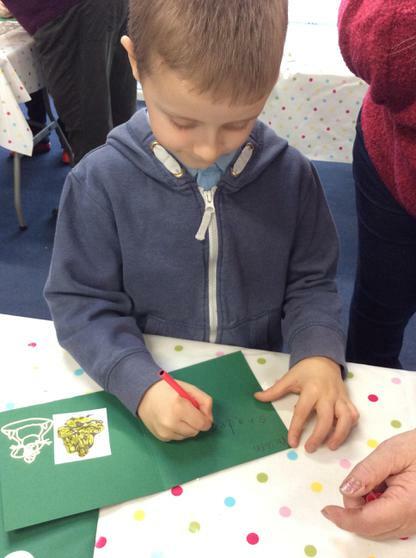 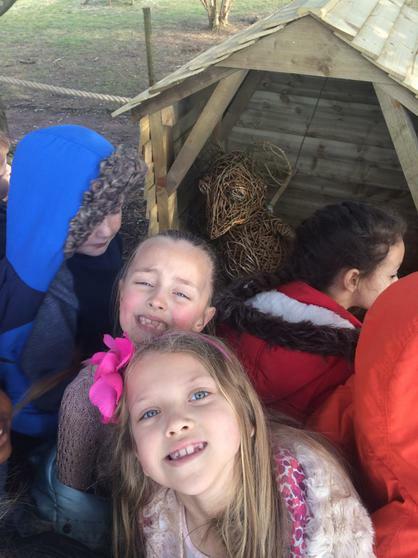 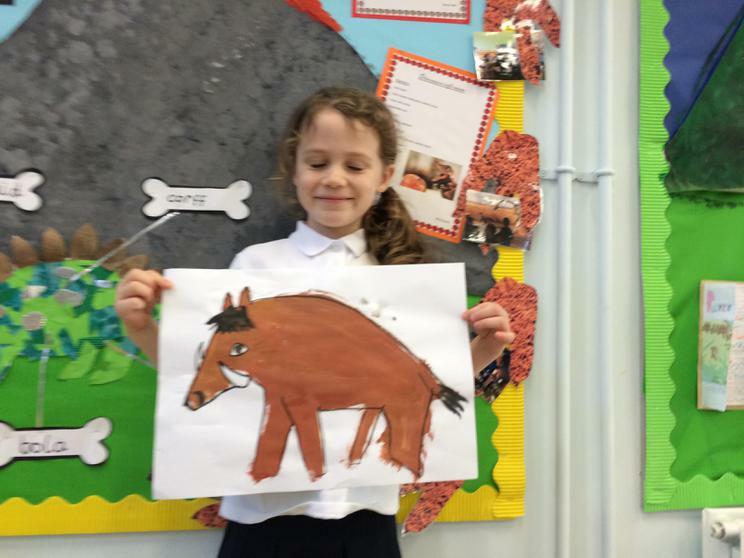 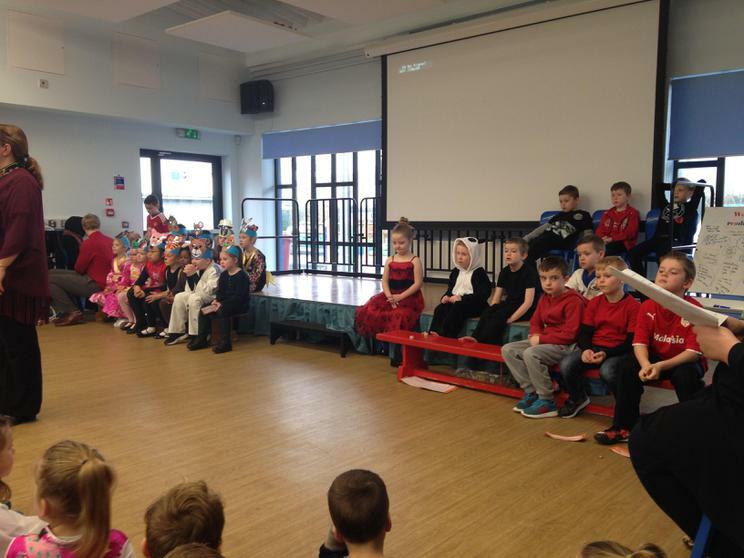 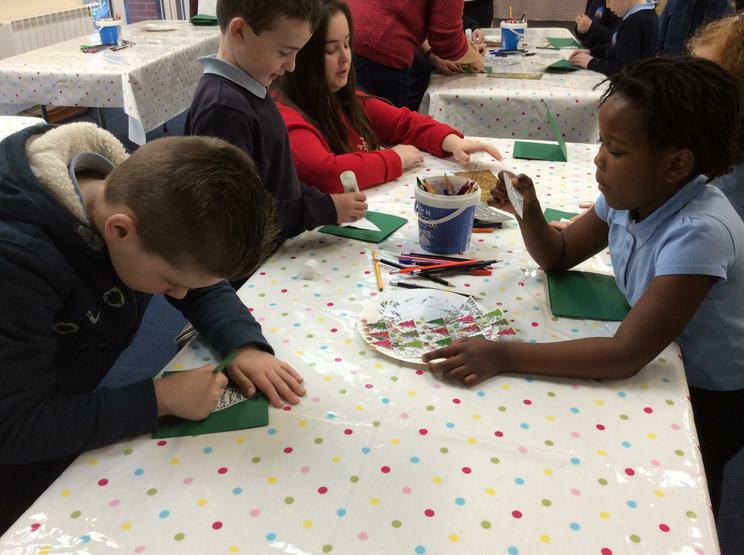 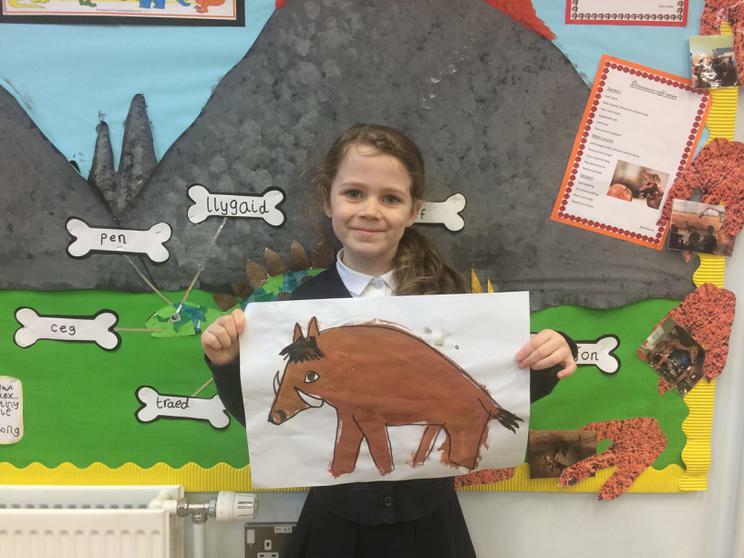 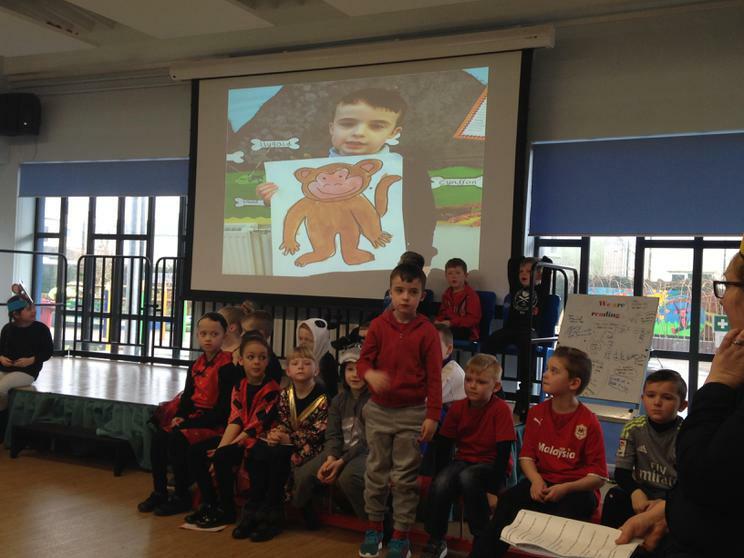 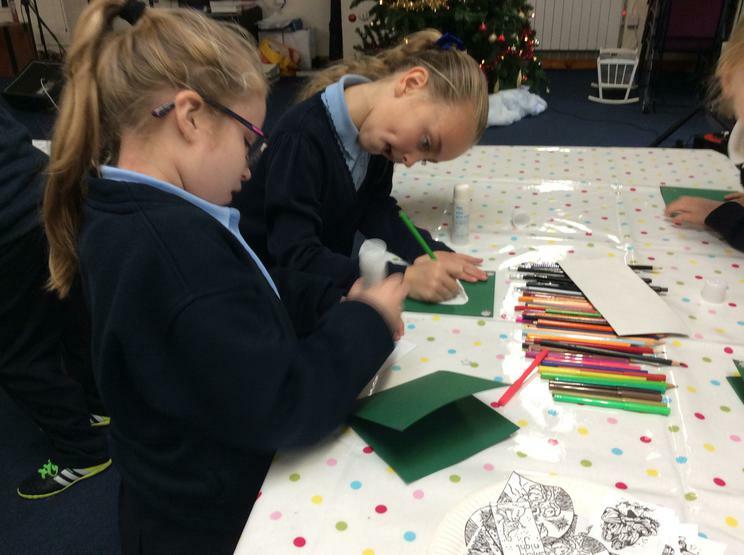 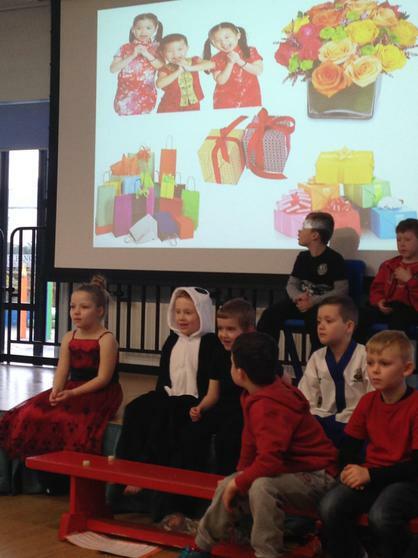 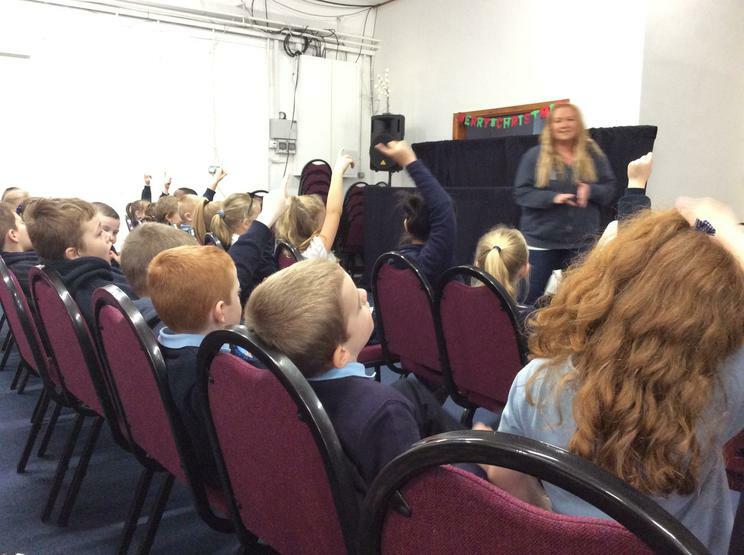 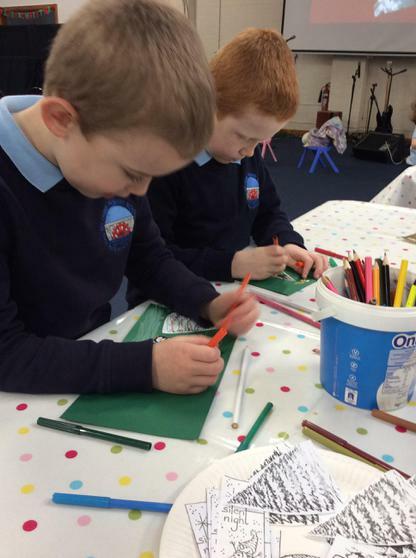 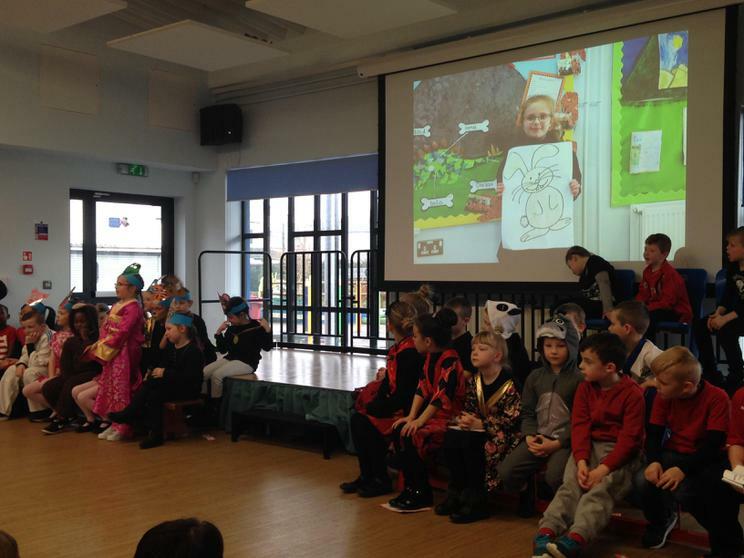 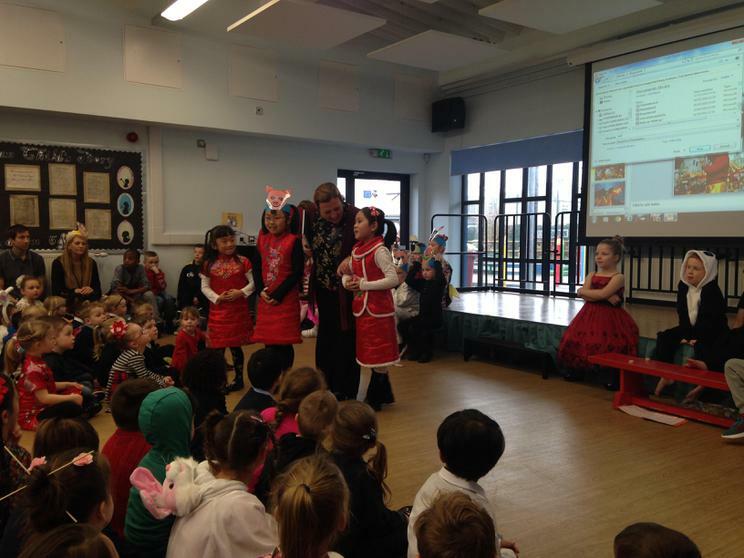 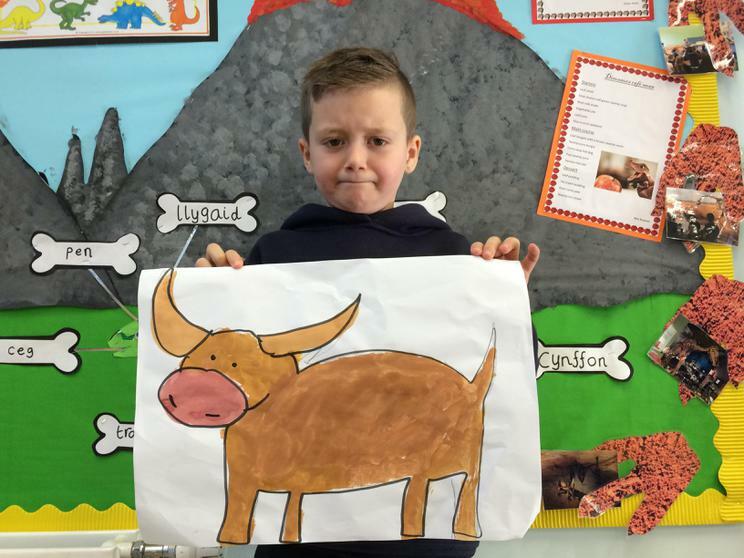 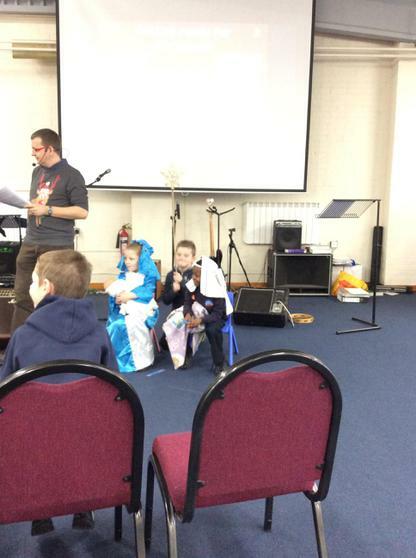 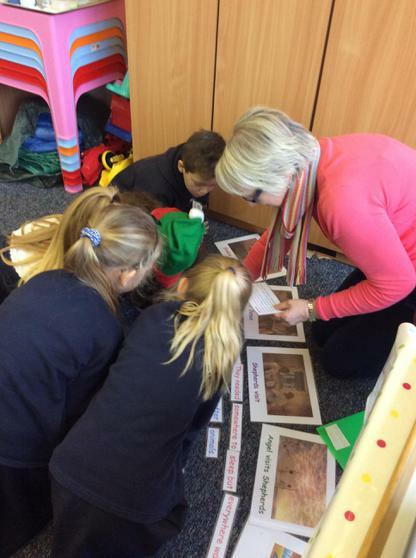 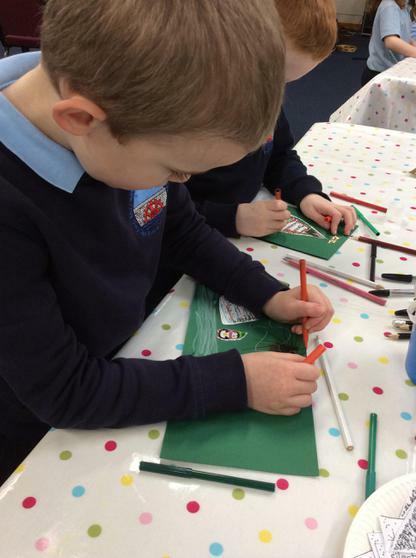 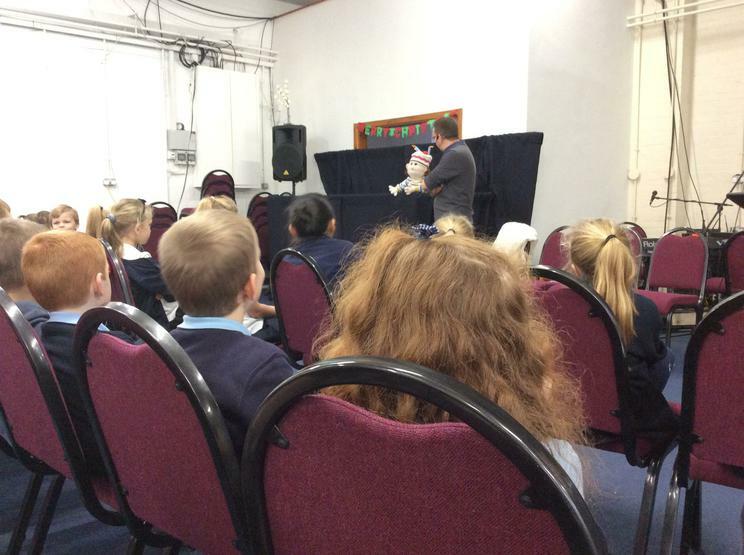 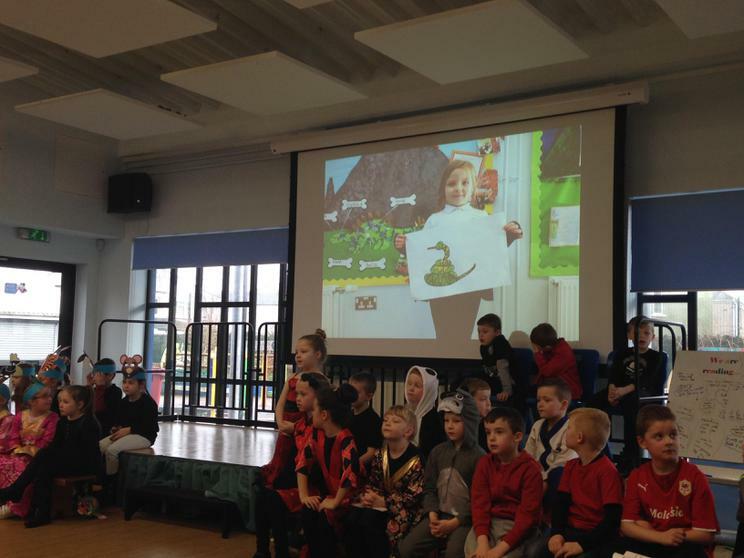 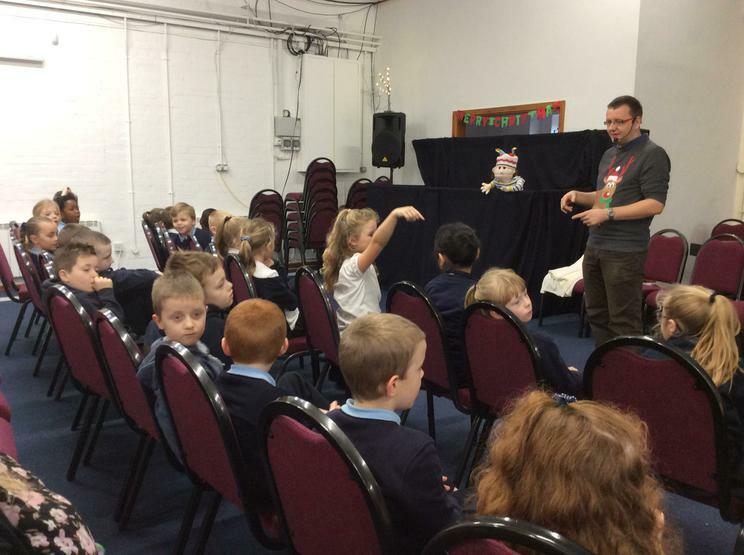 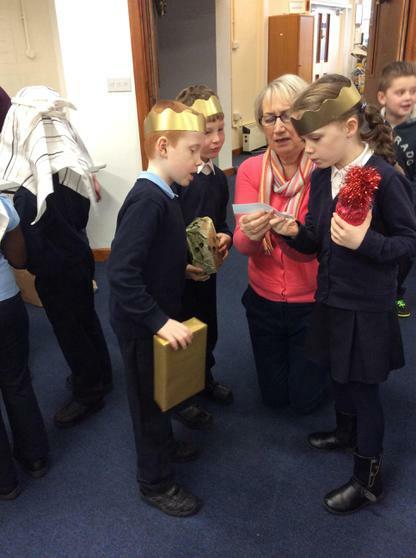 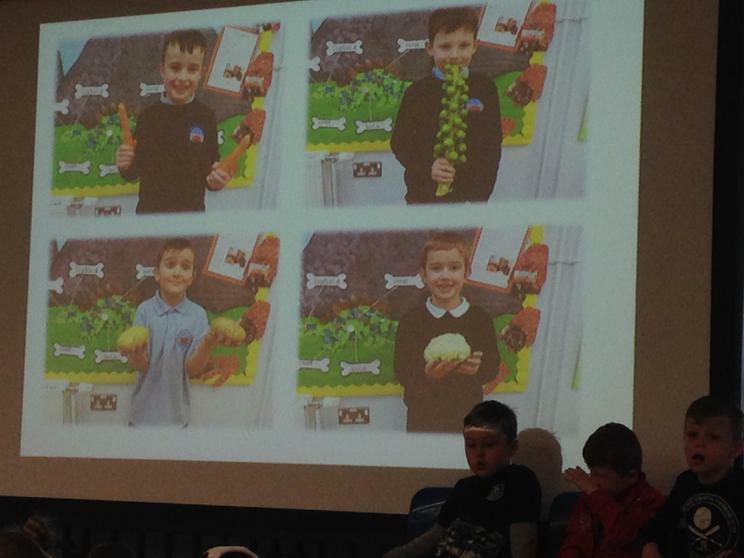 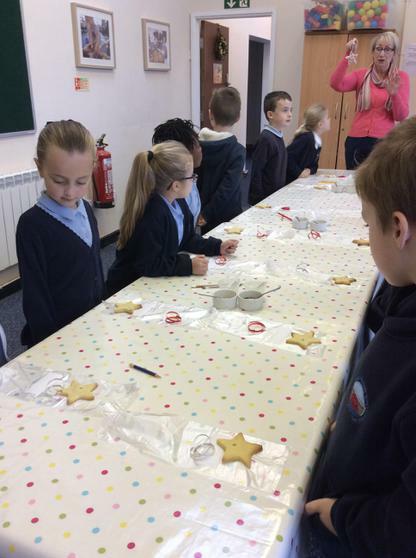 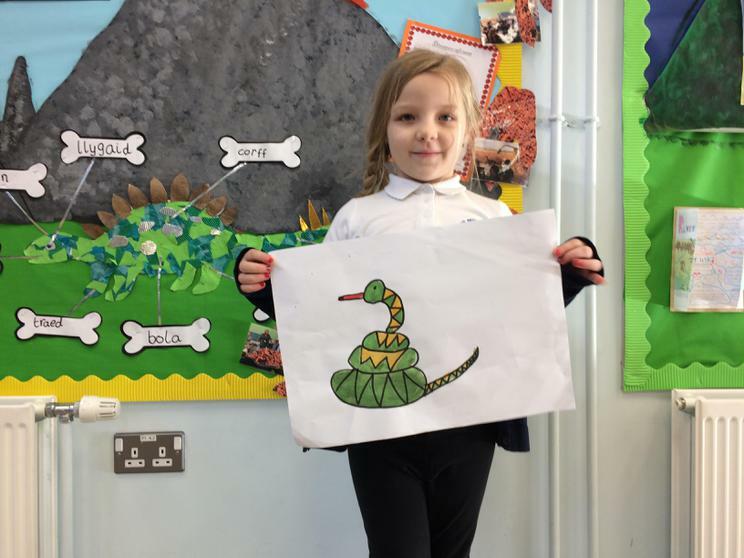 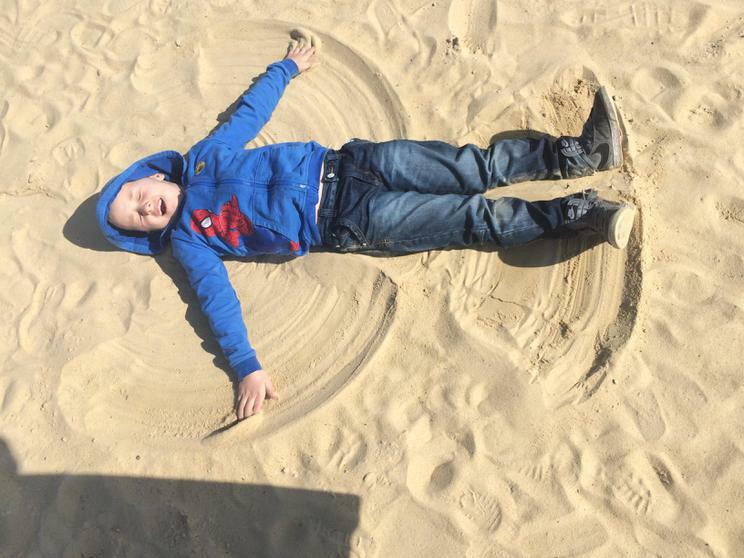 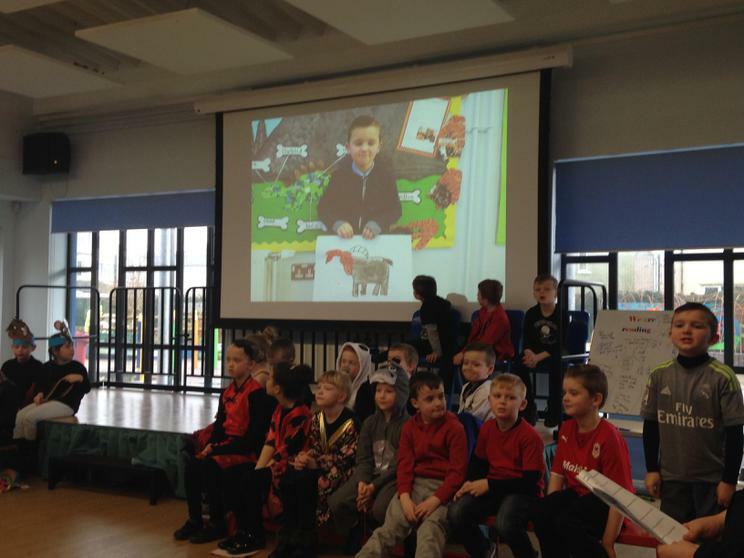 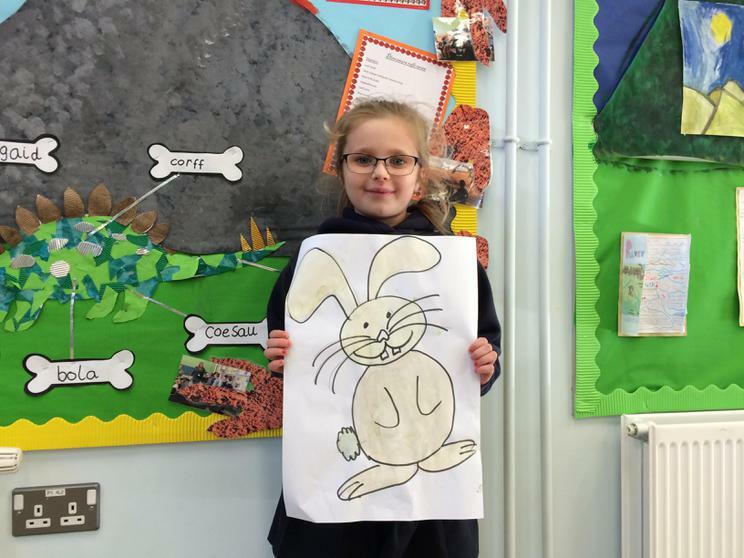 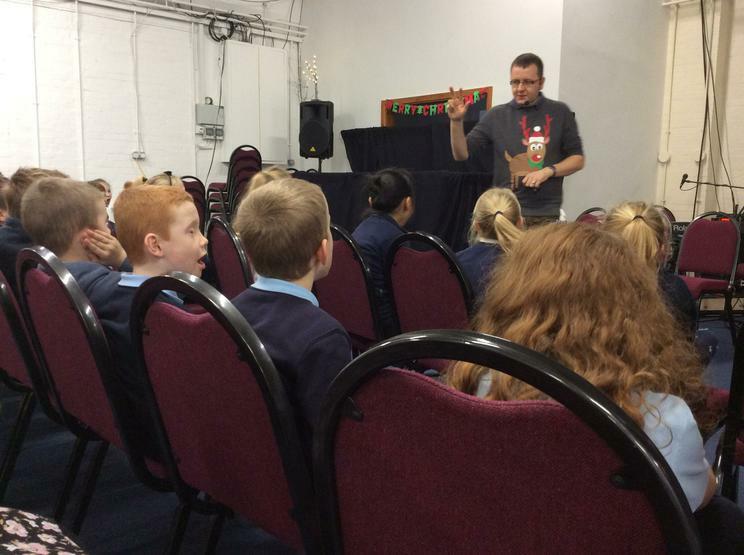 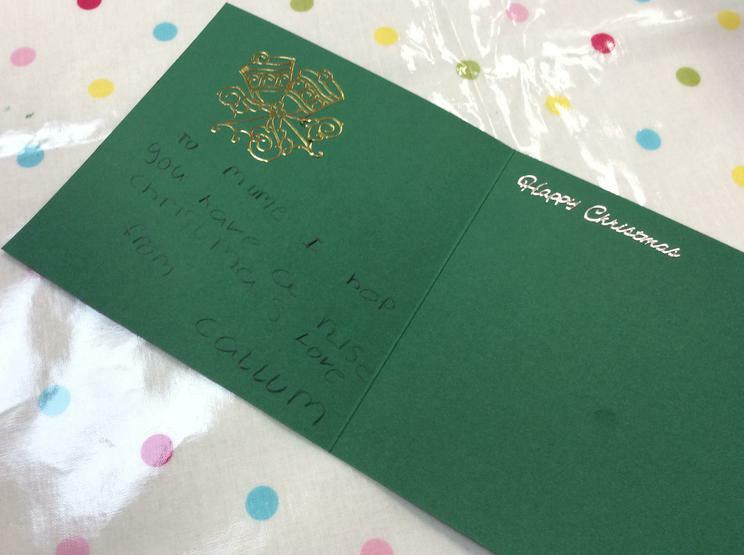 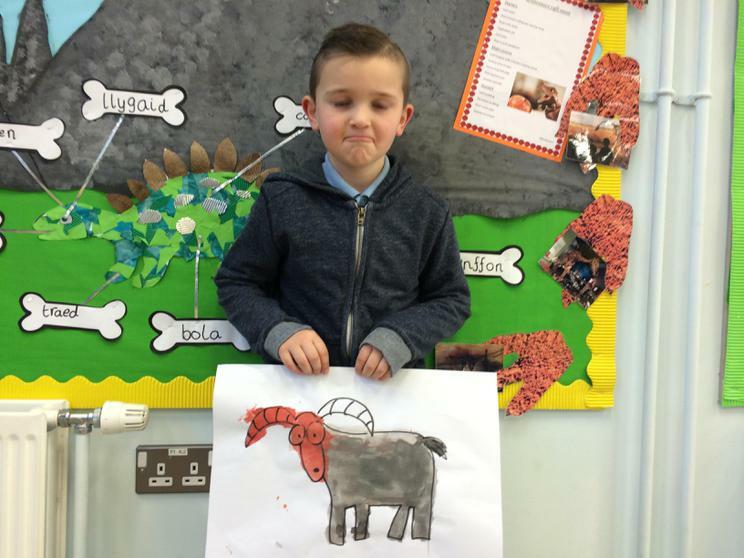 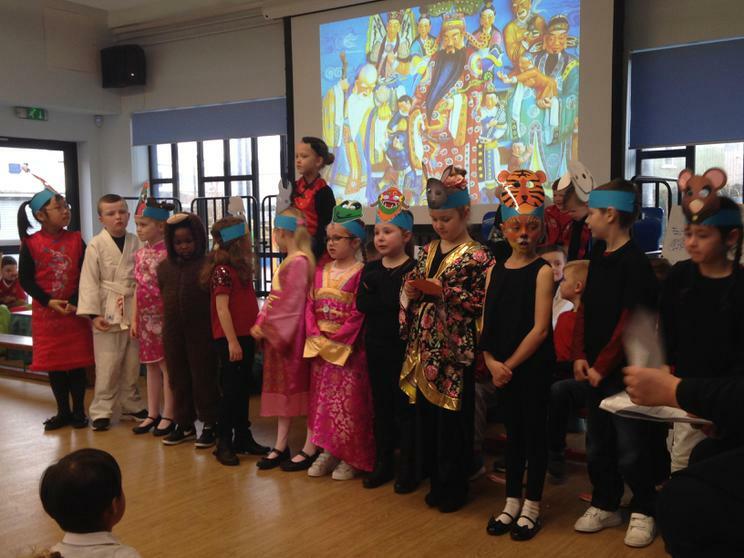 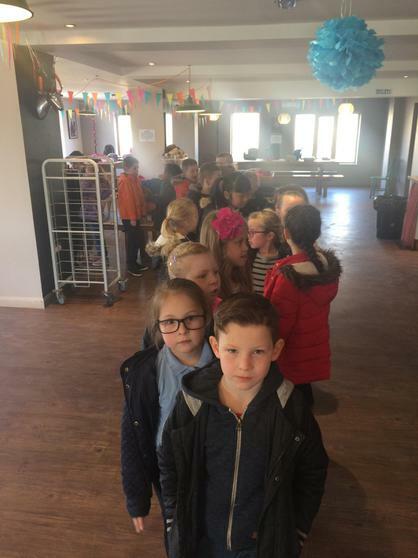 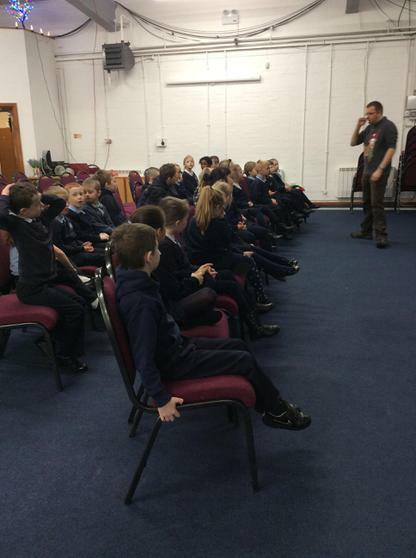 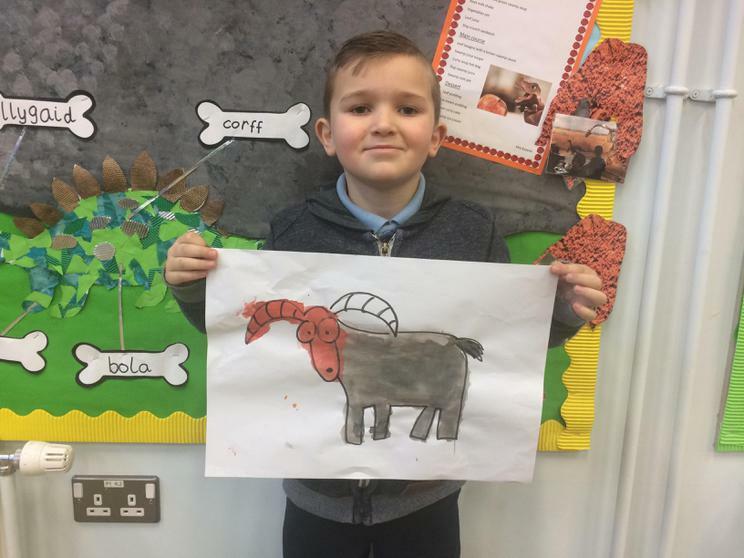 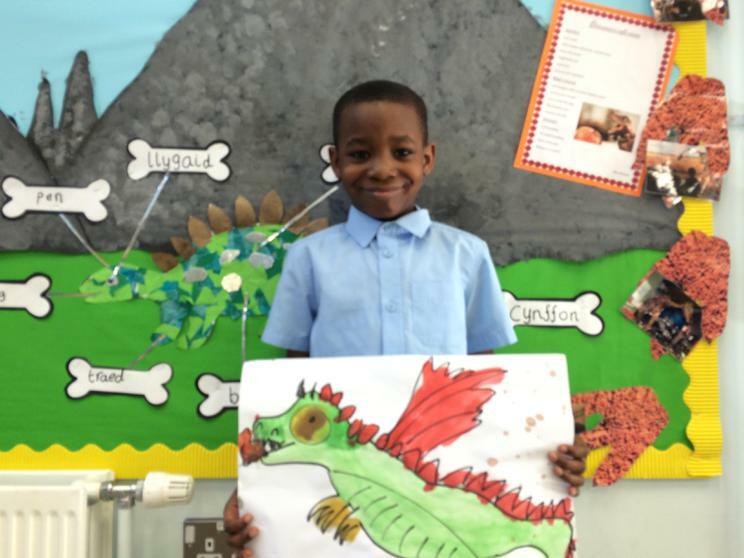 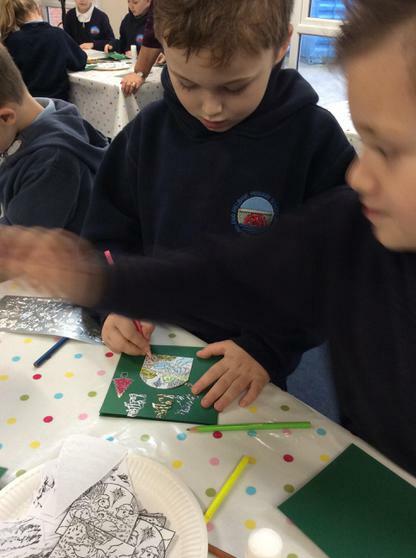 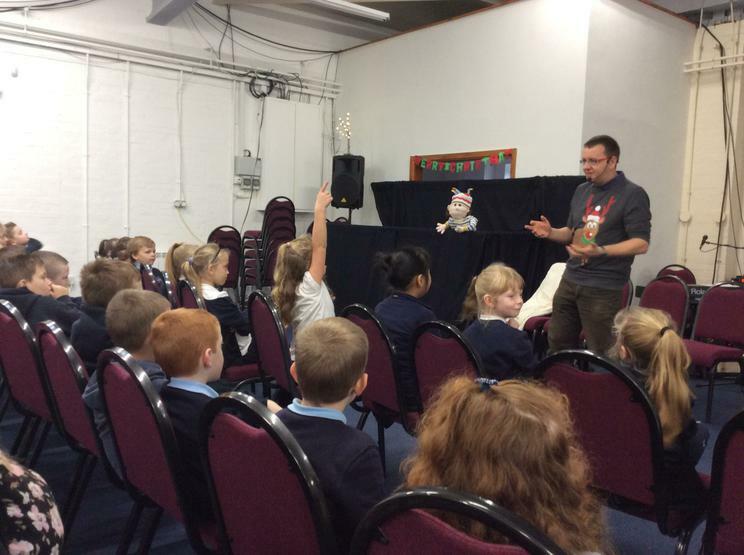 Croeso i ddosbarth blwyddyn 2! 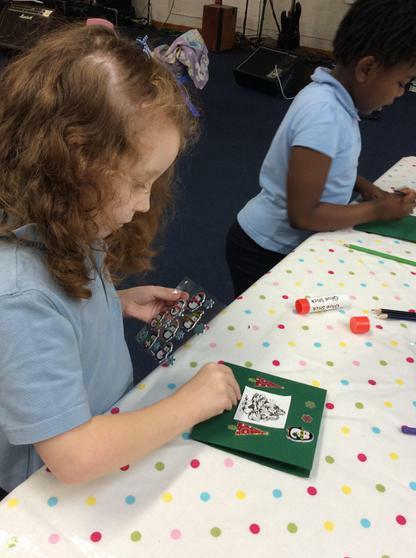 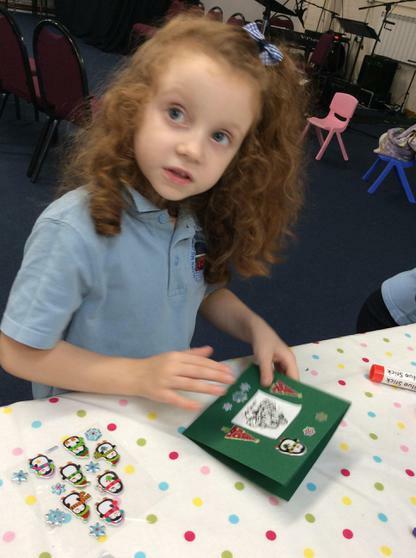 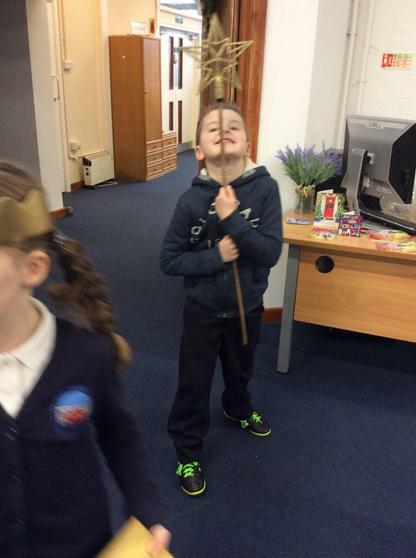 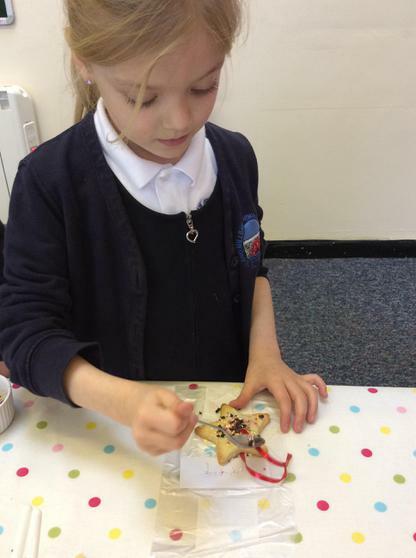 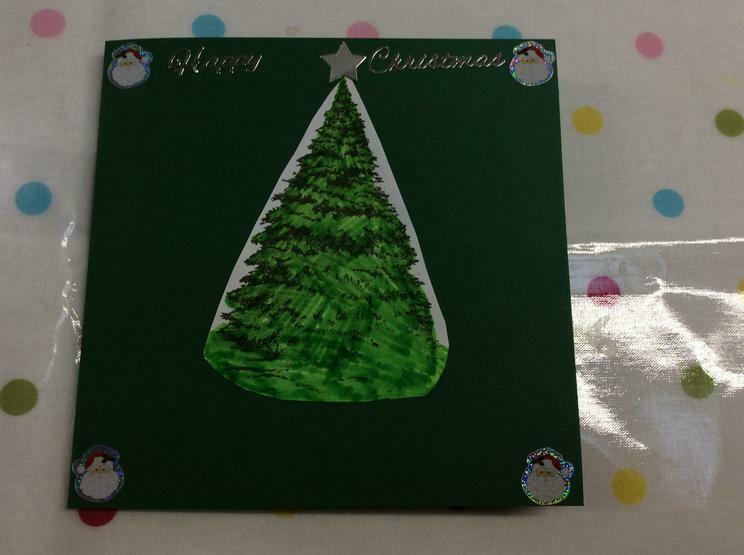 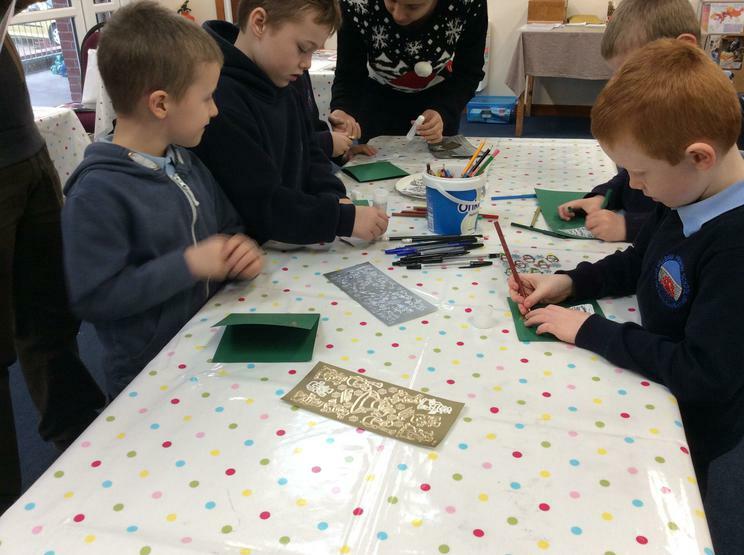 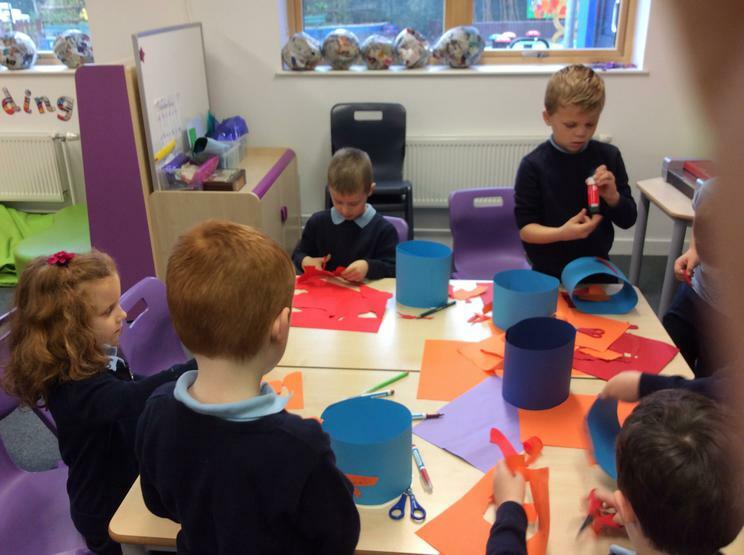 We have got lots of fun activities in store. 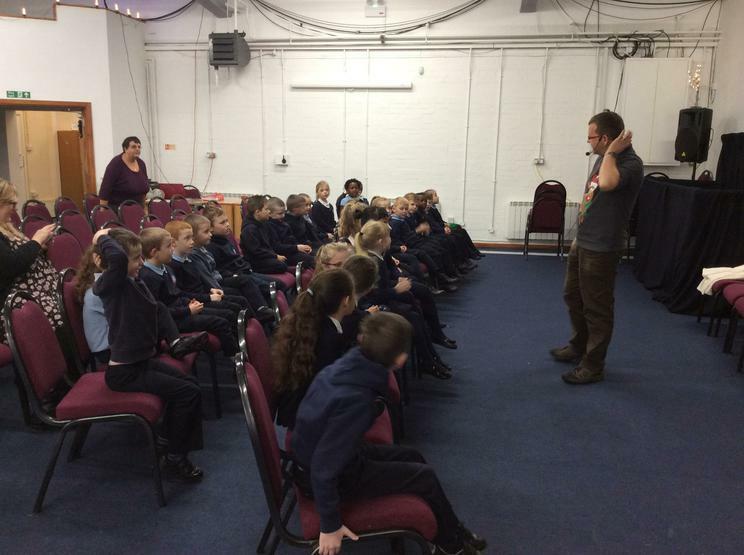 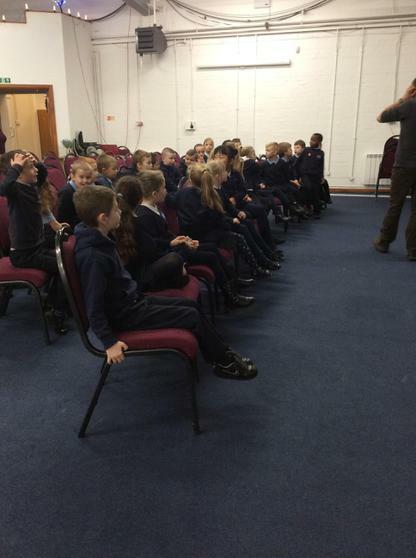 Keep an eye out for picture and videos of our Educational Adventure this year! 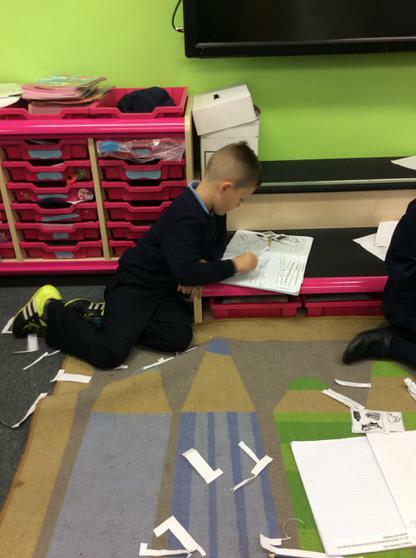 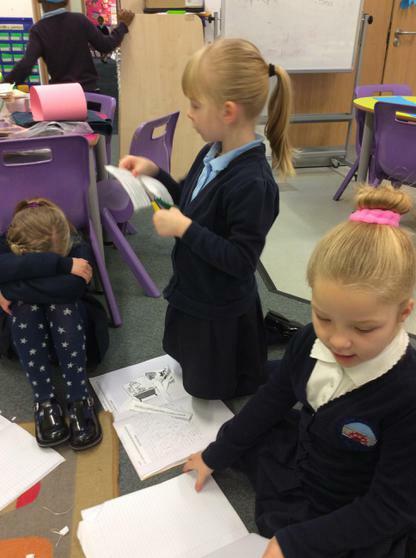 We have been busy writing, reading and following instructions. 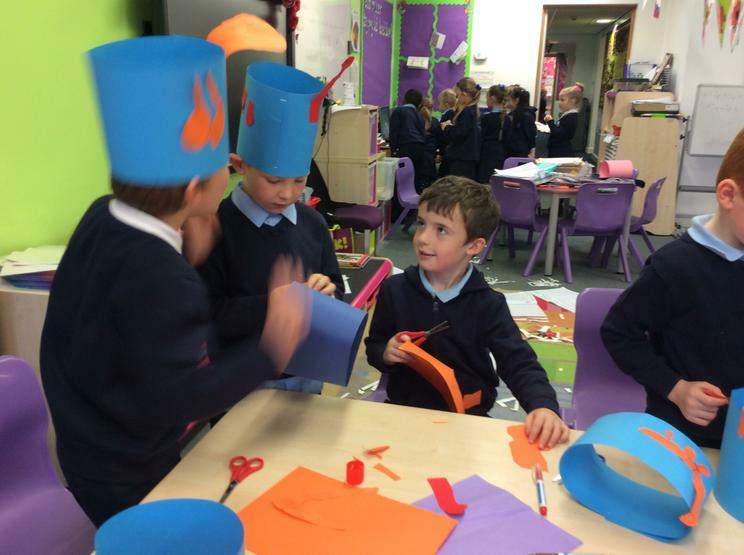 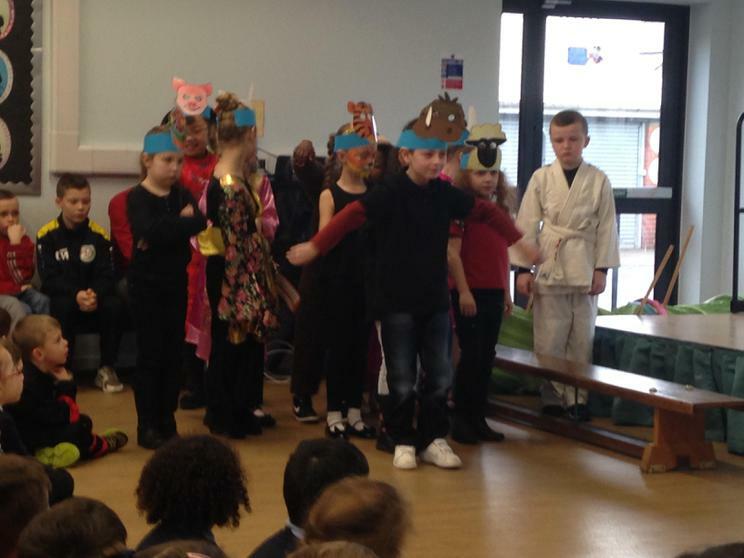 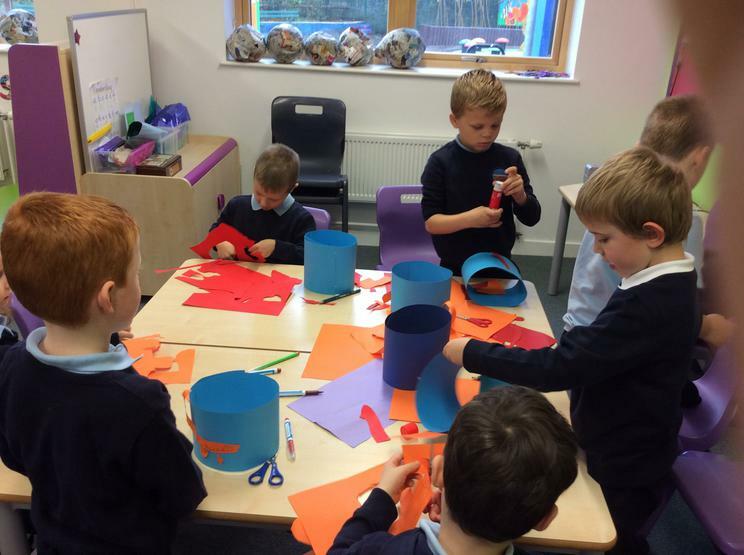 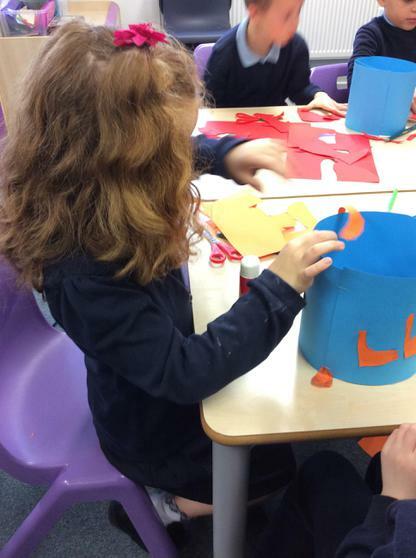 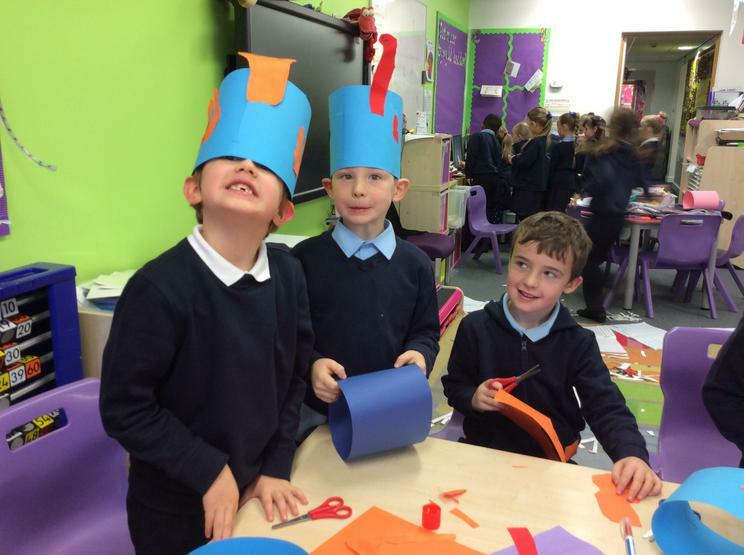 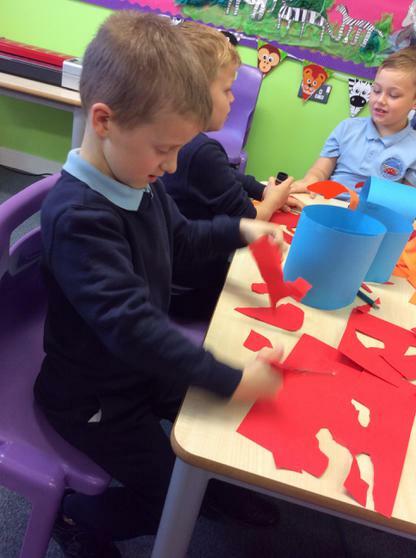 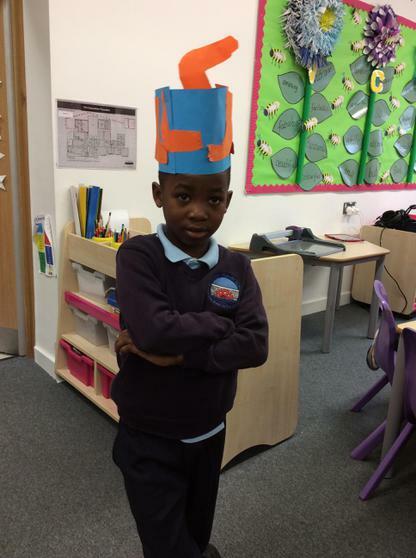 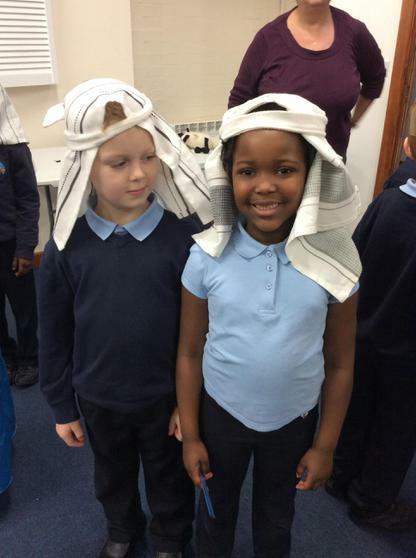 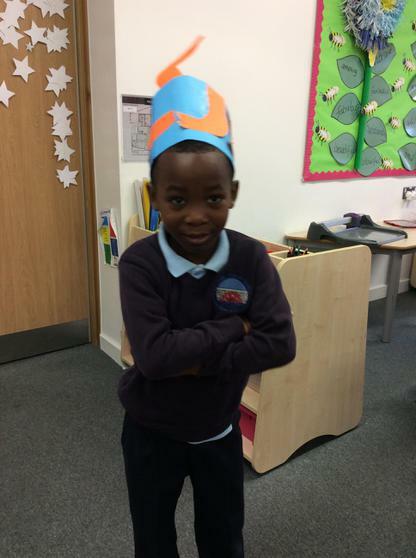 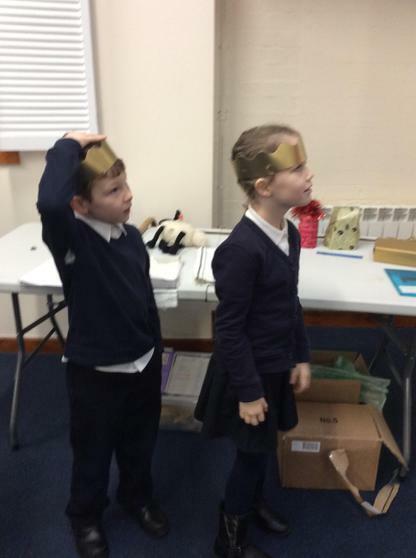 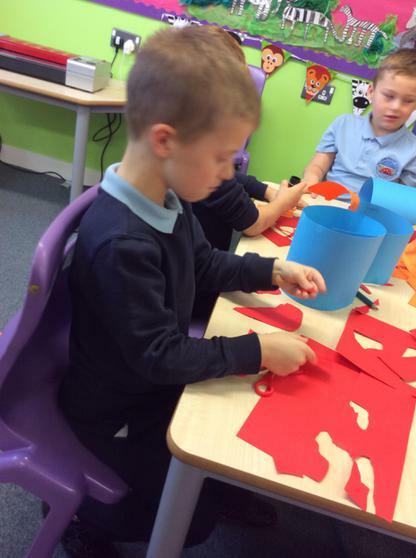 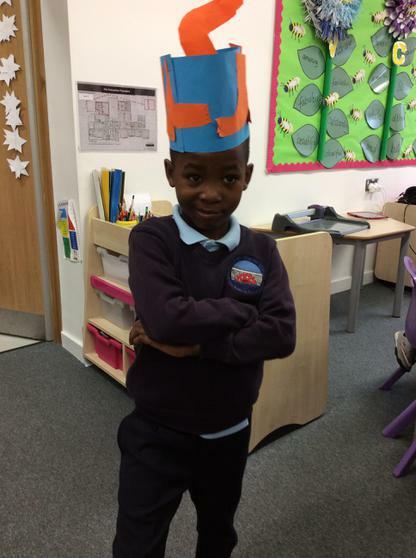 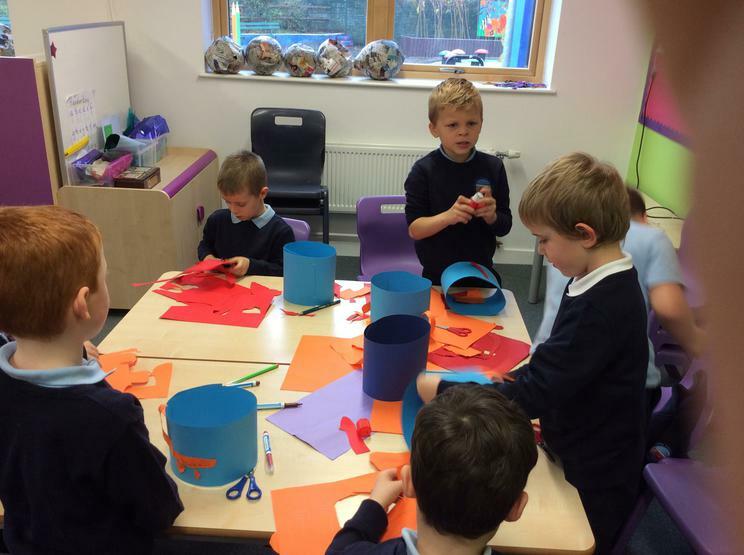 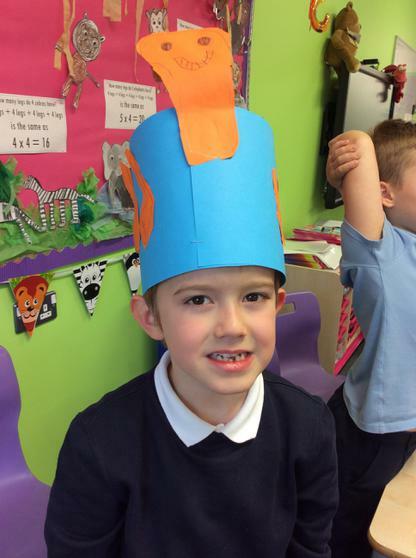 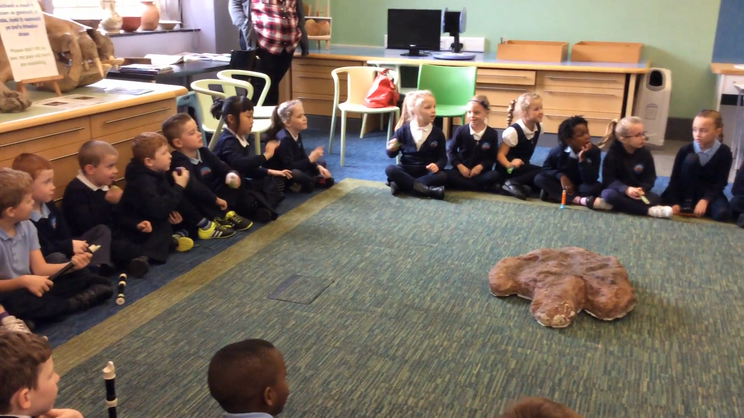 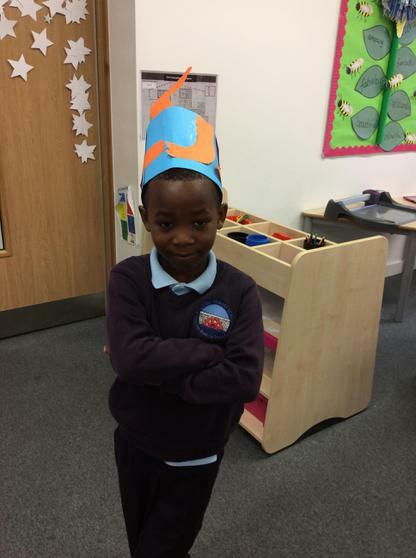 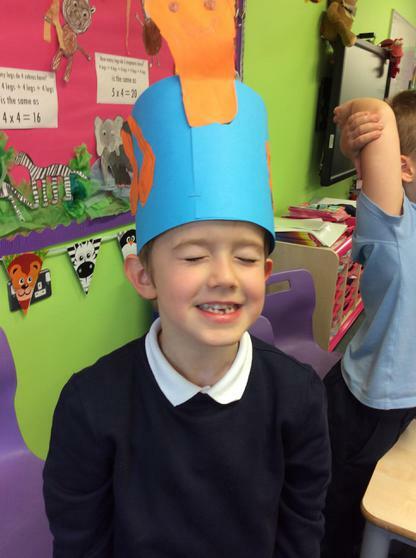 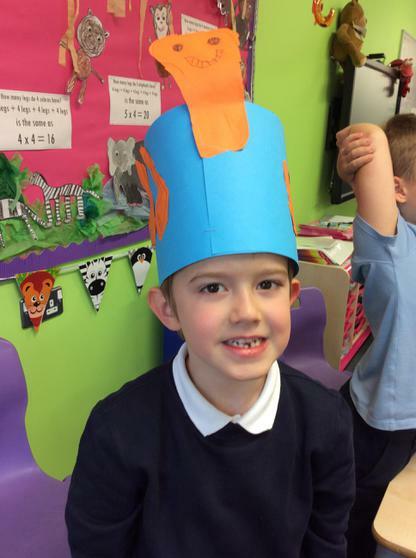 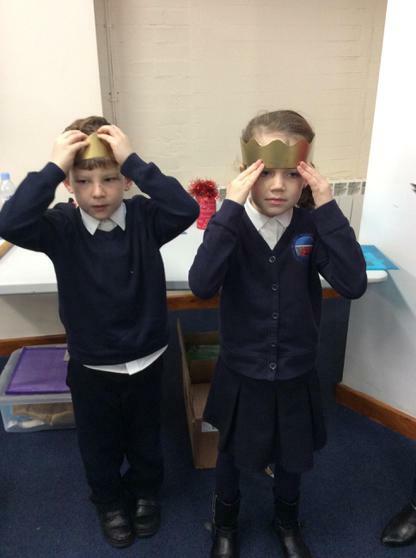 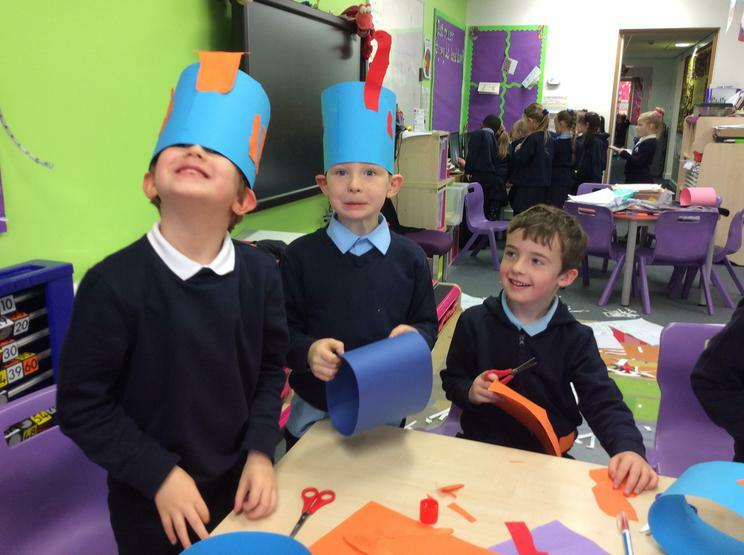 Have a look at our dinosaur hats. 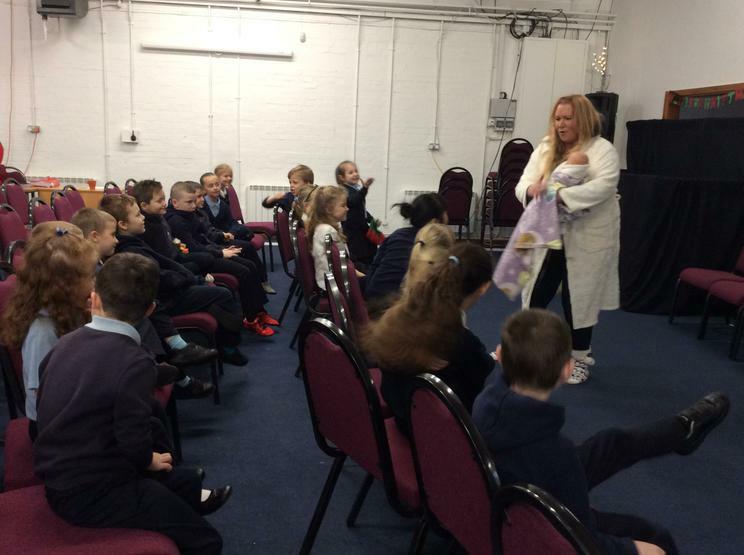 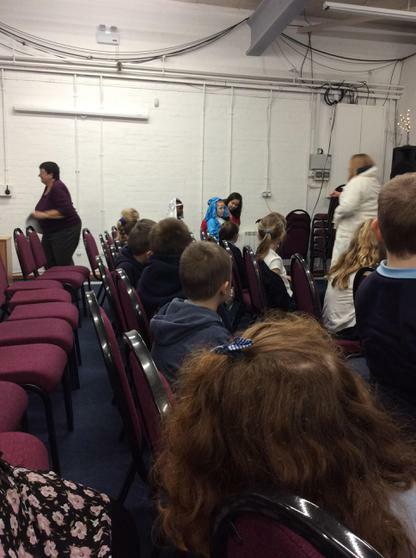 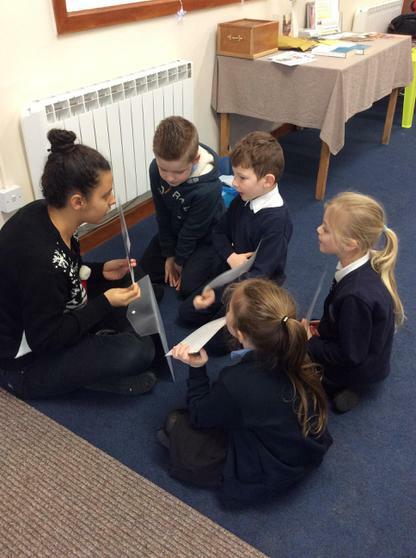 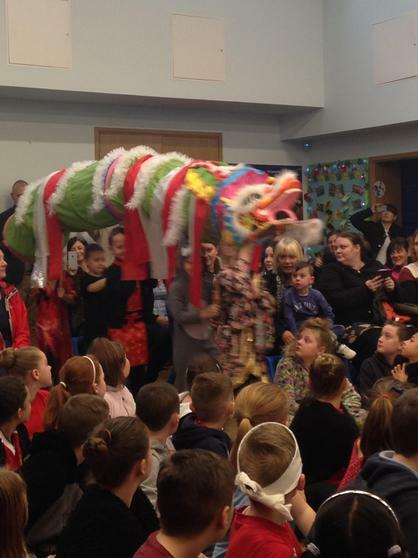 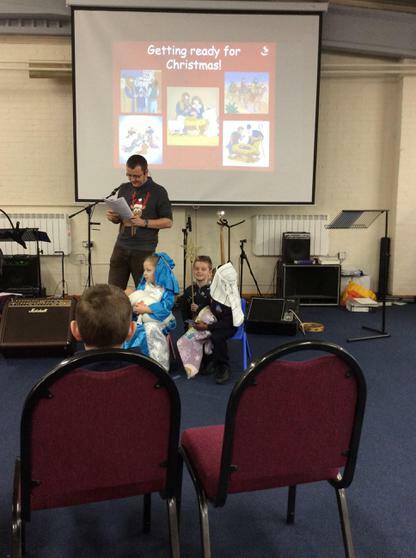 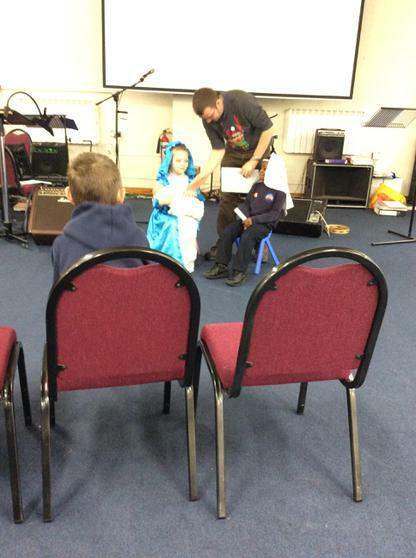 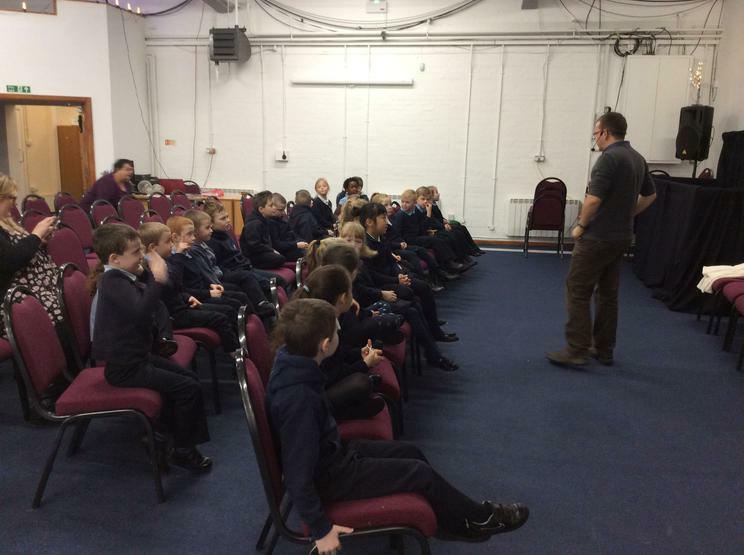 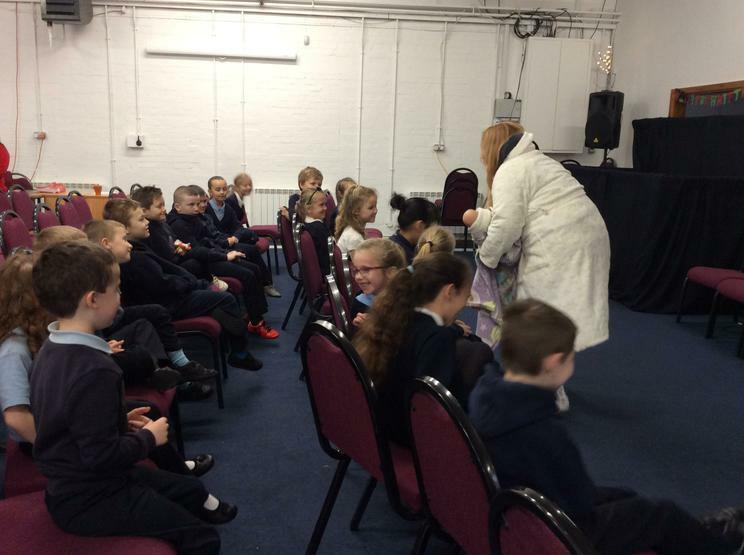 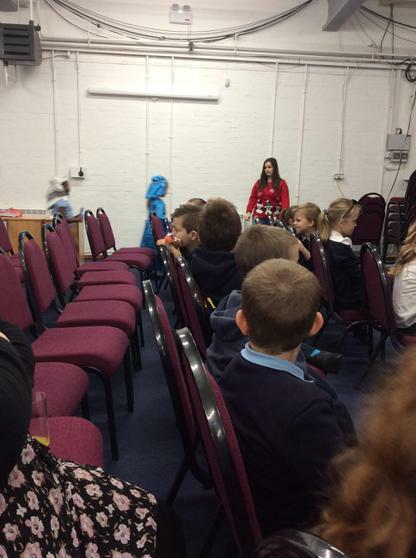 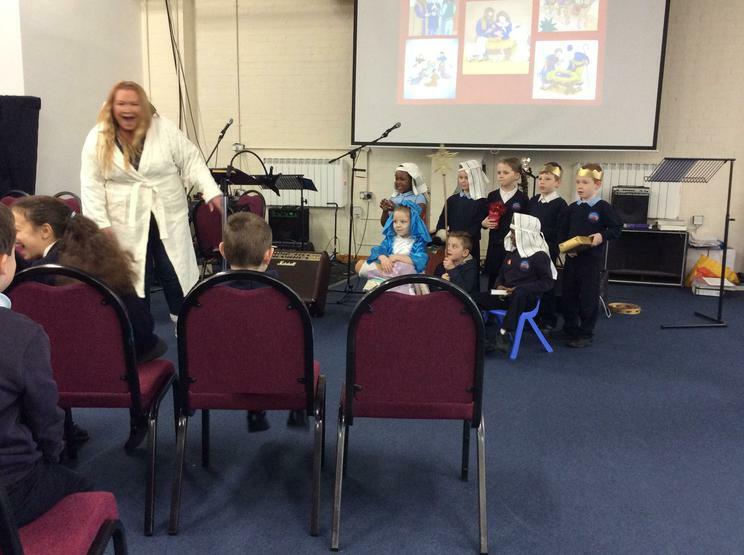 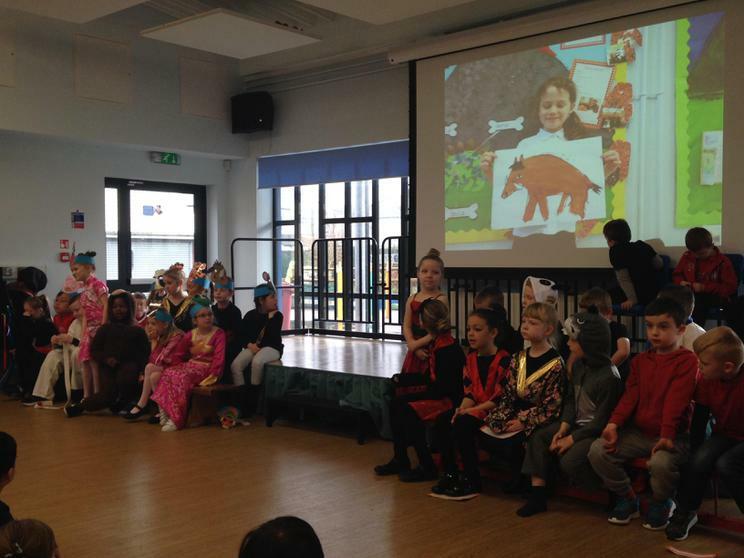 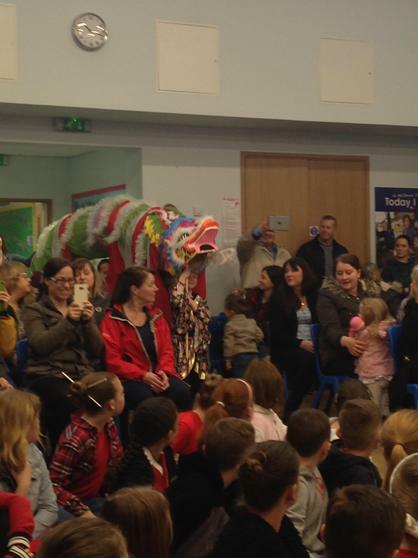 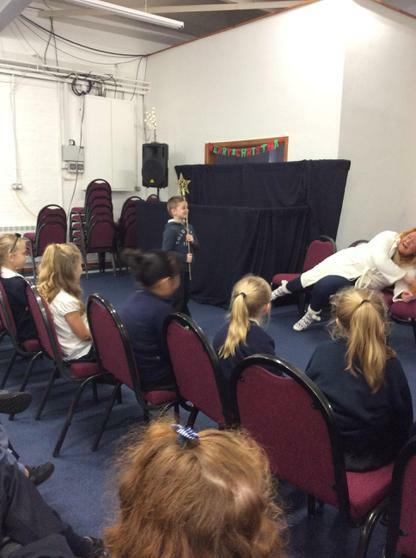 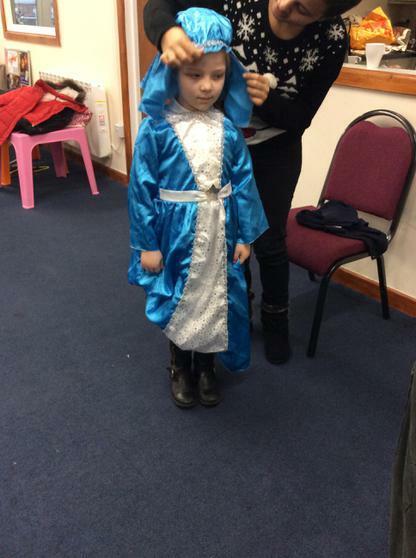 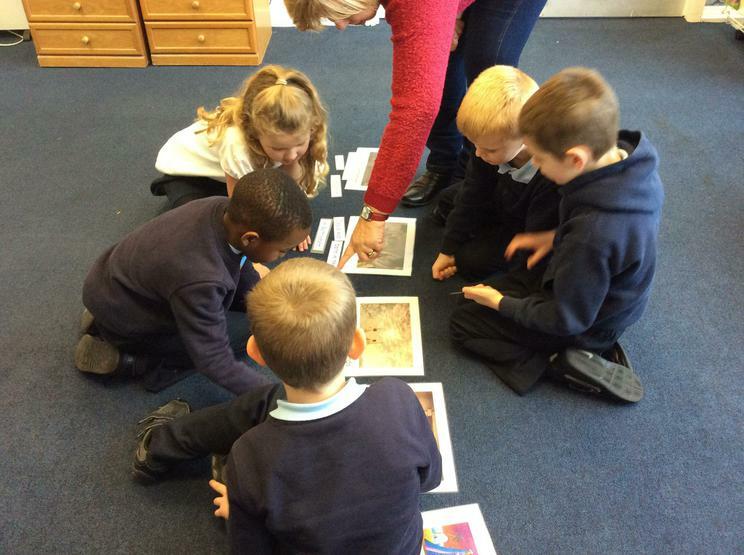 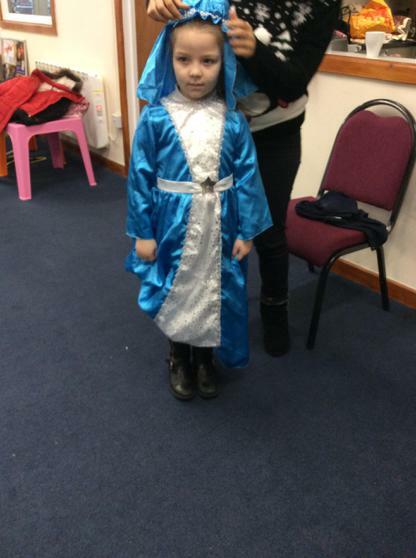 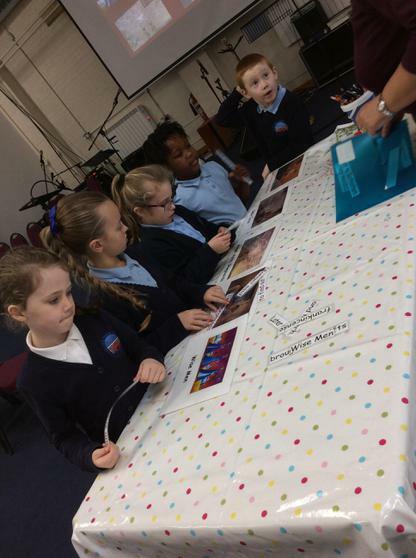 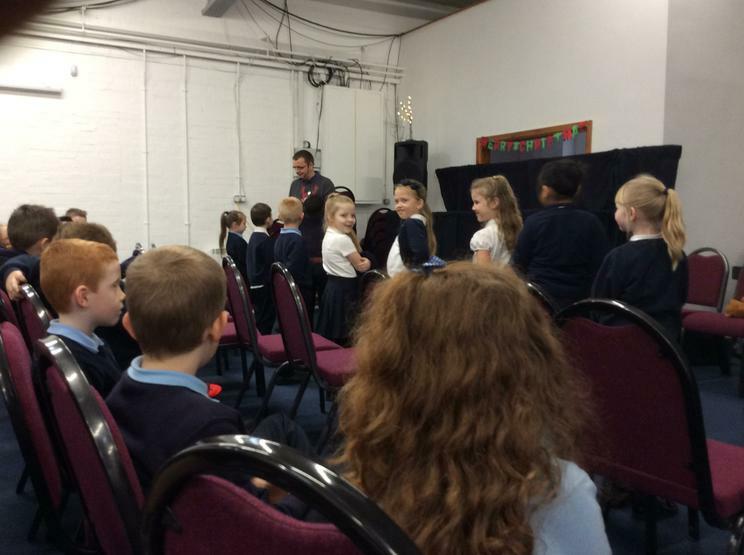 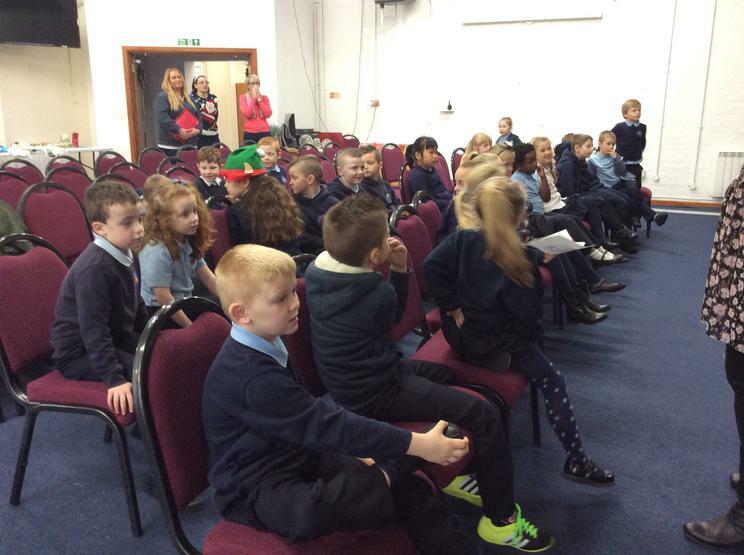 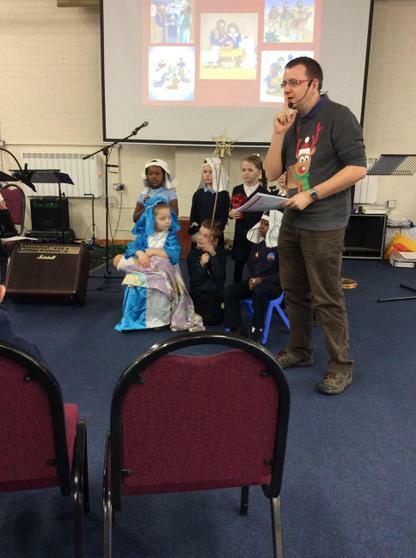 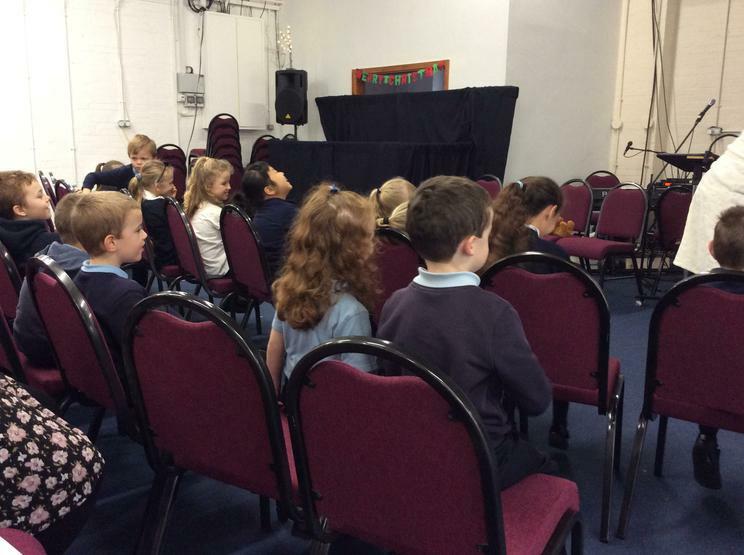 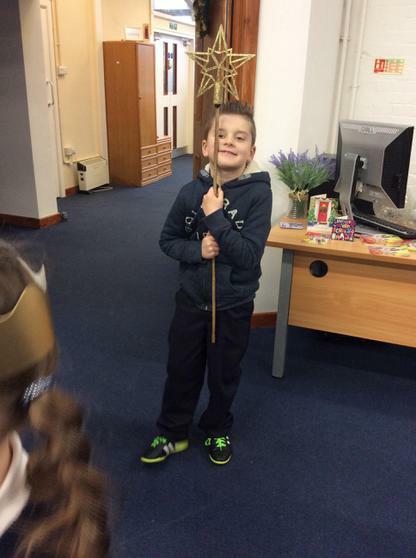 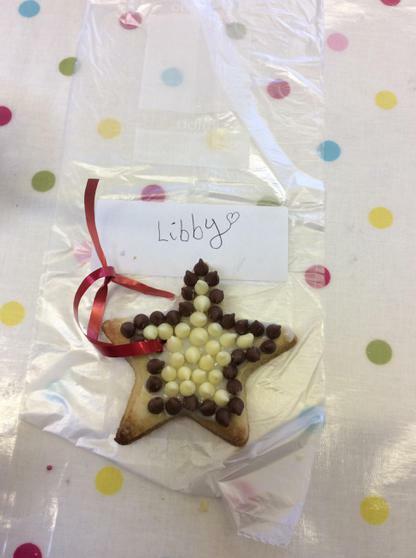 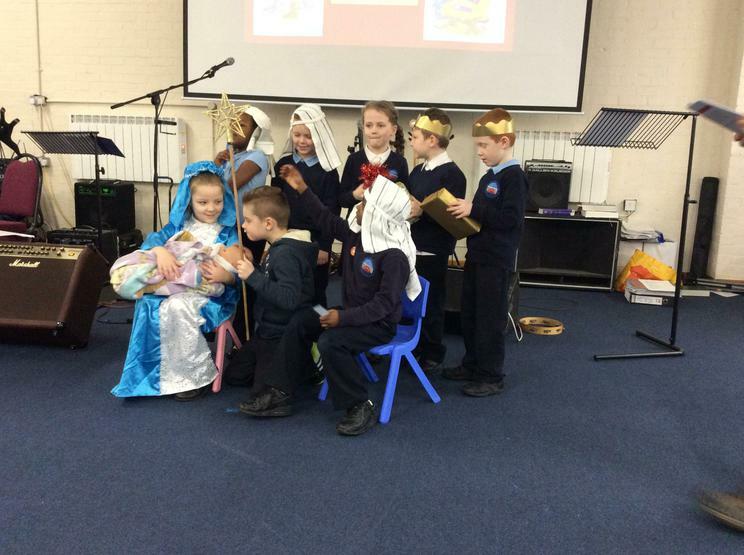 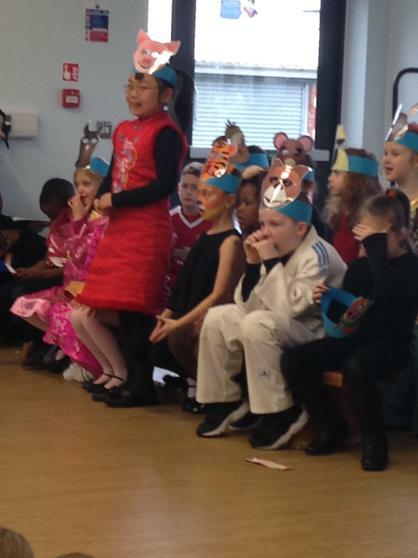 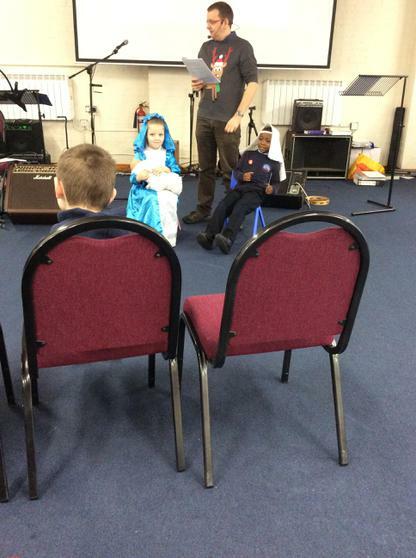 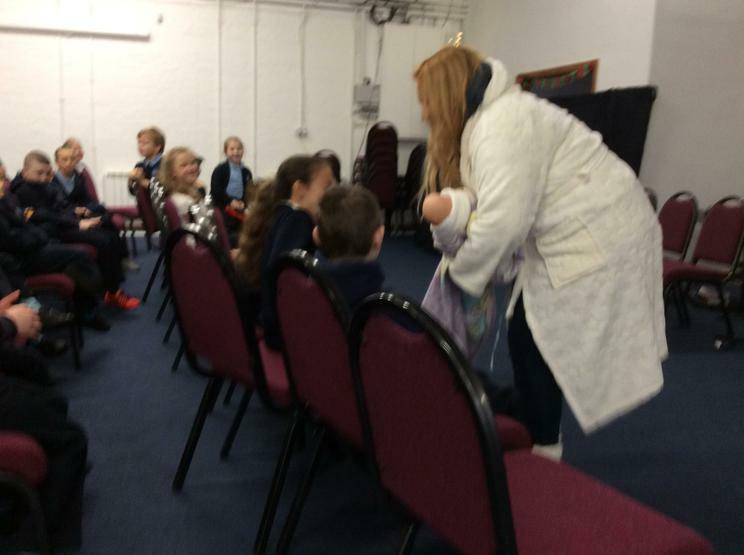 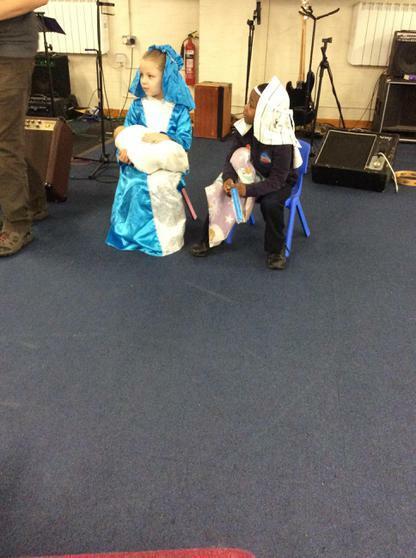 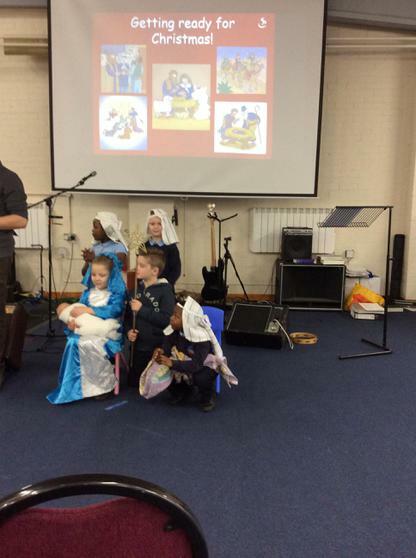 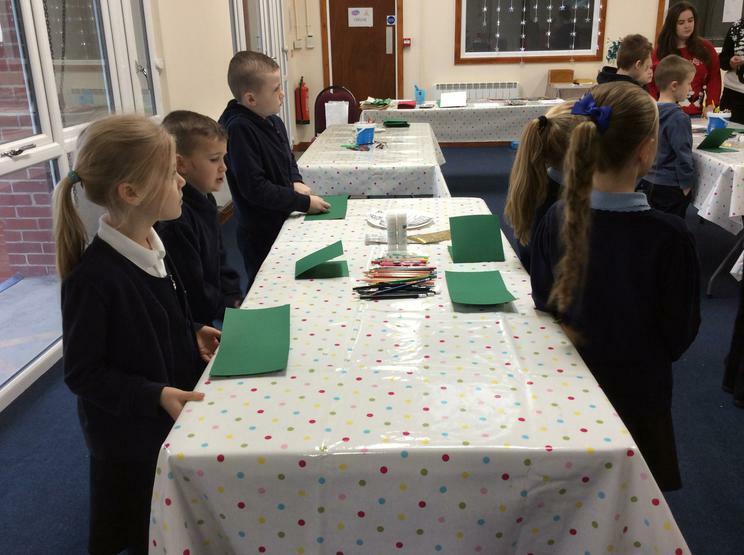 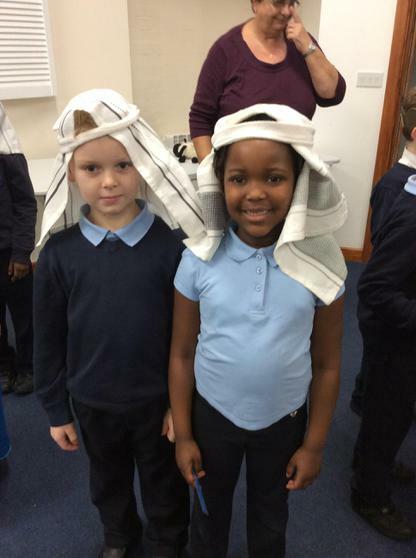 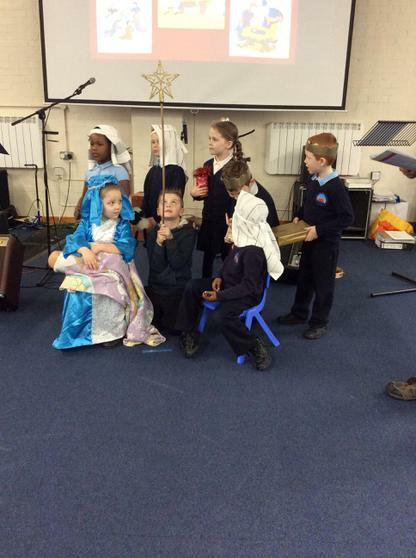 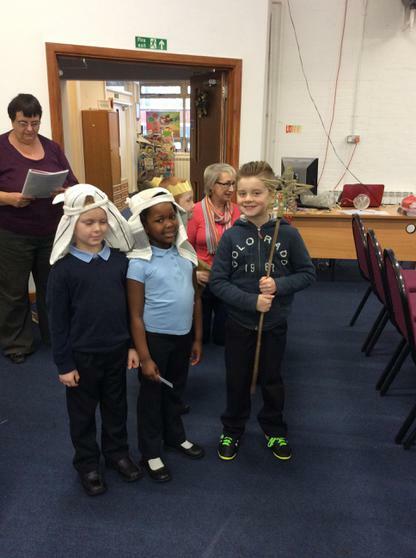 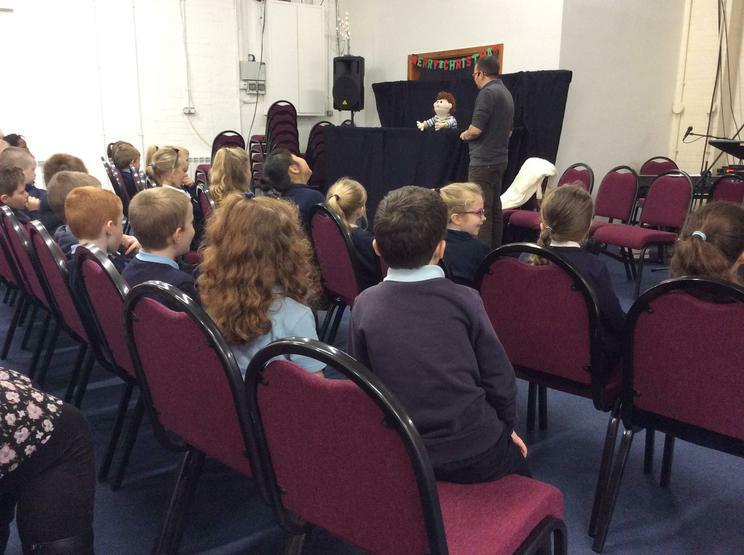 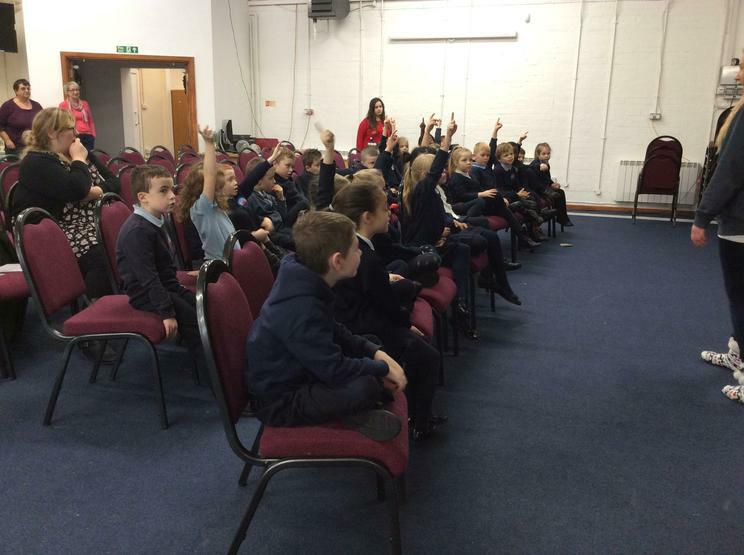 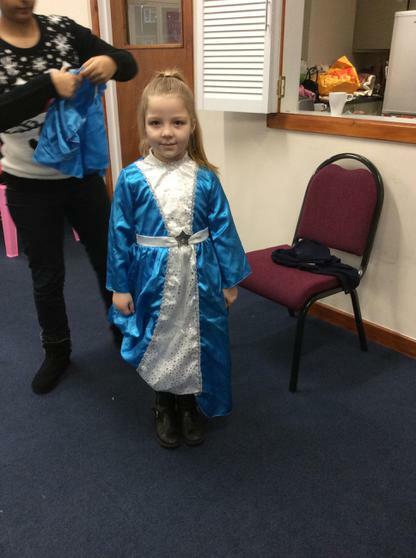 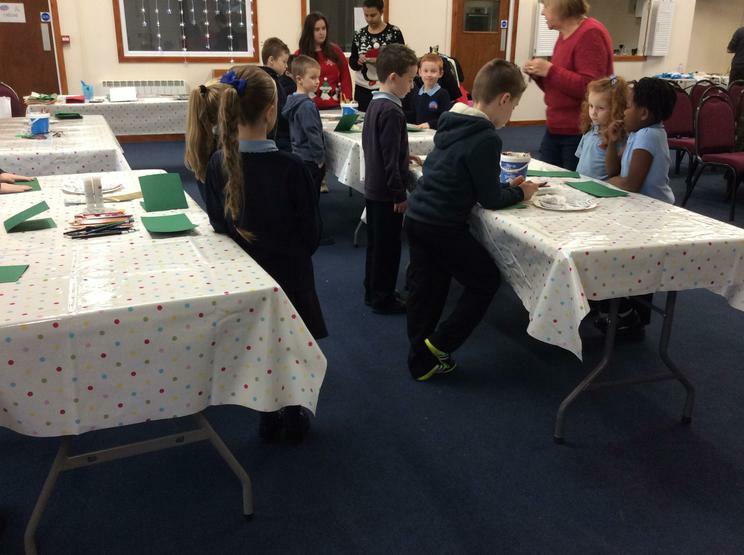 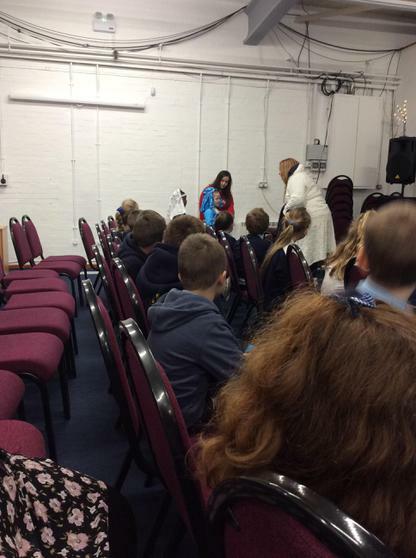 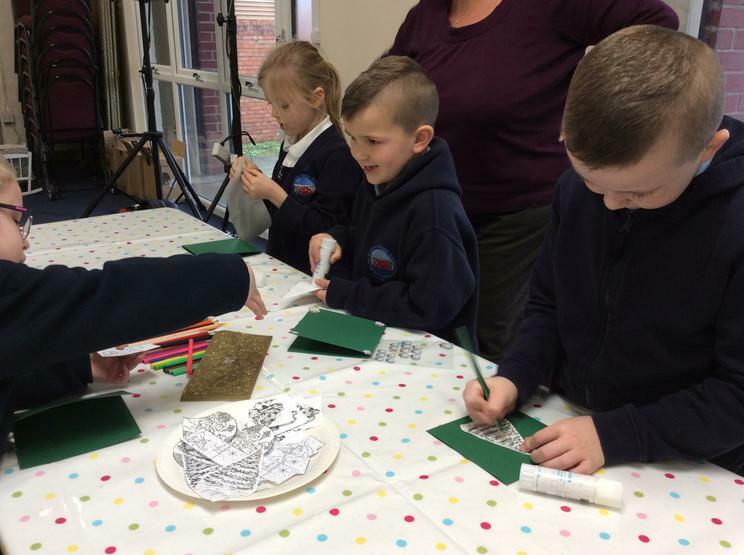 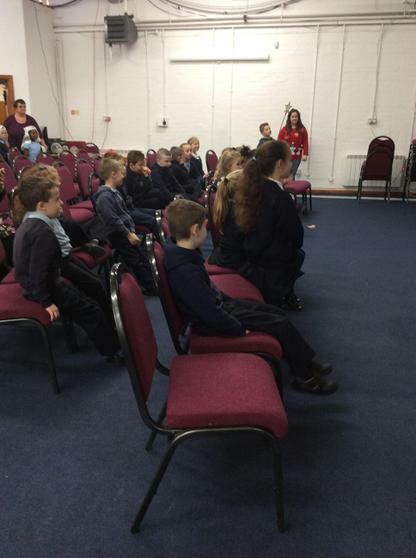 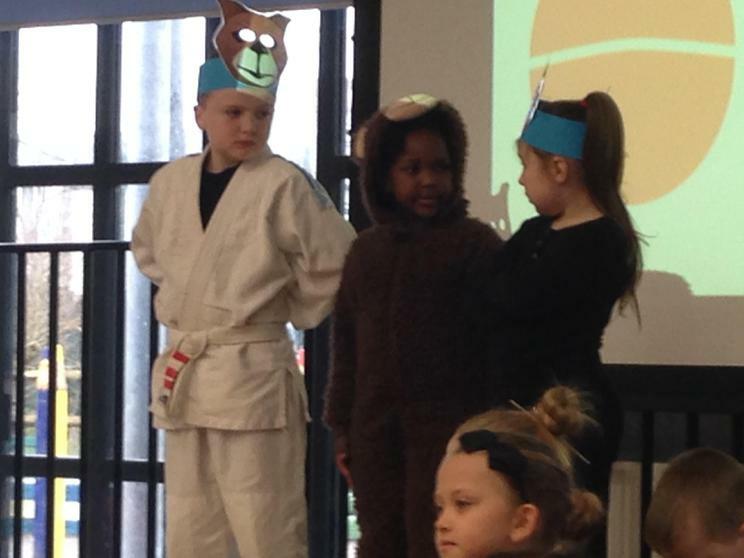 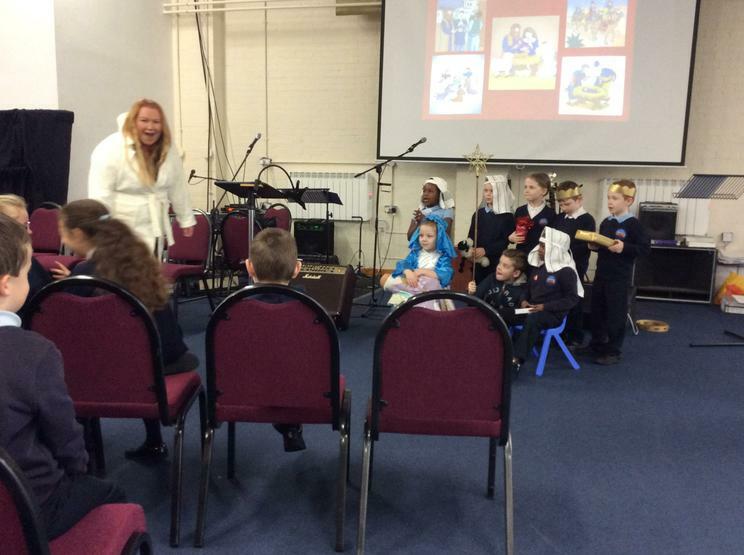 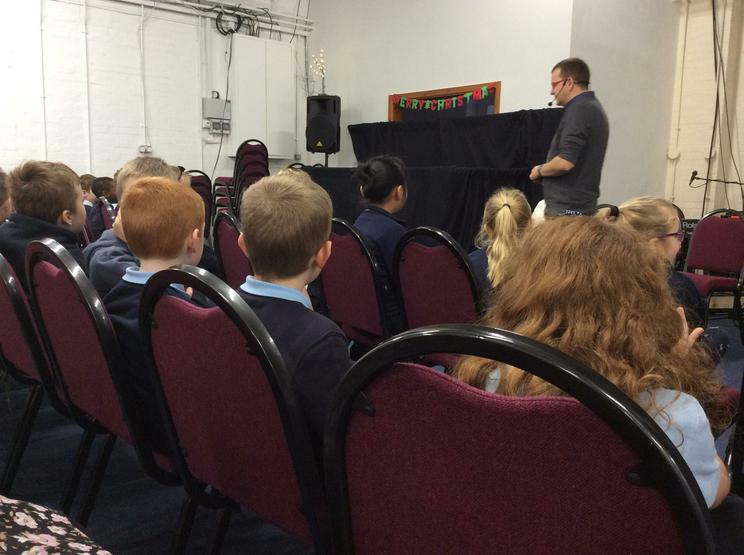 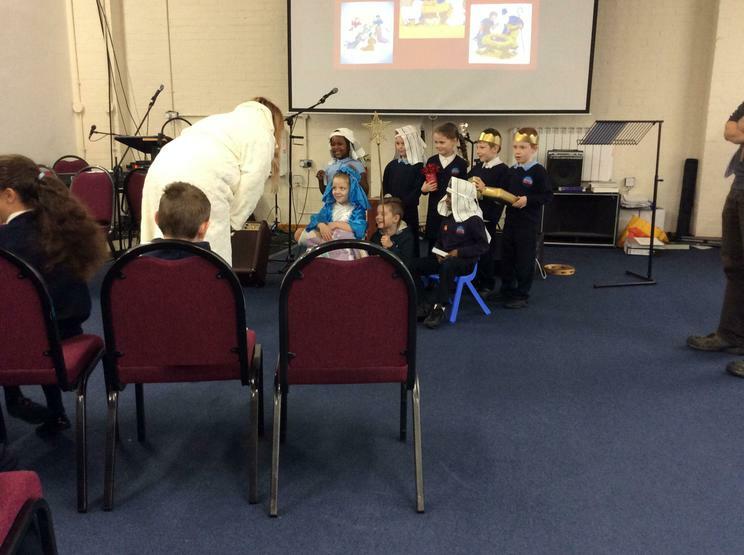 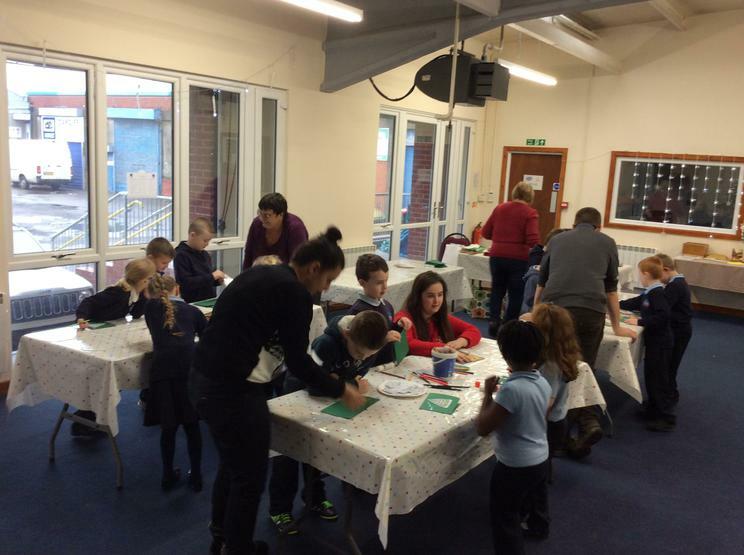 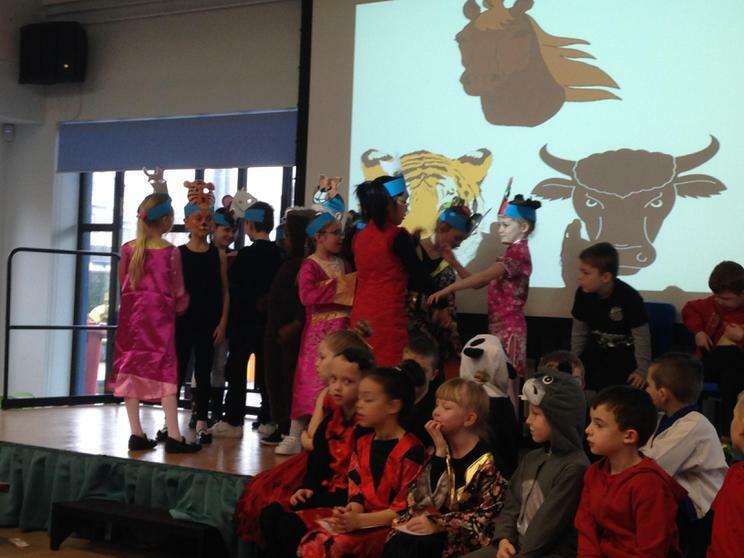 Thank you to all the parents who attended the Year 2 meeting on Monday. 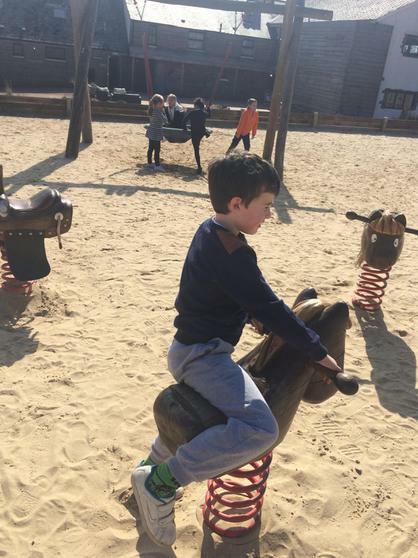 I hope you found it useful. 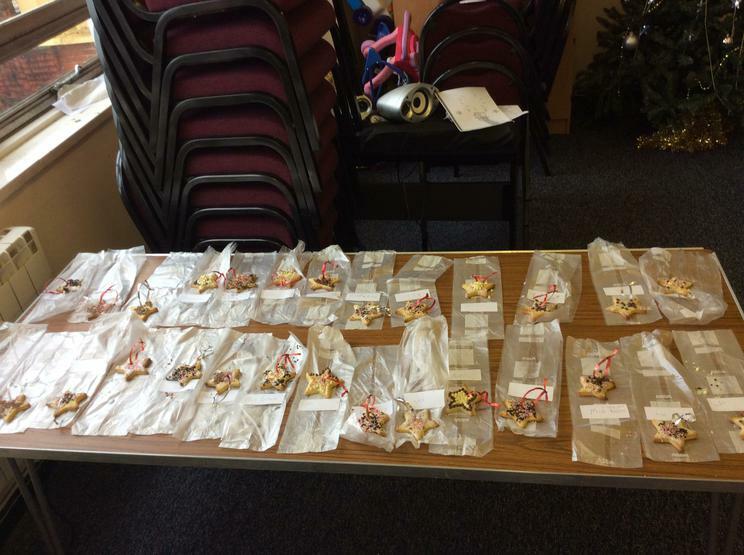 I have attached the handouts for anyone who didn't receive them. 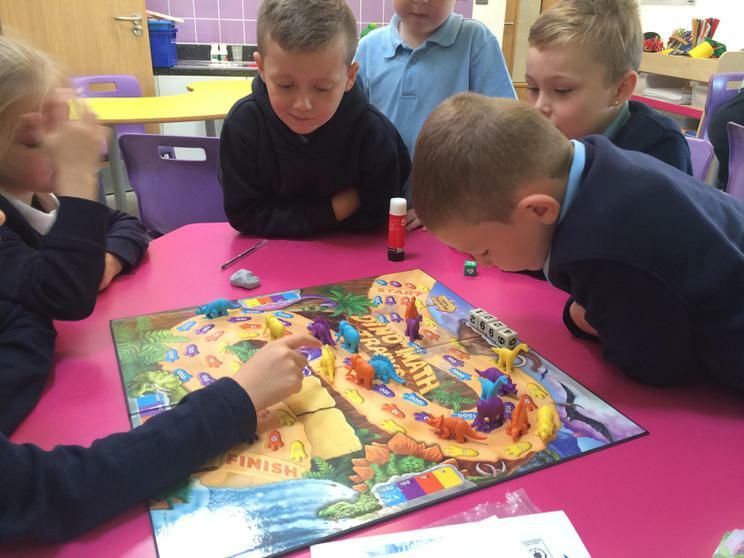 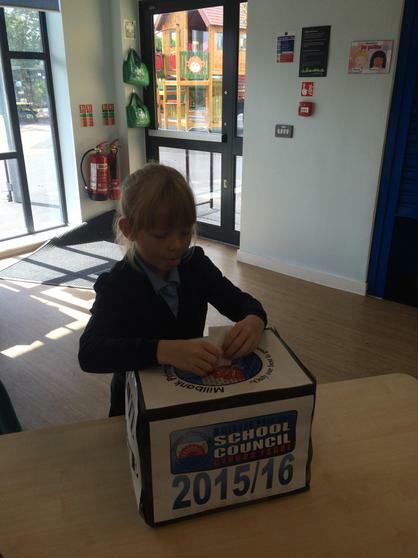 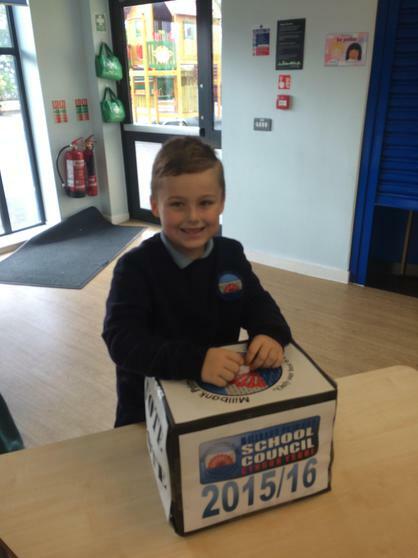 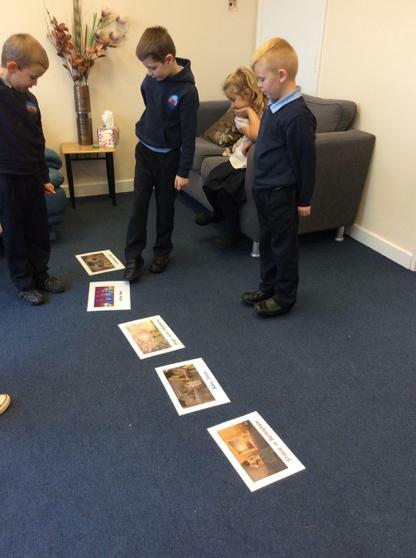 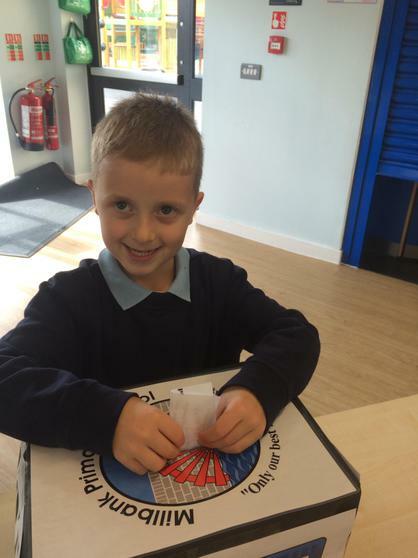 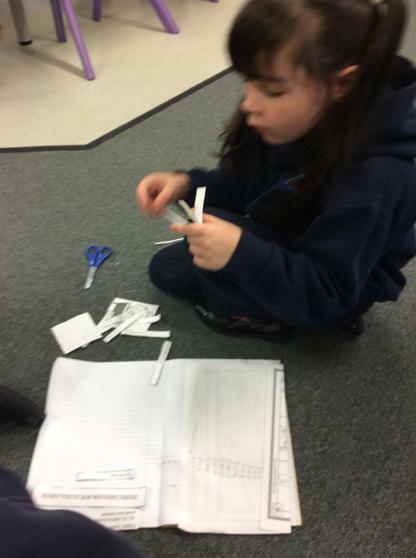 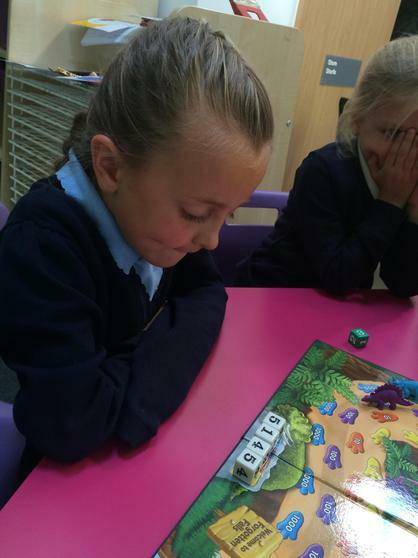 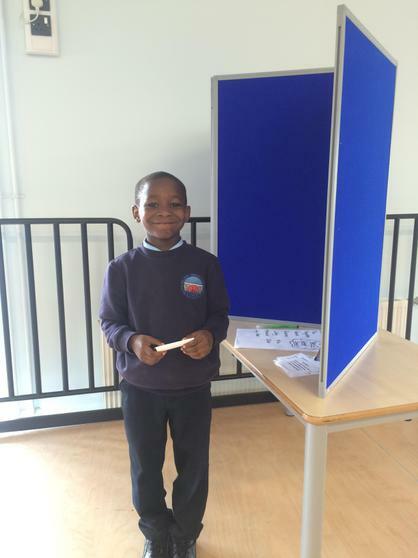 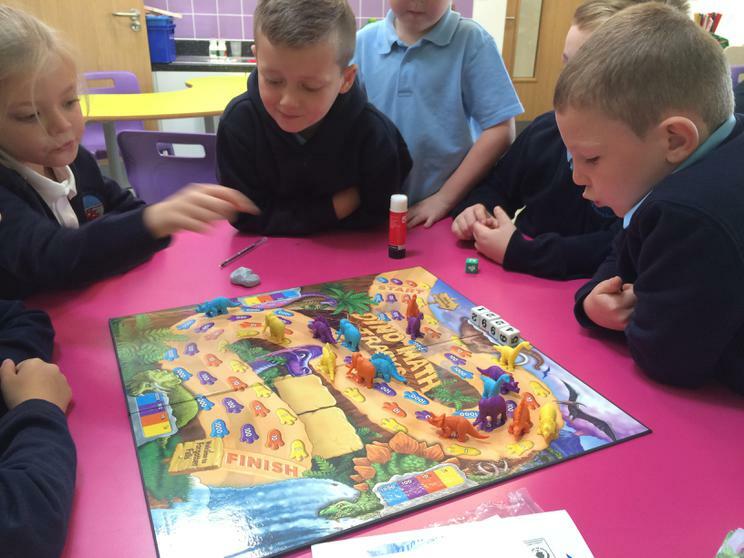 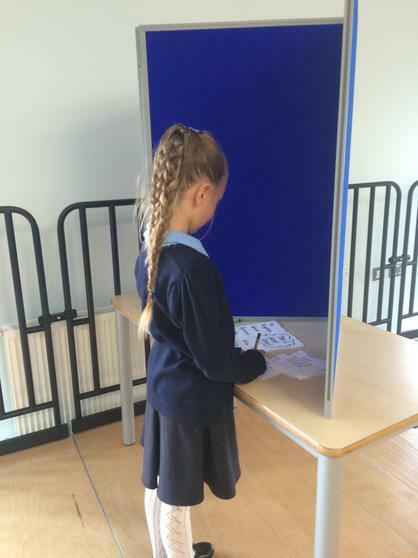 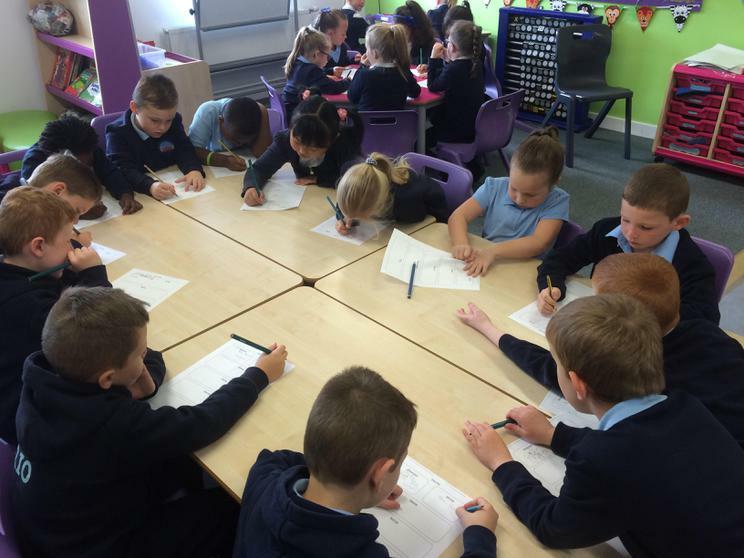 We have been busy playing maths games, writing stories and electing our school council members.